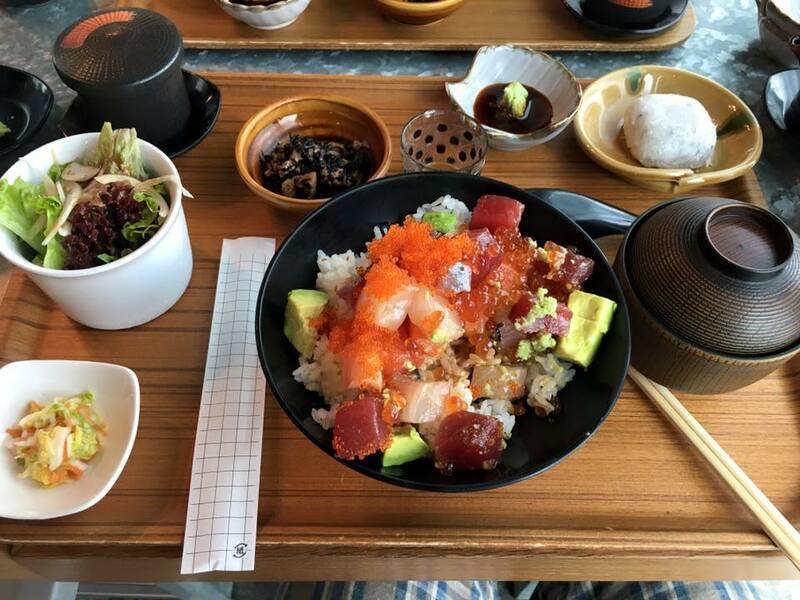 have not gone back to sumiya for a while, forgot how good the bara chirashi don set was for the price. 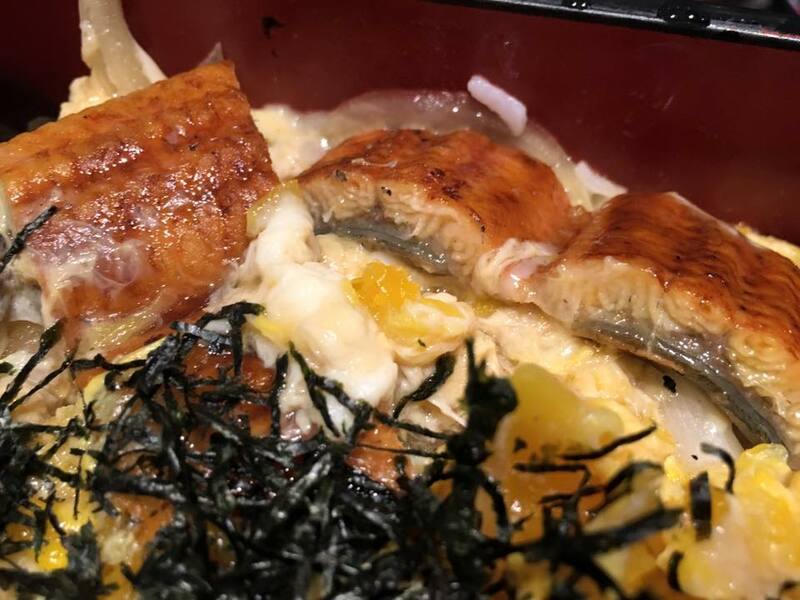 last time i wrote about the bara chirashi don set here was on nov2014. 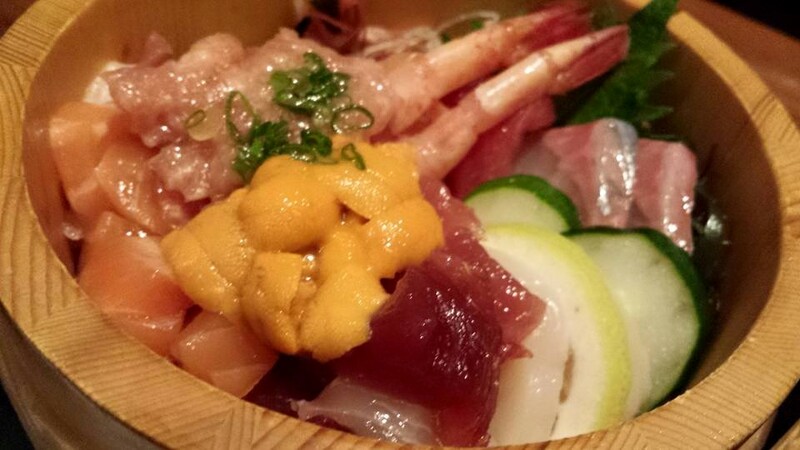 we ordered 2 “mixed bara kaisen don” set @ S$18.80 ea. we asked for sushi rice (there is a note on the menu to say the default is normal rice but you can ask for sushi rice with no charge). it came with appetizer, salad, pickles, chawanmushi, miso soup & dessert. 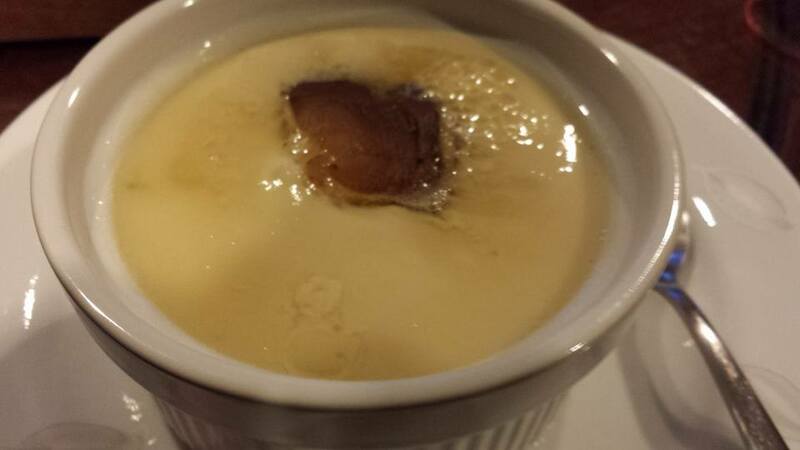 & the mochi dessert was quite excellent! 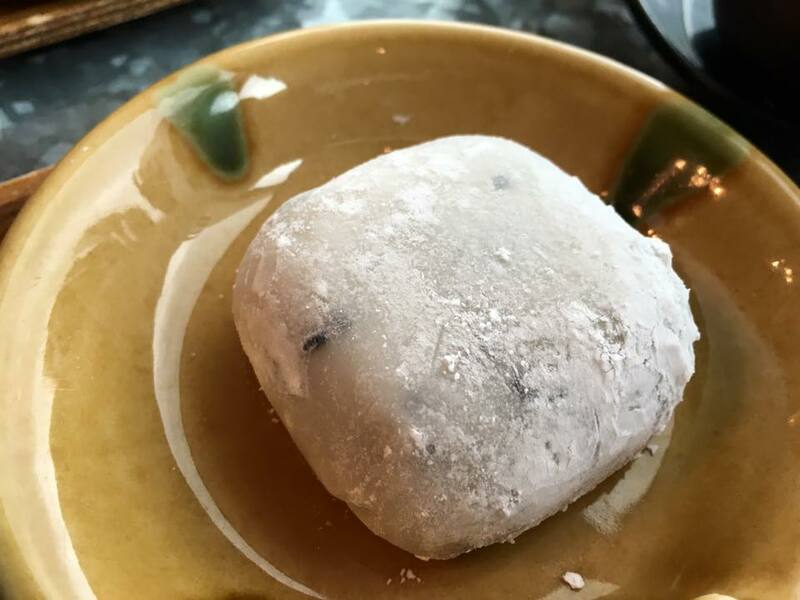 🙂 the mochi dough was soft & perfect mochi texture. 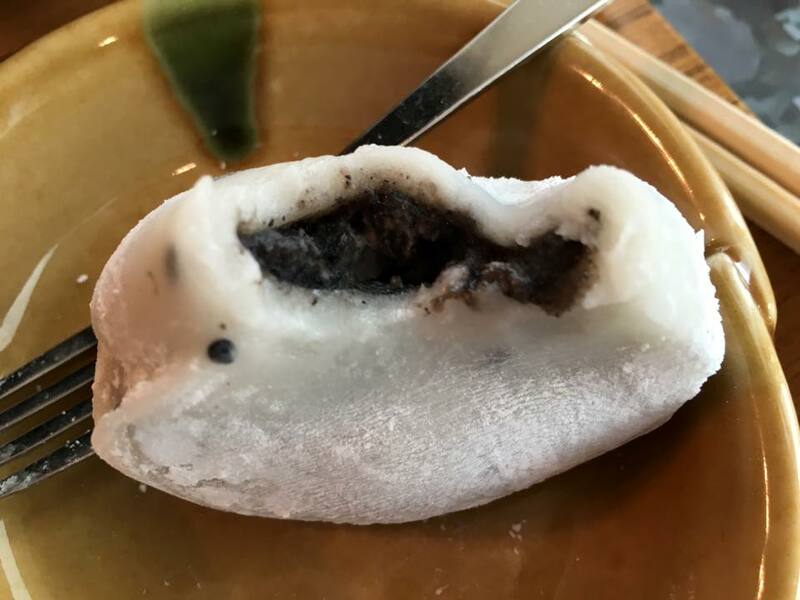 there was another layer of tasty cream inside the bean paste. restaurant is on the rooftop & we were seated by the window, so there was view as well. 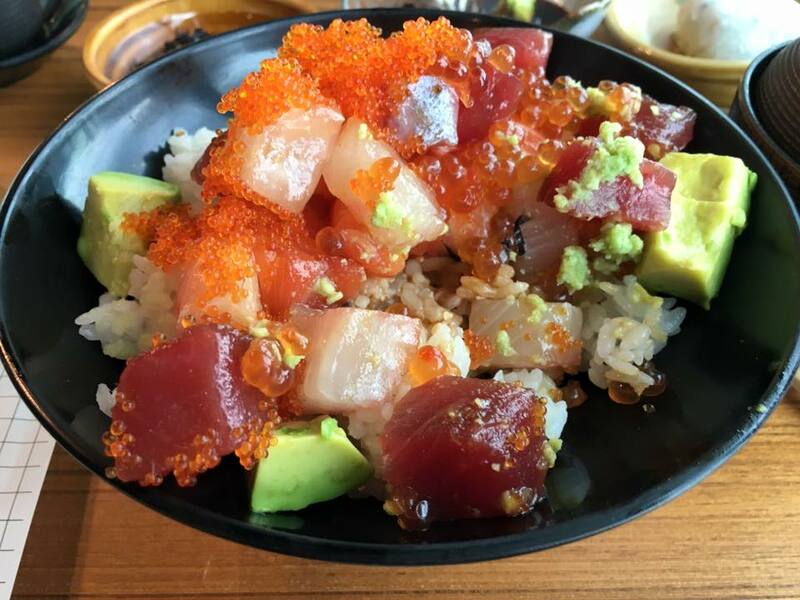 most importantly, the chirashi don was very good. 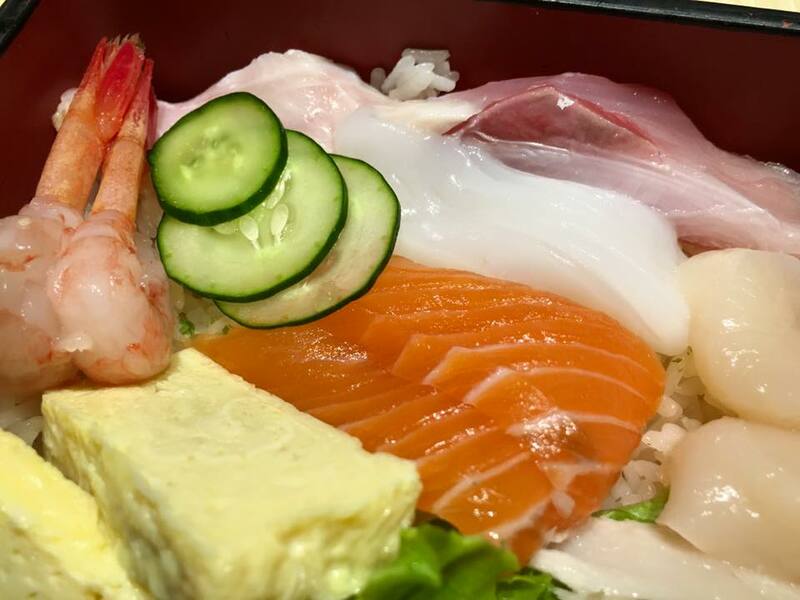 usually bara chirashi don uses small diced sashimi from leftover bits. 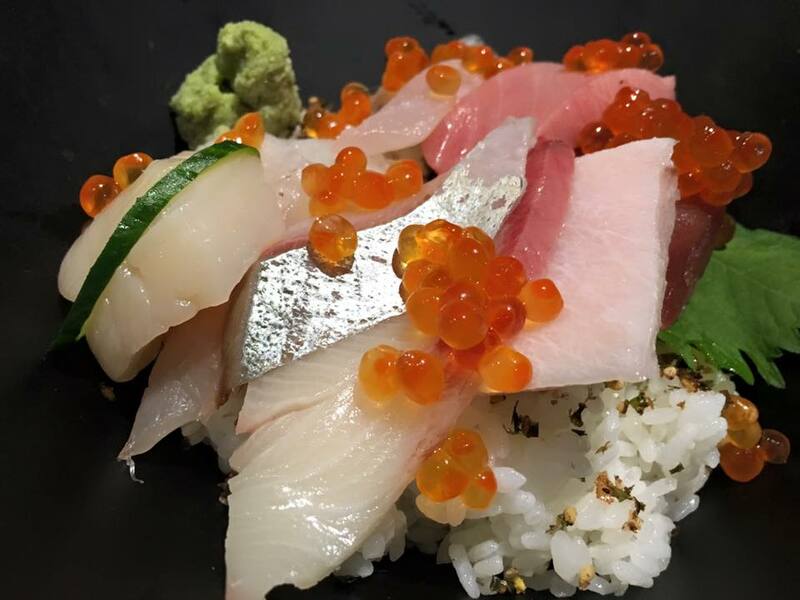 this one here has larger cubes & the sashimi was really fresh & sweet. 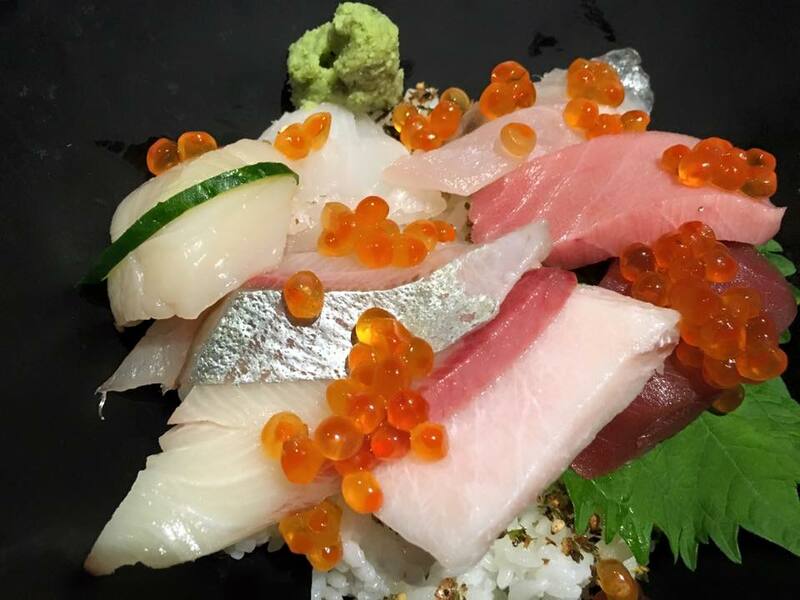 there was no expensive sashimi of course, just salmon, maguro & kajiki, with lots of ikura & tobiko, & avogado. 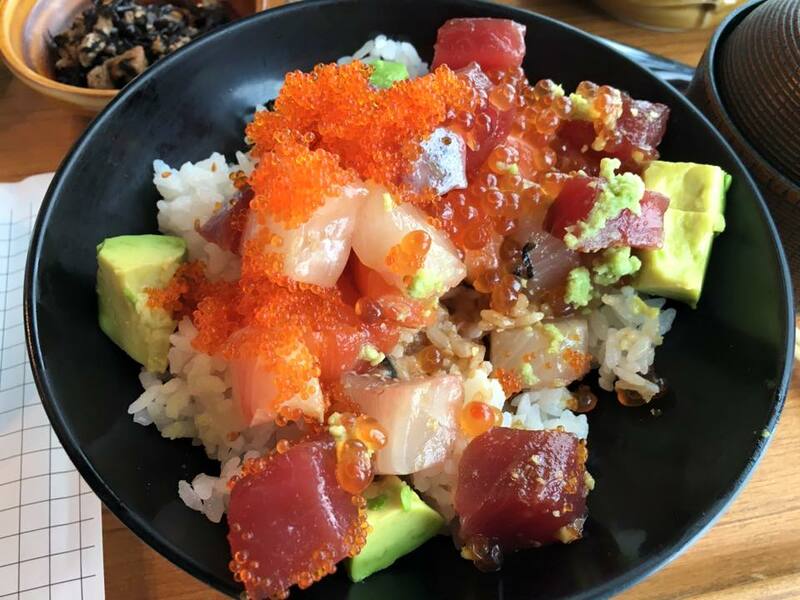 & the sushi rice was great too! 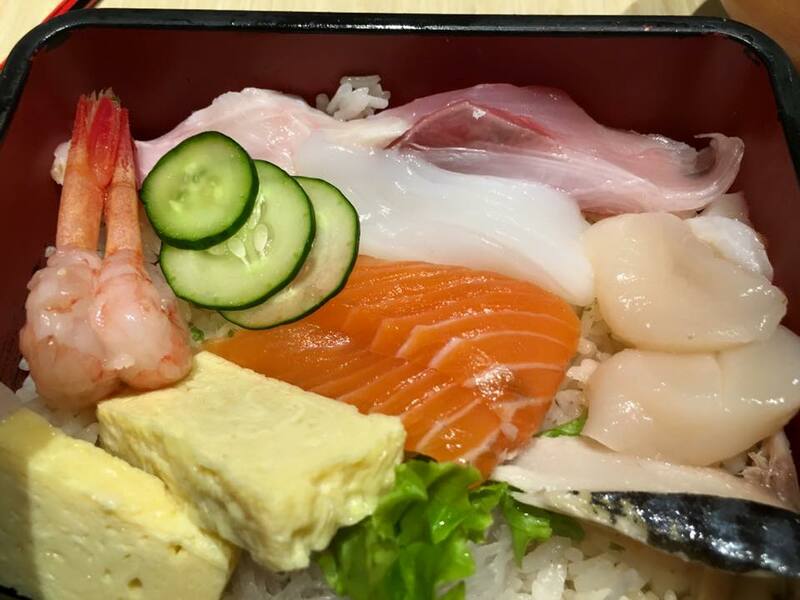 cannot ask more for a S$18.80 chirashi don set. gave me immense thrill & satisfaction. 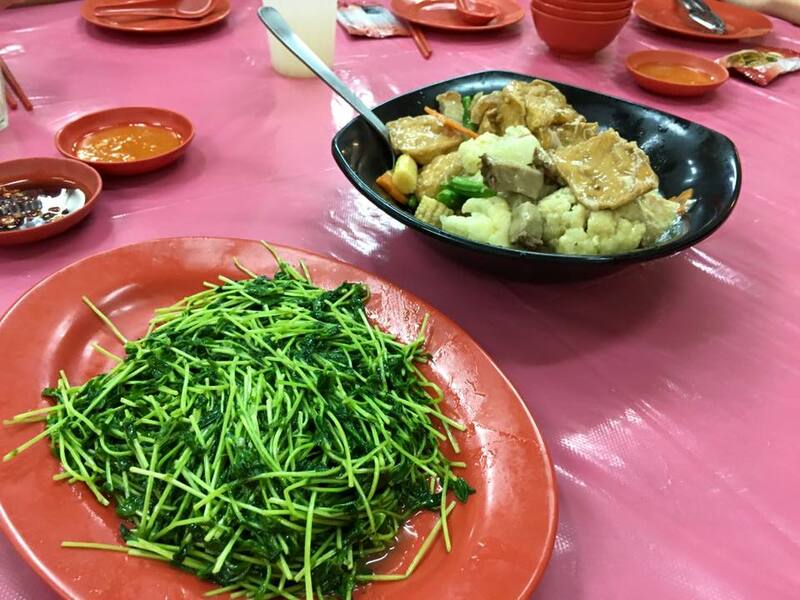 teochew muay dishes are supposed to be cheap food (indeed mostly cheap ingredients). 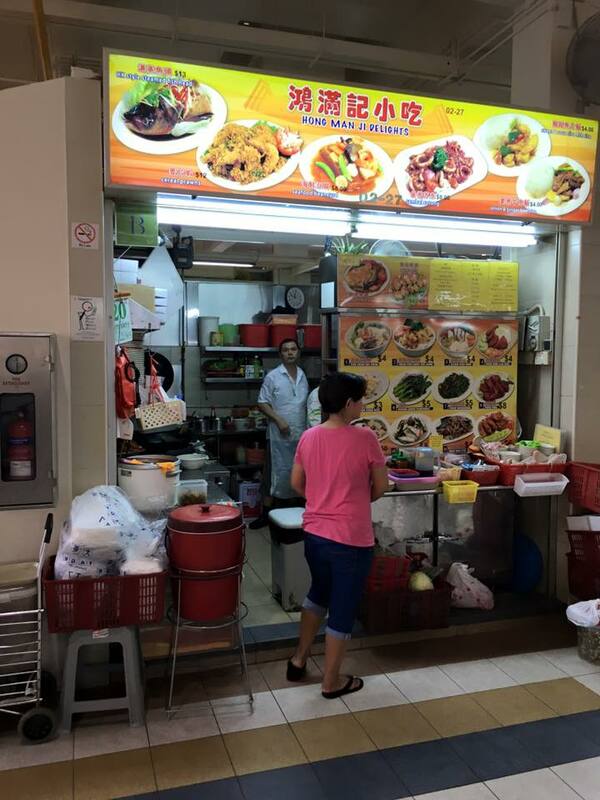 but most teochew muay are not cheap, mostly overcharged for quite poor quality food. 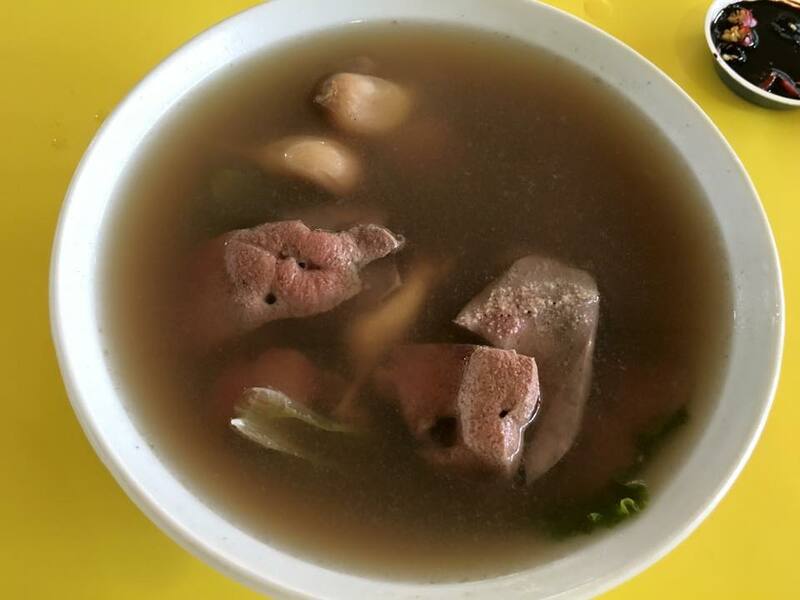 anyway i got inspired to try out teochew muay dishes. 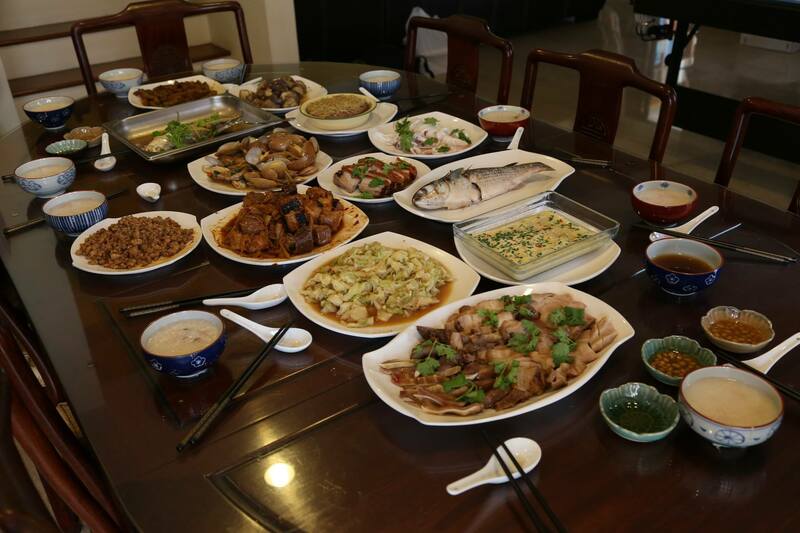 for this lunch i put out 15 teochew muay dishes + 1 banoffee (banana toffee) cake. 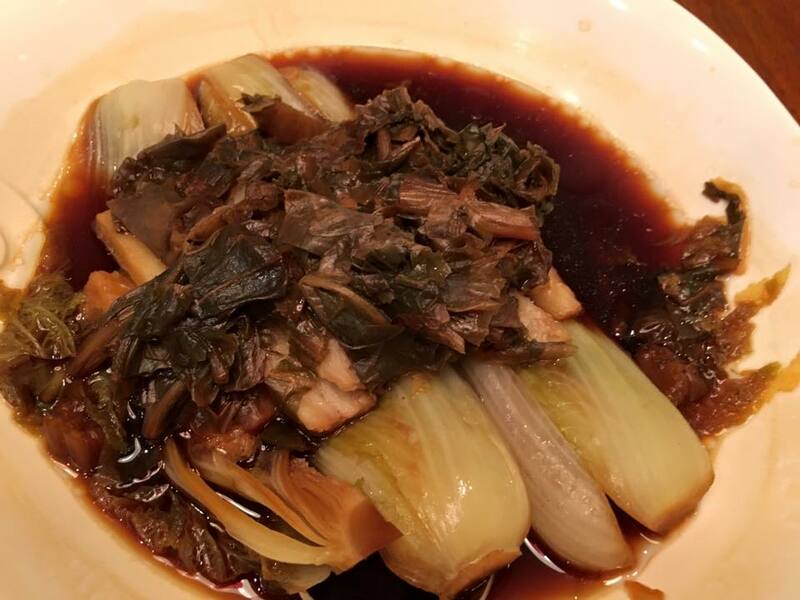 a friend brought his famous” sio bak烧肉. i did not put out all as we had a lot of dishes, so i was enjoying the remaining very much afterwards. 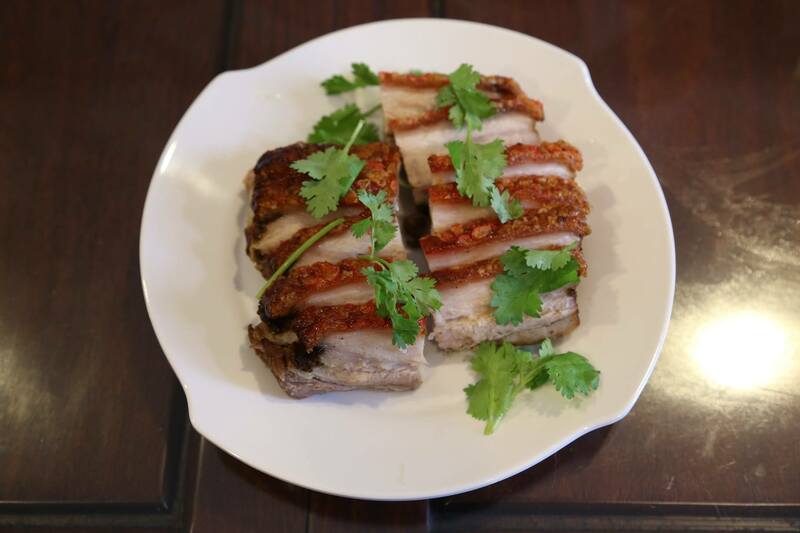 it was really good – the texture & flavours were just “oomph”, though today the crispy skin was not his usual standard. 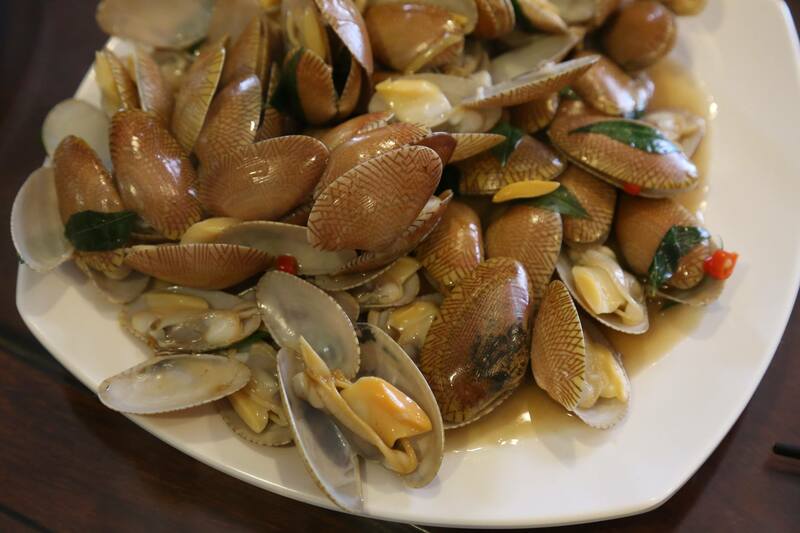 my most popular dish was the #1 stir-fried manila clams with curry leaves! 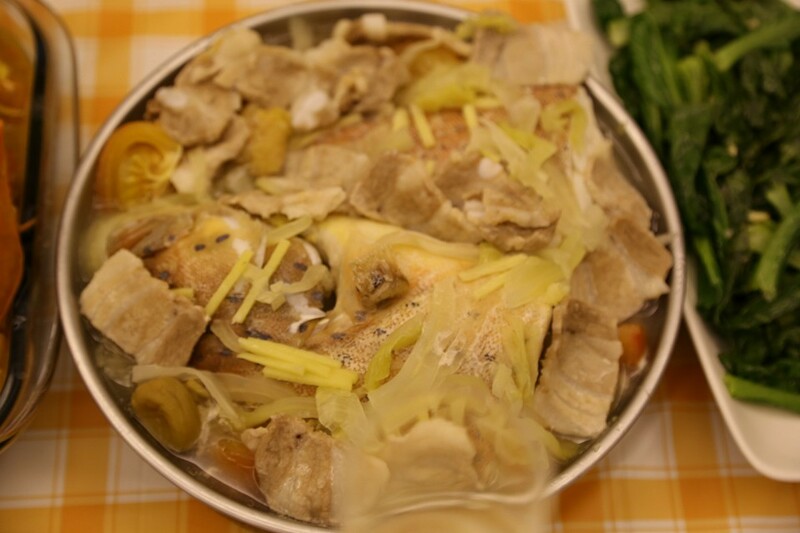 the #7 steamed yellow croaker 小黄鱼 was a top dish for many friends. 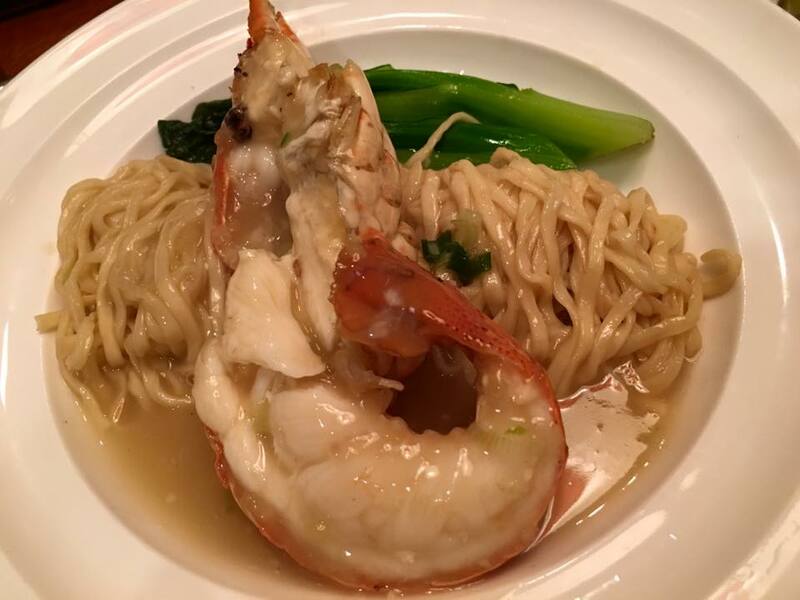 this is a variation of the hk steamed style. 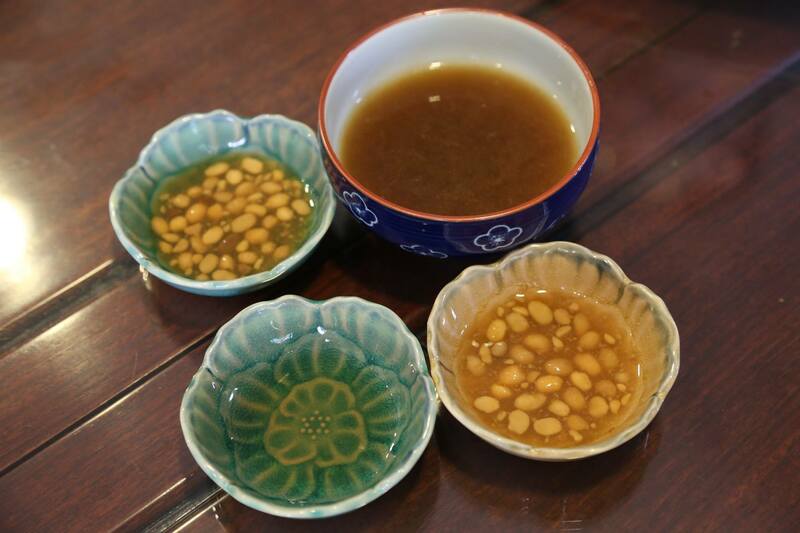 i think light soy sauce is excellent for steaming fish, very pleasant taste. anyway i did a variation using tsuyu, mirin & olive oil. 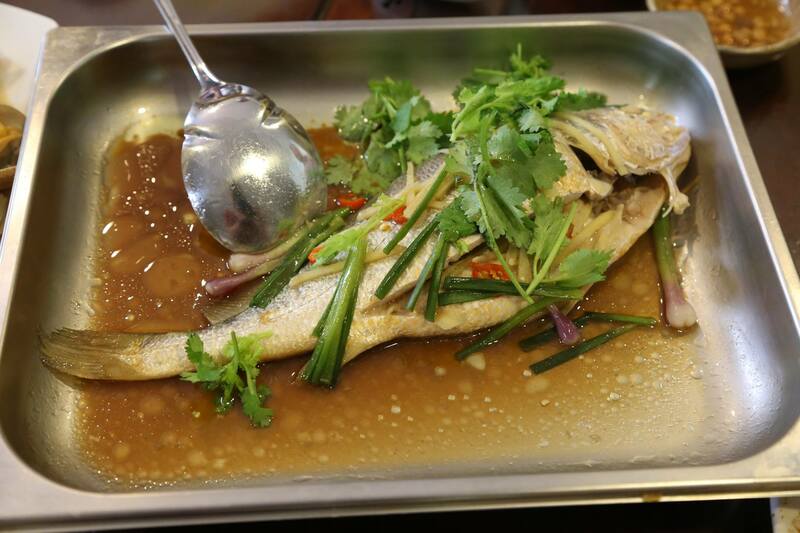 fish was so fresh of course, and fine tasting texture, and the sauce was just awesome! 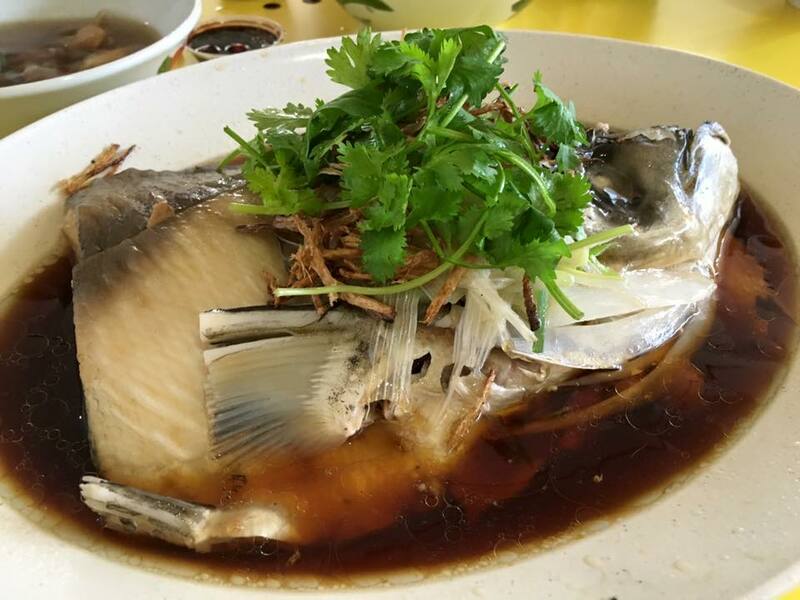 the #5 teochew chilled mullet was as good as any of the teochew muay stalls or bakuteh stalls that sell chilled mullet (like lau ah tee). 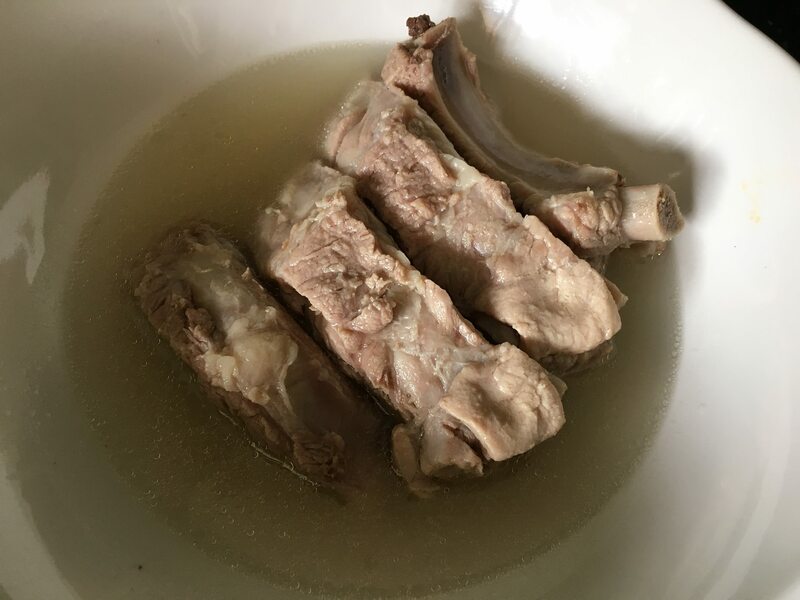 one differentiation was that i steamed with the scales on, so that the skin came out easily with the scales, whereas many of the teochew muay stalls here steamed w/o the scales & that makes it difficult to tear the skin when it is chilled. 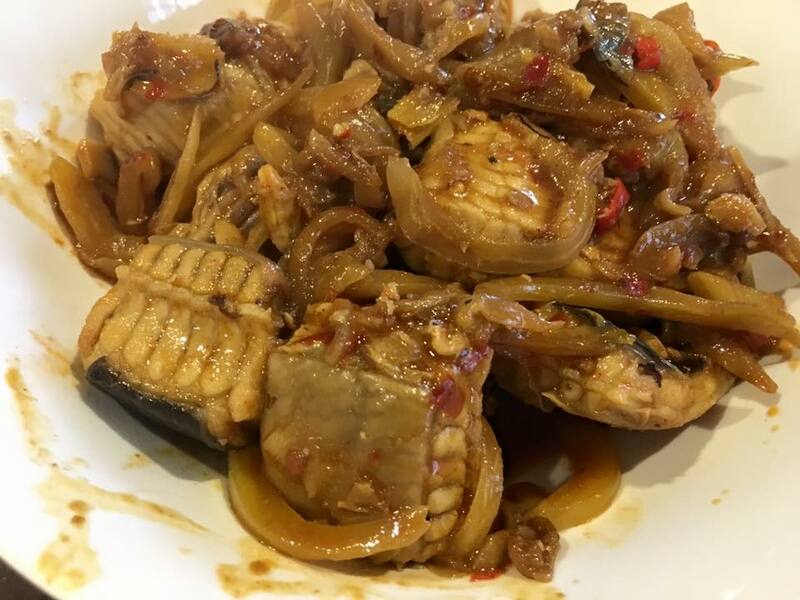 #6 teochew chilled sotong – sotong texture was superb! 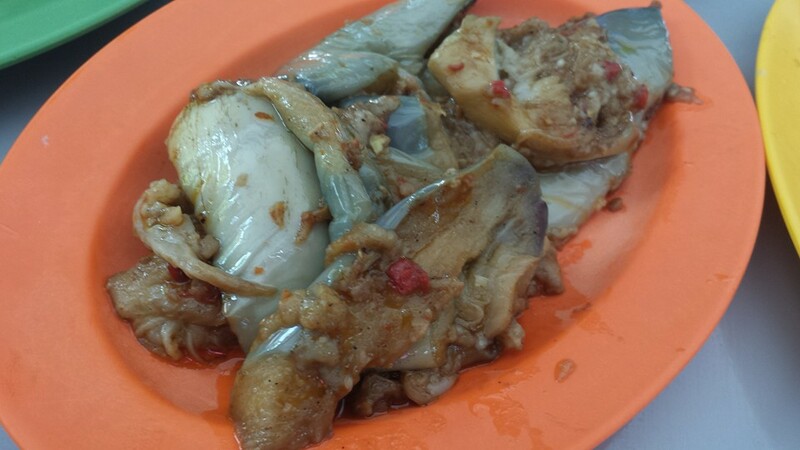 the #6 teochew chilled sotong texture today was superb! & so sweet. 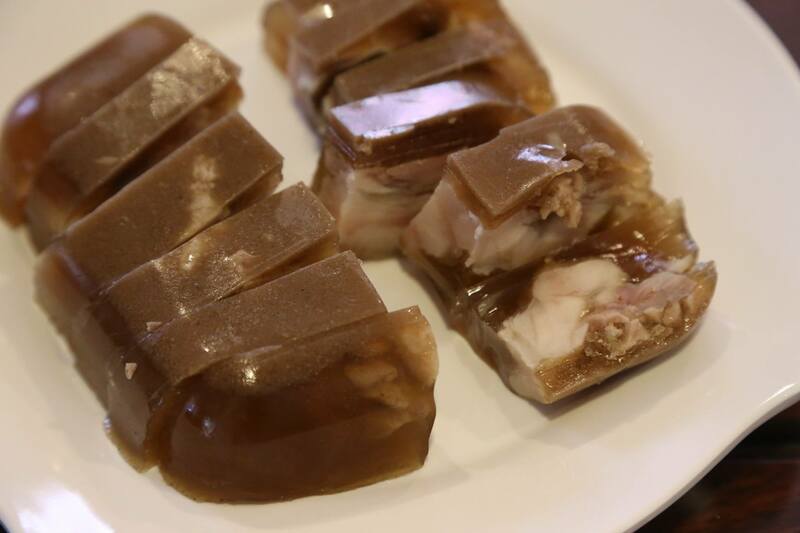 the braising sauce jelly was so tasting, the clear light colour with fat removed was just perfect, and the texture of the pig’s heat meat was perfect too, great bite! 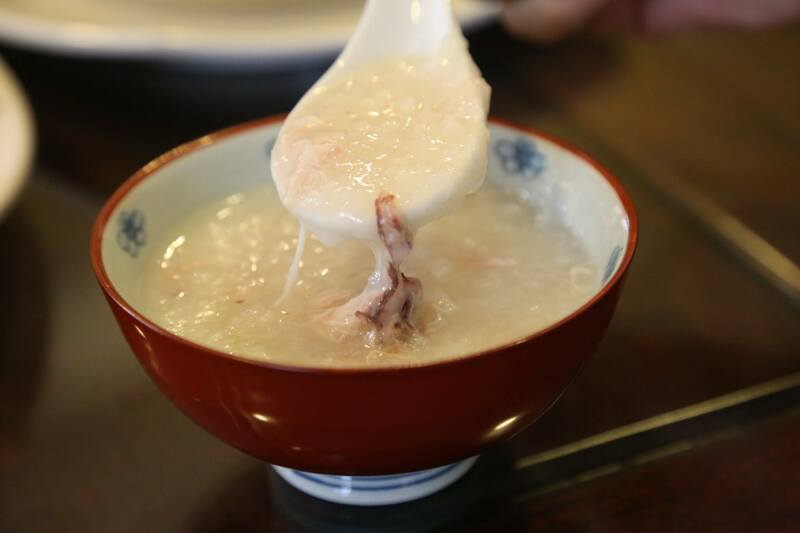 well nearly the standard of chui huay lim! 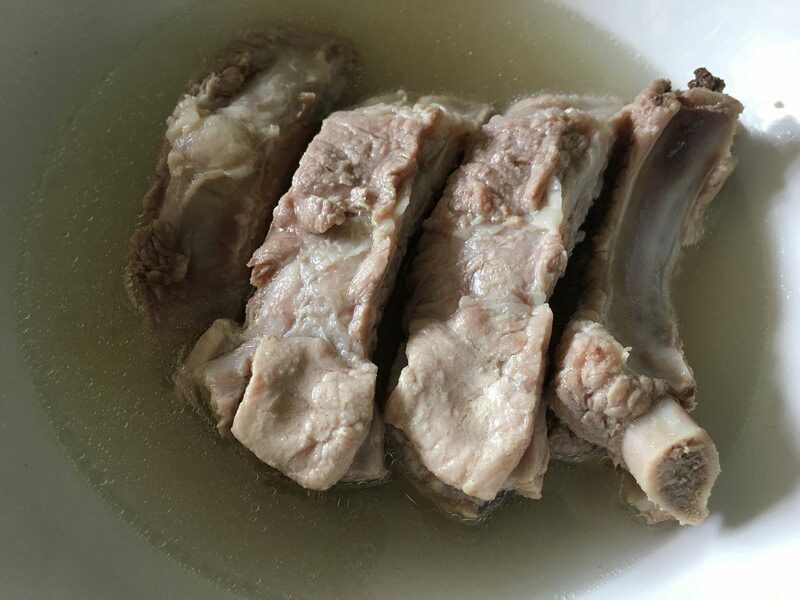 the braising sauce was so flavourful (i will post another recipe update later), and the meat texture were just incredible, tender yet crunchy with nice bite. 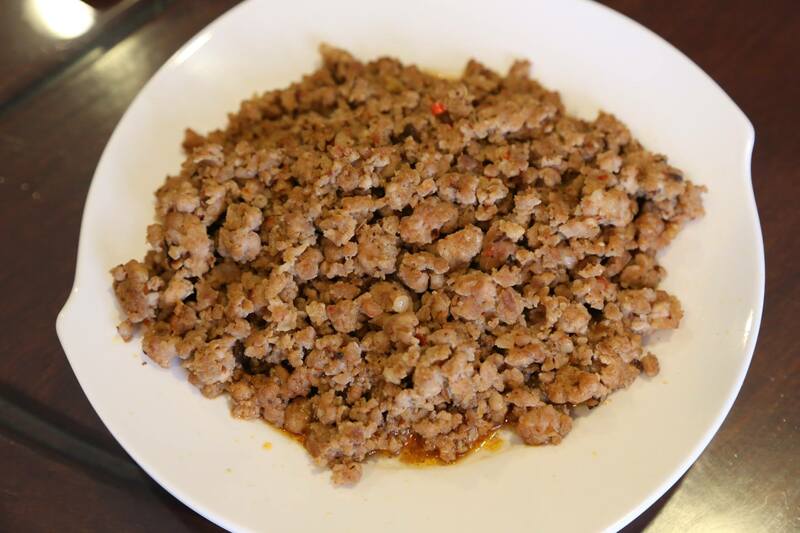 my helper’s＃8 salted fish minced pork 咸鱼饼 was a hit with many friends too. and it is also one of my perennial favourites. 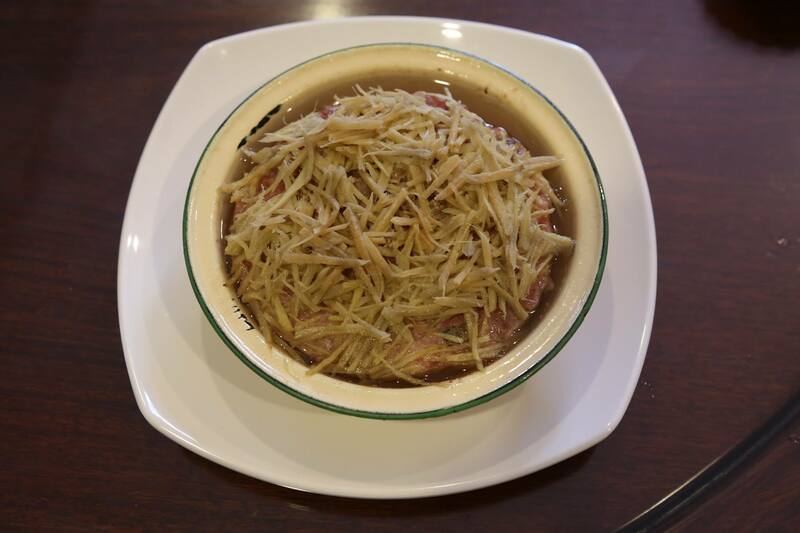 many liked the #9 steamed egg with minced pork too! 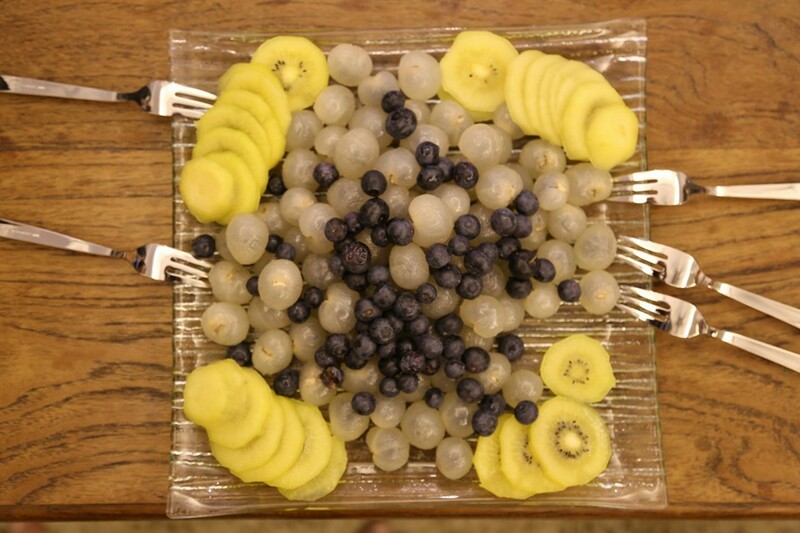 they all liked the light soft yet not watery texture, and the taste too. taste was good. 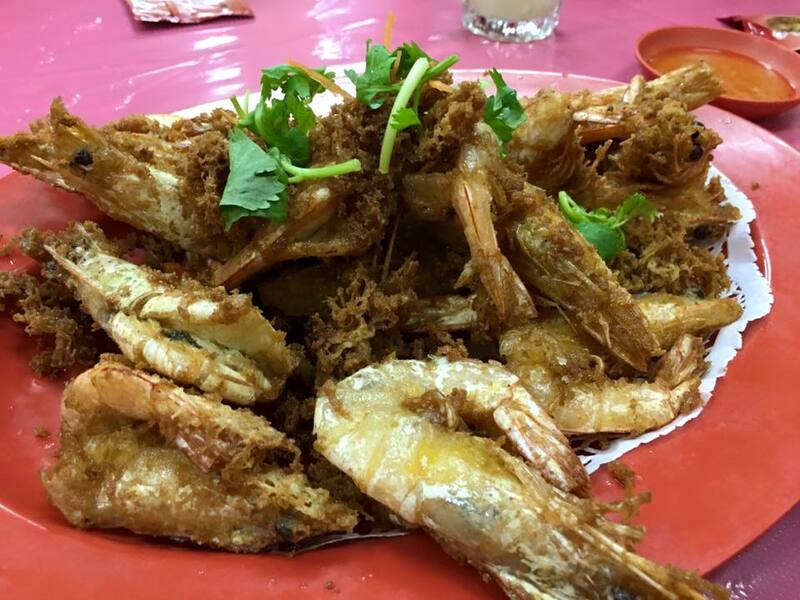 look wise a bit drier & not as oily & reddish as the one at shi le yuan. i will try out a bit more to see which is the best way. 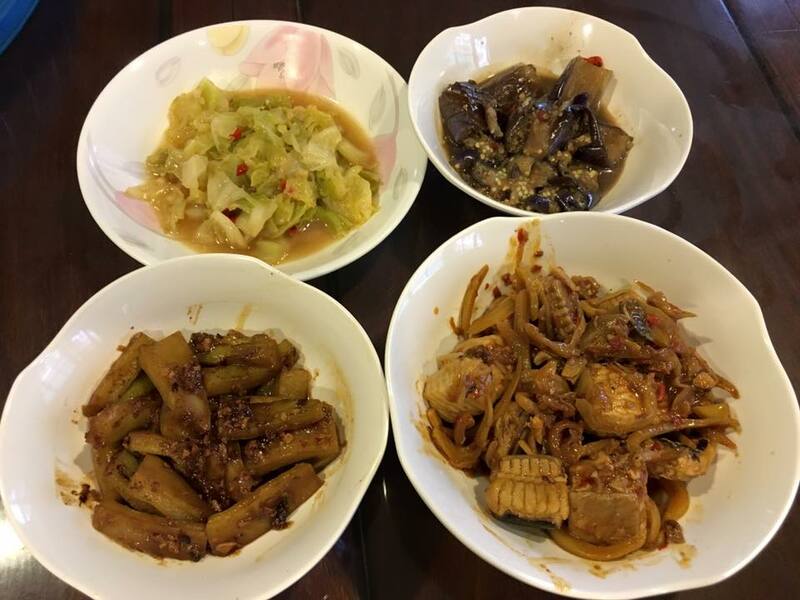 i cooked this #11 spicy bean sauce sting ray with salted veg recently for my family dinner on 24.10.2015, so this the second time. 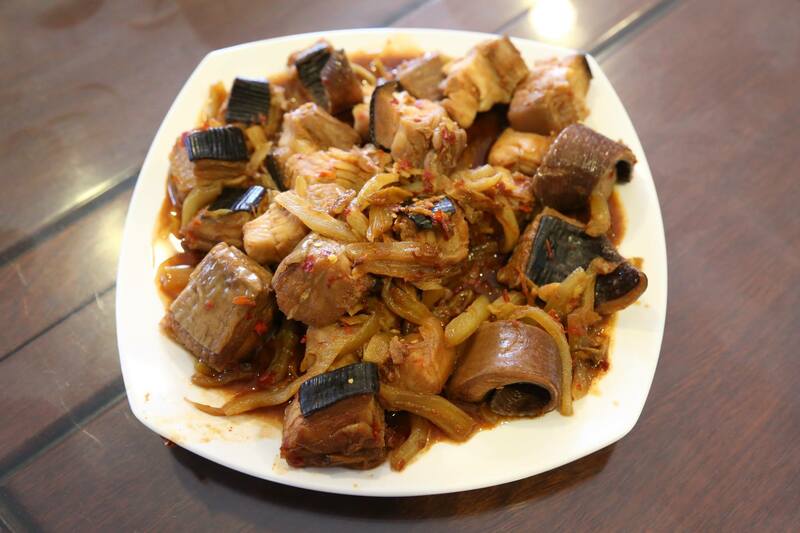 i think colours, flavours wise was pretty ok, but not among the most popular dishes for my friends. tasty, very slight bitter taste enhanced by the slight salty & spicy black bean sauce. 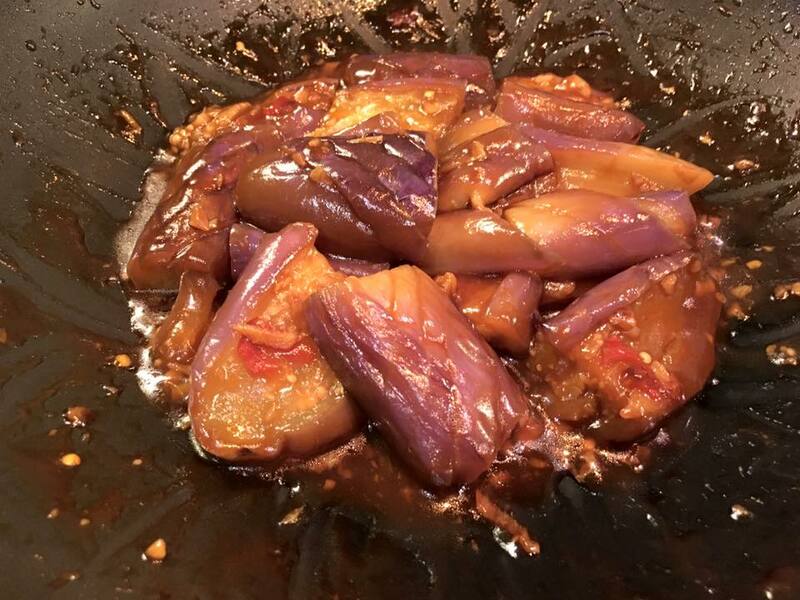 the #14 sitr-fried egg plants was a tasty dish, but not so wow for me. must try again see how they do this. and of course we ended with a nice cake. 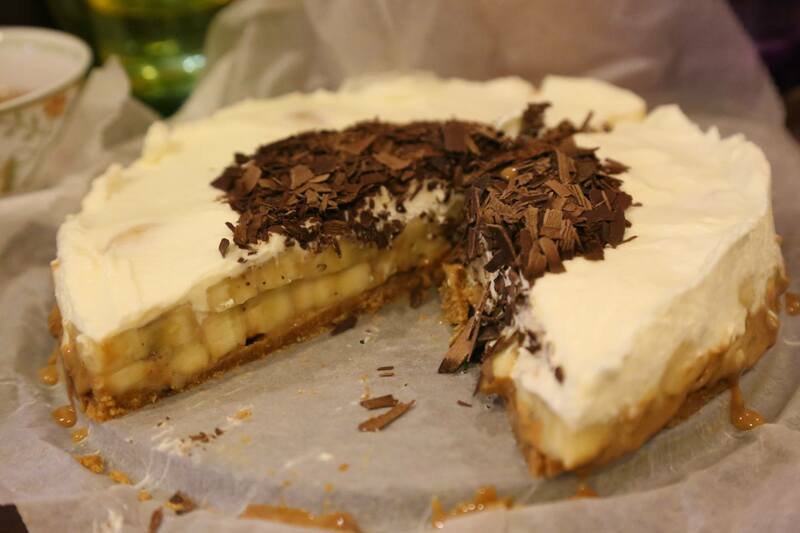 very nice cake, not too sweet, nice biscuit base, bananas & light whipped cream. 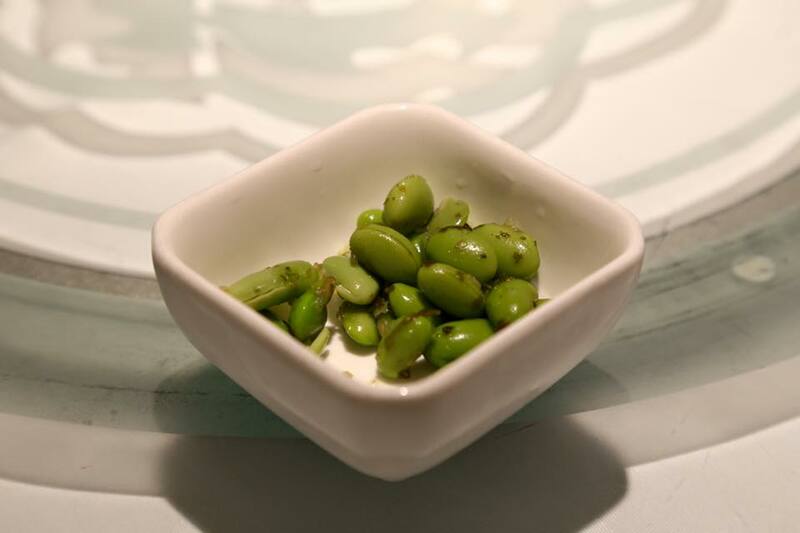 we had quite poor food for the price at chotto matte on 26.10.2015.
but we were not about to wait 45mins for it. so adam road would have ot do. anyway youngest daughter prefers adam road. it was pretty good. 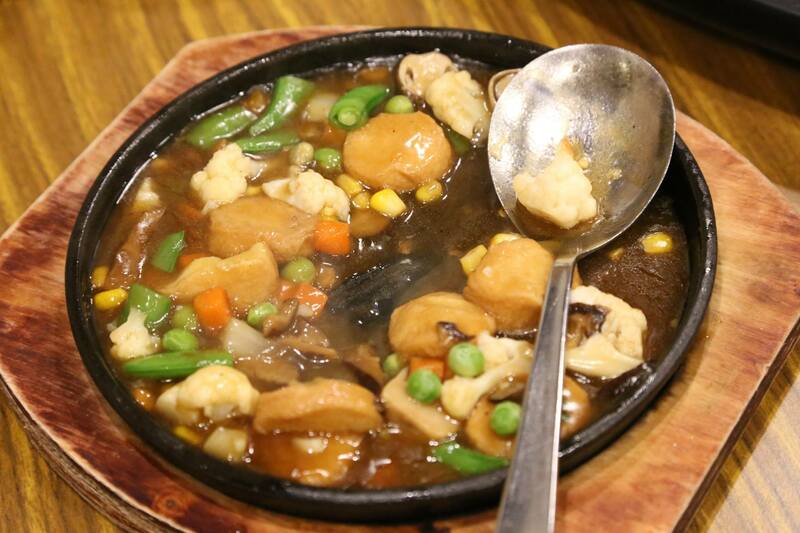 nice wok hae, tasty. 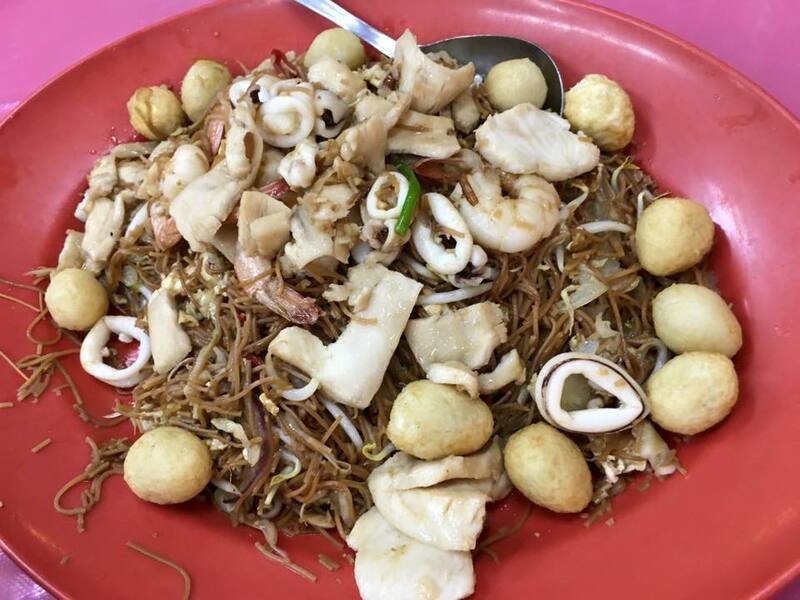 we ordered 2 packets, each S$3 plus S$1 extra cockles. but cockles were so tiny, have to put on glasses to find them. 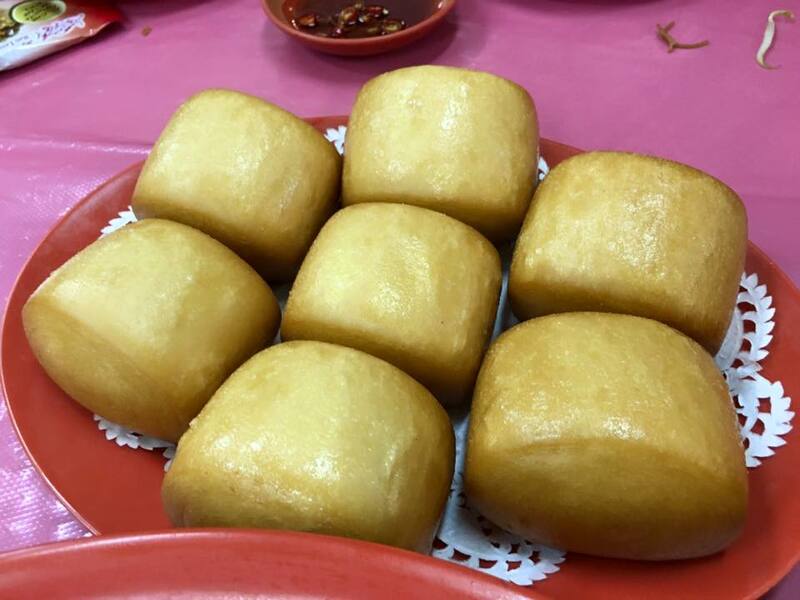 still likes hai kee’s better la! 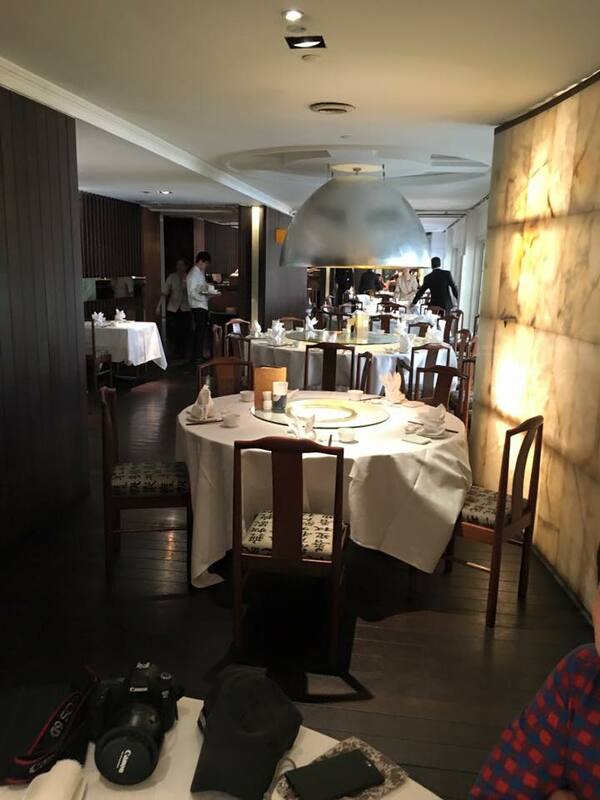 we were celebrating a family occasion on 26.10.2015, not sure why we ended up at chotto matte. 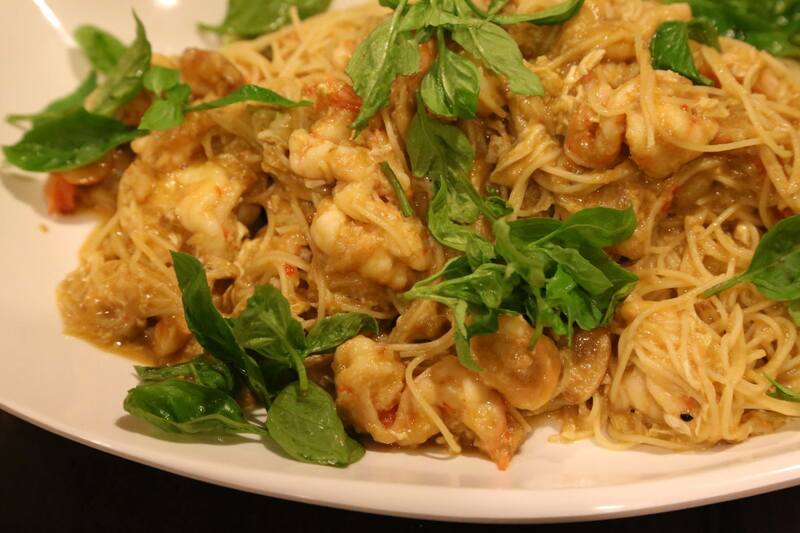 they have uob 15% discount & dbs 1 for 1 main course for dinner & lunch (limited to only 1 free main course for each table). we were there at blair road about 7pm, but i could not find any parking, & ended up parking at the hdb carpark next to everton park. my daughter & her friend came later but managed to park along the blair road itself near chotto matte. restuarant was tiny. 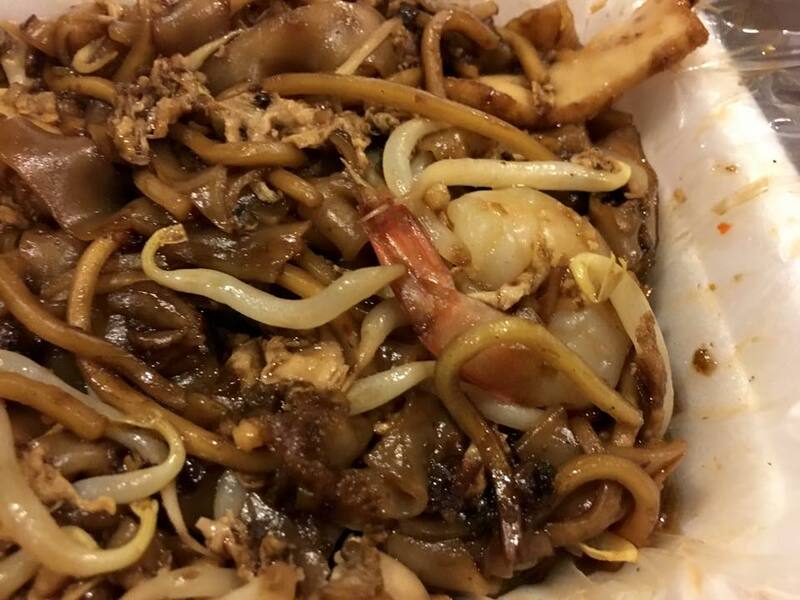 most of the recent reviews on hungrygowhere were poor, but mostly about the service. 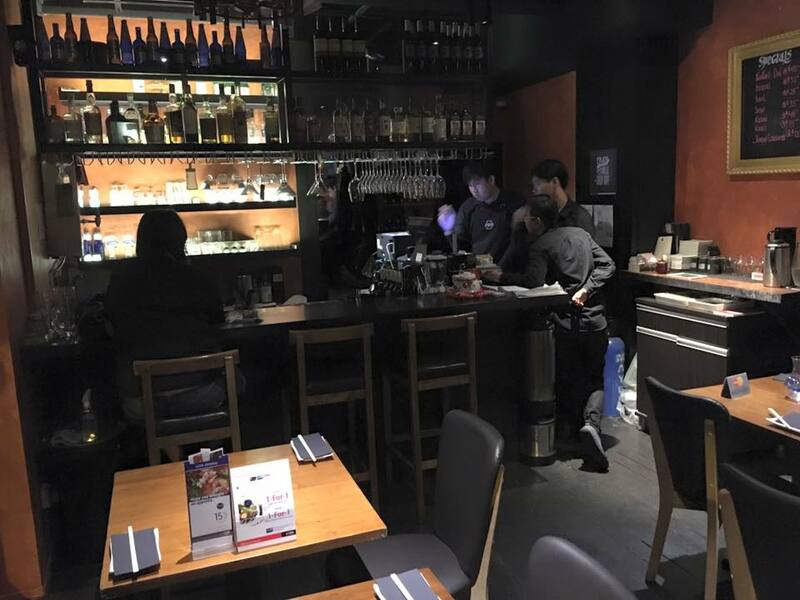 we had a chat with the male server & his attitude was actually quite good & helpful enough, but i think limited training & knowledge about the menu & the discount practice. ok la i guess. 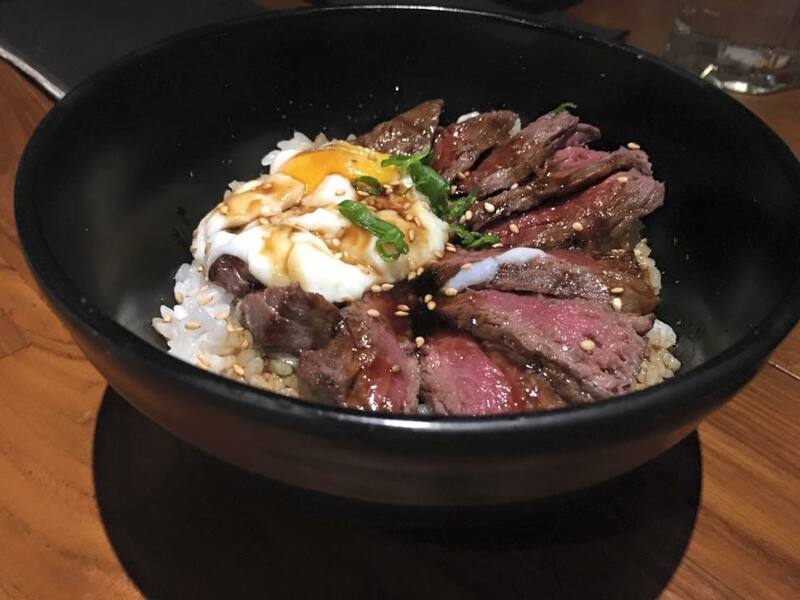 we ordered the grilled wagyu, grilled kurobuta, onsen egg wagyu don, mentaiko pasta, chirashi don & a salmon maki. we were expecting to try out some decent food first, and then order more. 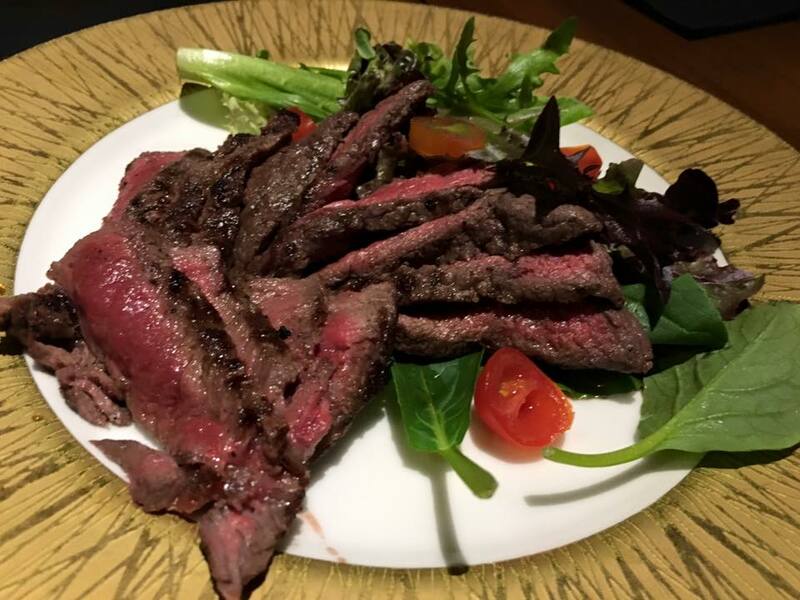 the grilled wagyu. 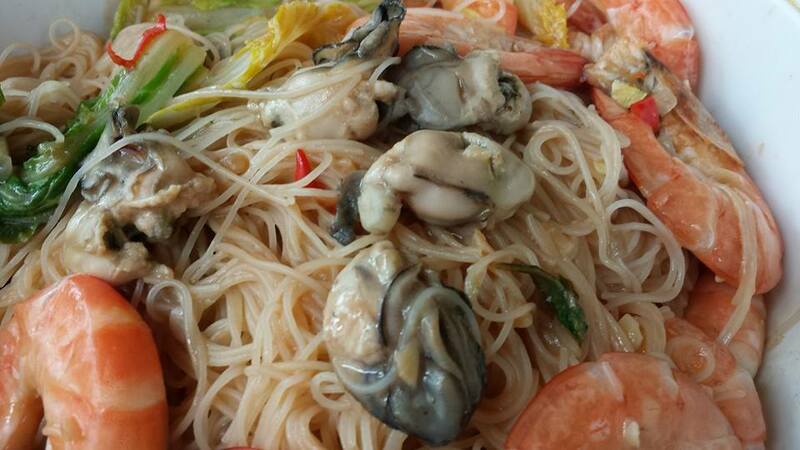 can’t exactly say it was bad, but it’s mediocre maybe S$18 or S$22 ok, not S$38. 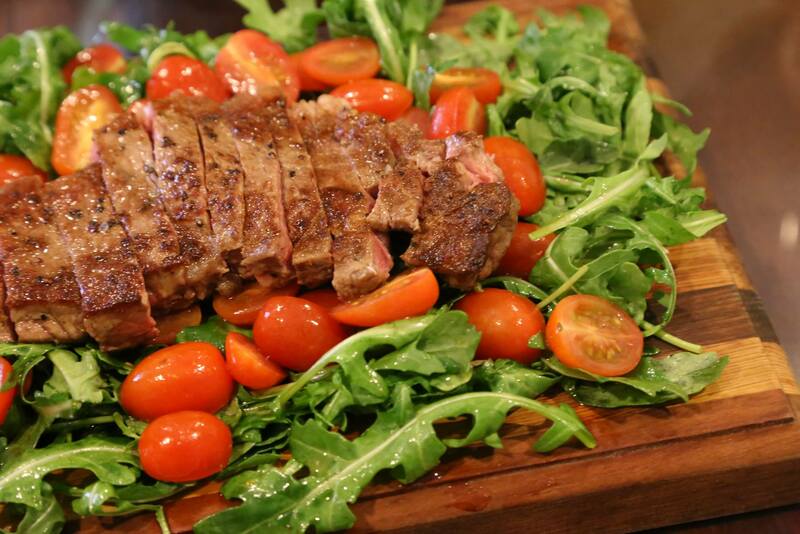 c/w my own tagliata, i think anyday my steak is infinitely better! 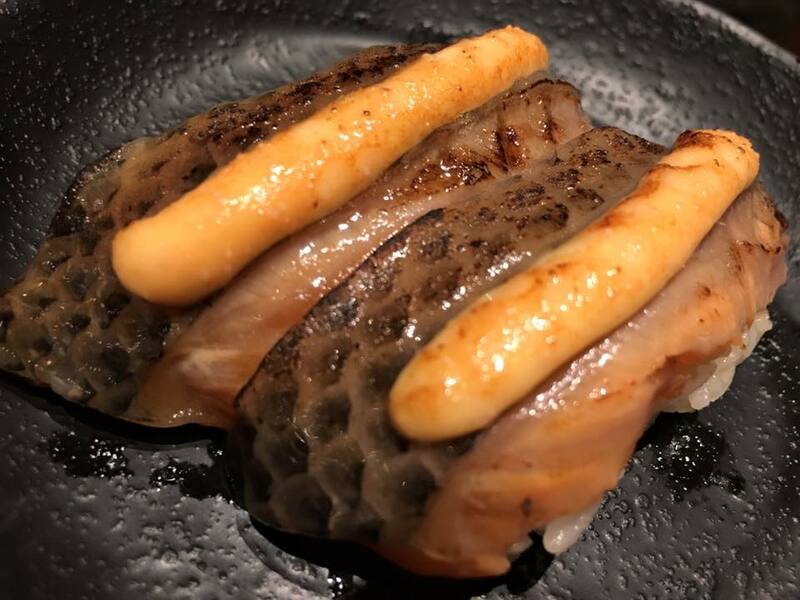 the grilled kurobuta. i think it was a disaster! 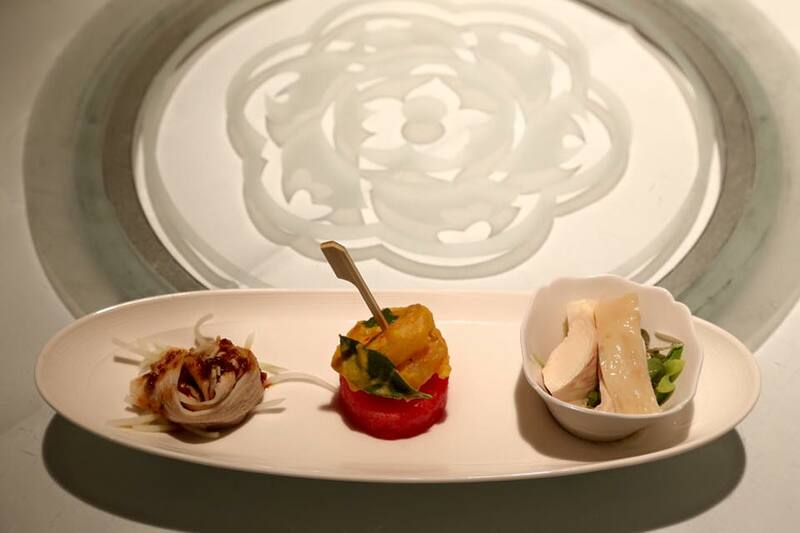 you just cannot serve such a dish in a restaurant. 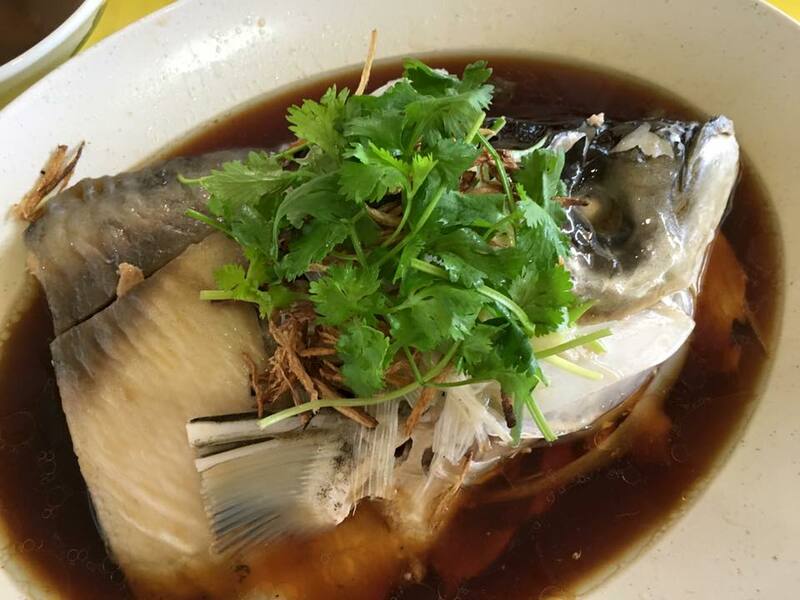 i wouldn’t order this for S$12 la! it was dry, hard? 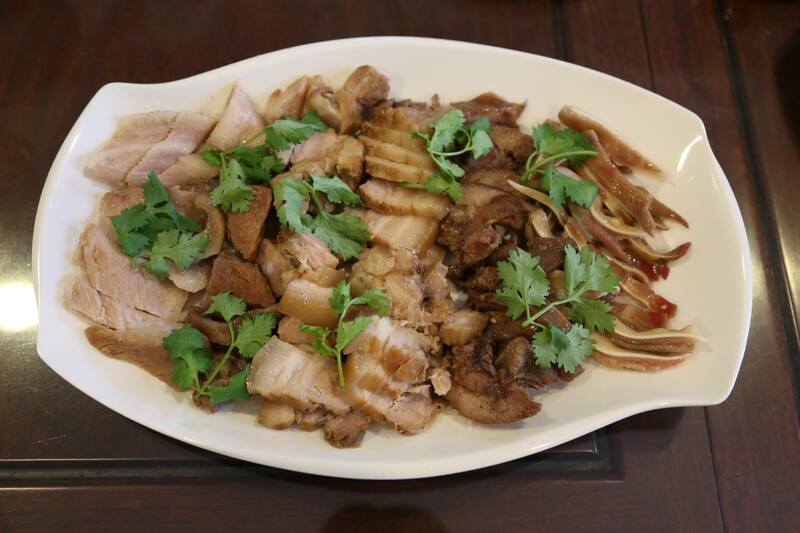 i mean any normal pork would be a lot better than this in taste & texture, no need kurobuta! 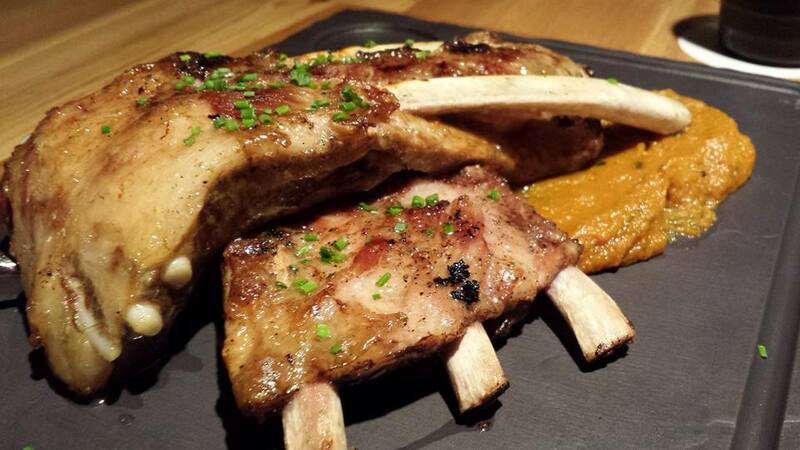 just look at the iberico pork rack at foc. so flavourful, moist, marbled. if foc’s is 9 or 10, chotto matte’s would be 1?? not sure 1 even if it is worse than normal pork. 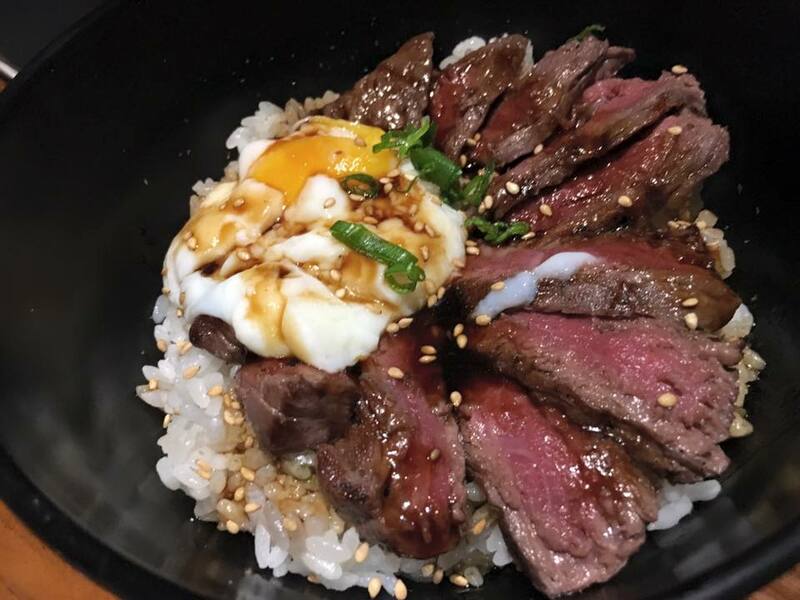 the onsen egg wagyu don. 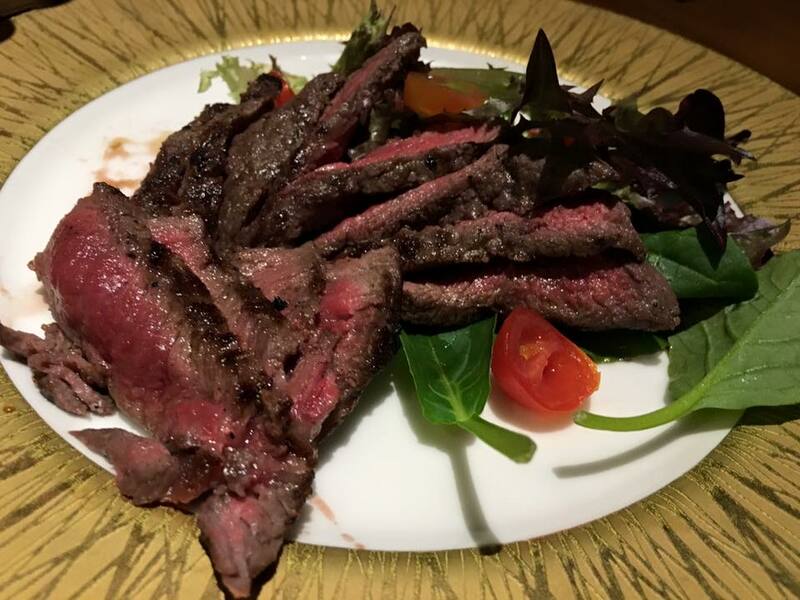 ok lah, i guess it was more of the same as the grilled wagyu main. so same ok standard, just ex. the sushi rice though was quite poor here. 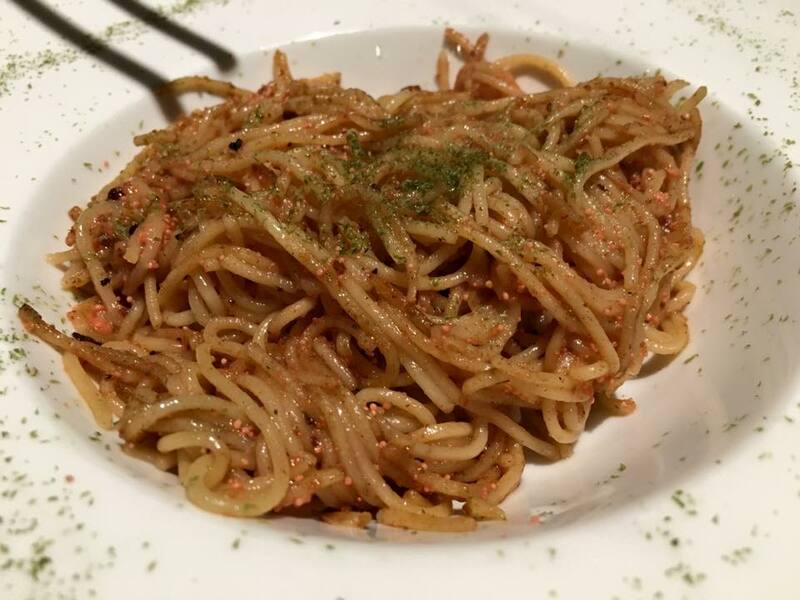 mentaiko pasta. 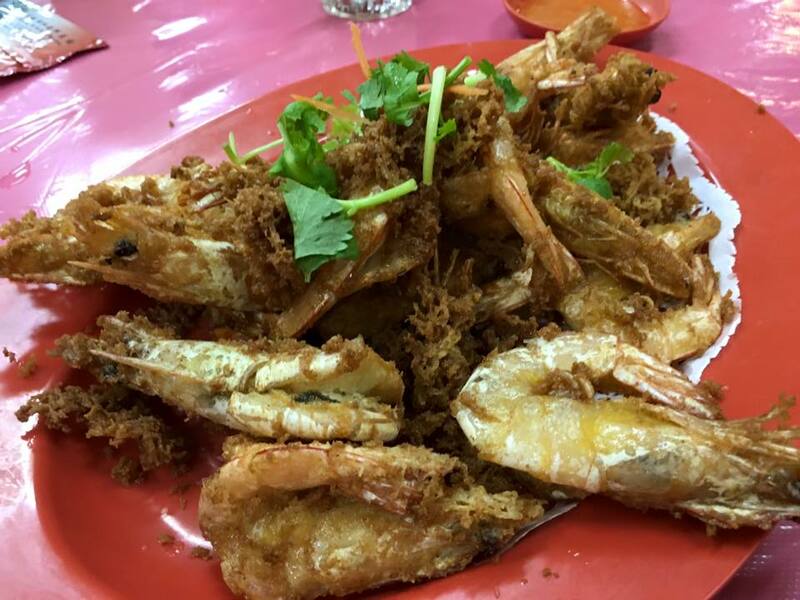 my wife & daughter quite ok with this, though it was a tiny portion for S$18. 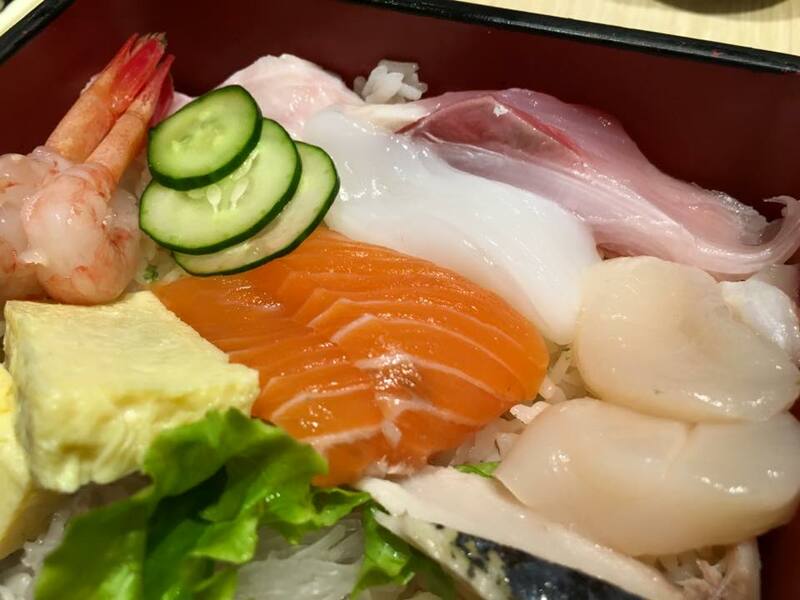 must say though that the sashimi were all fresh, sweet & good. the sushi rice was not! there was 1 piece of chutoro, 2 good hotate, maguro, kampachi, kajiki etc. 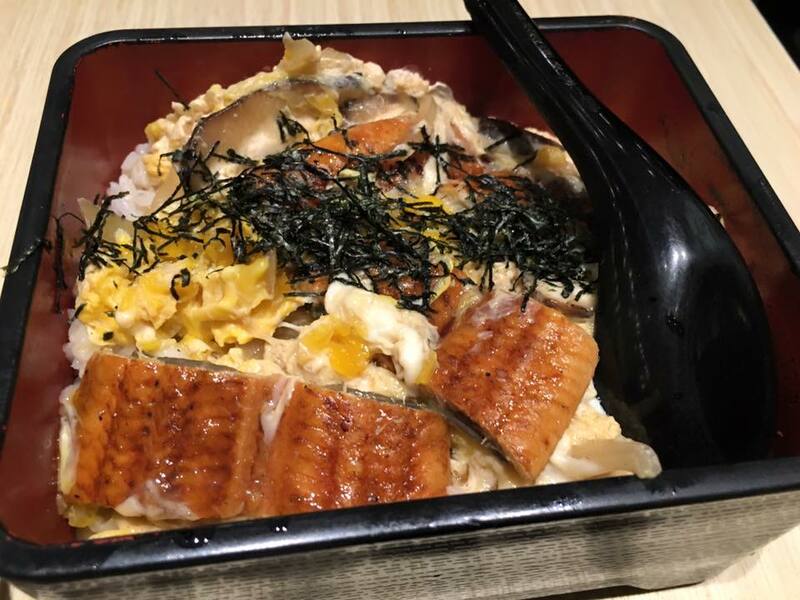 c/w mikuni’s chirashi don, also S$45 after 50% feed at raffles discounts. well nothing to compare. 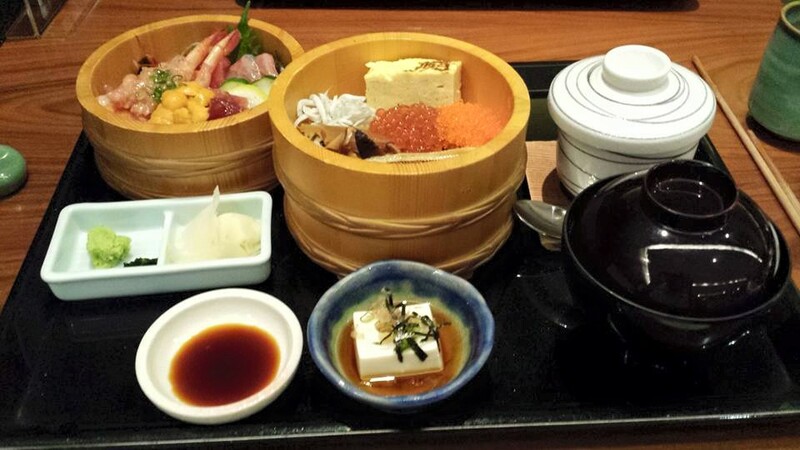 or with kuriya’s S$62 chirashi sushi gozen set. what’s there to compare right? 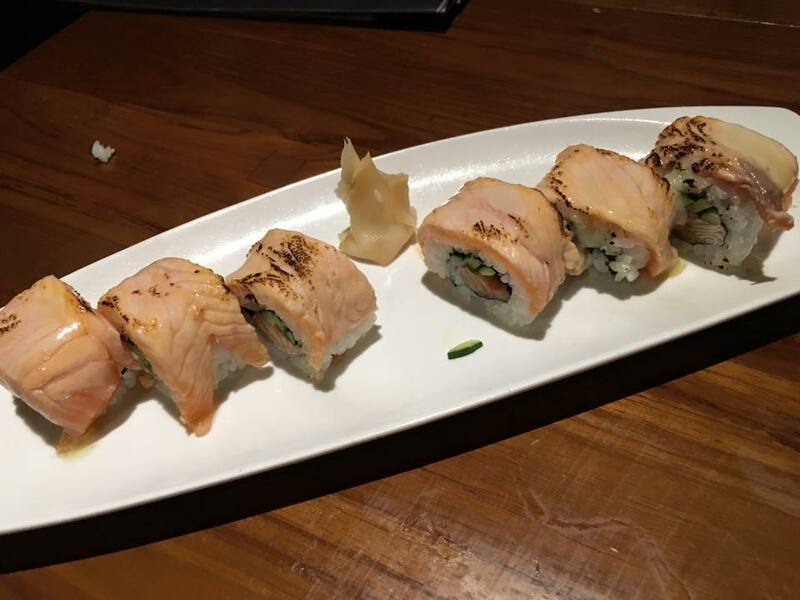 the salmon maki was pretty ok.
anyhow, after the few signature dishes that failed badly, we did not want to add any order. 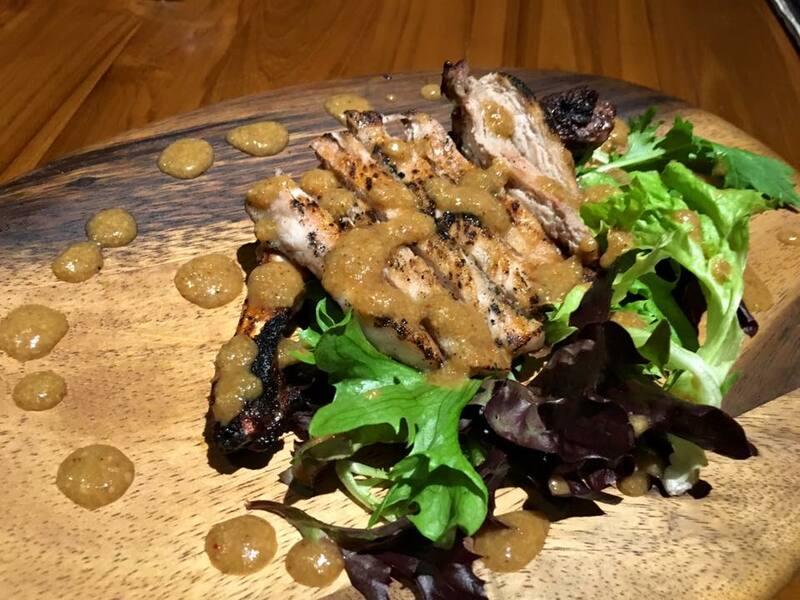 the bill came to S$290 (including a S$95 bottle sake) after dbs 1 main course discounts. 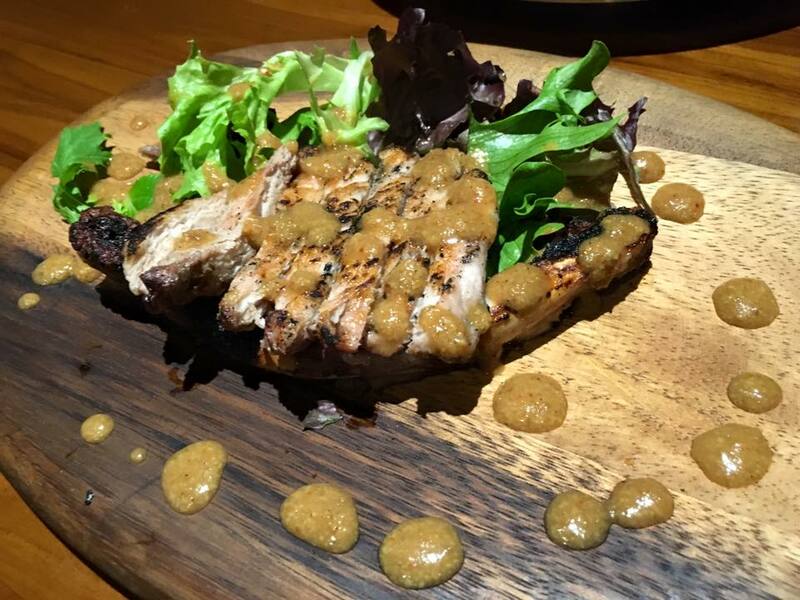 so less that it would be close to S$180nett for 5pax. 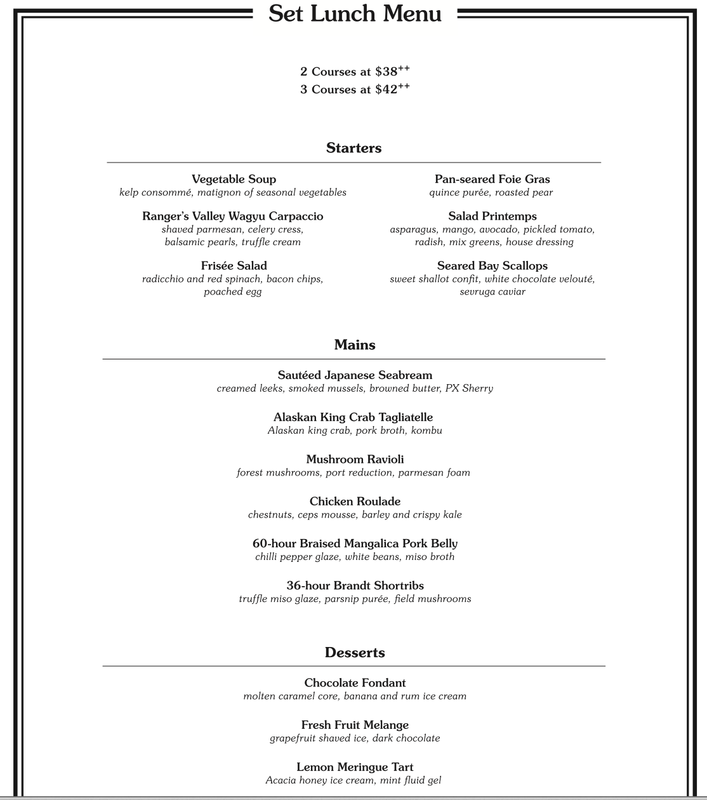 may not be expensive on per pax basis but we did not order that much food & the standard was really poor for the price. never come back again for me! 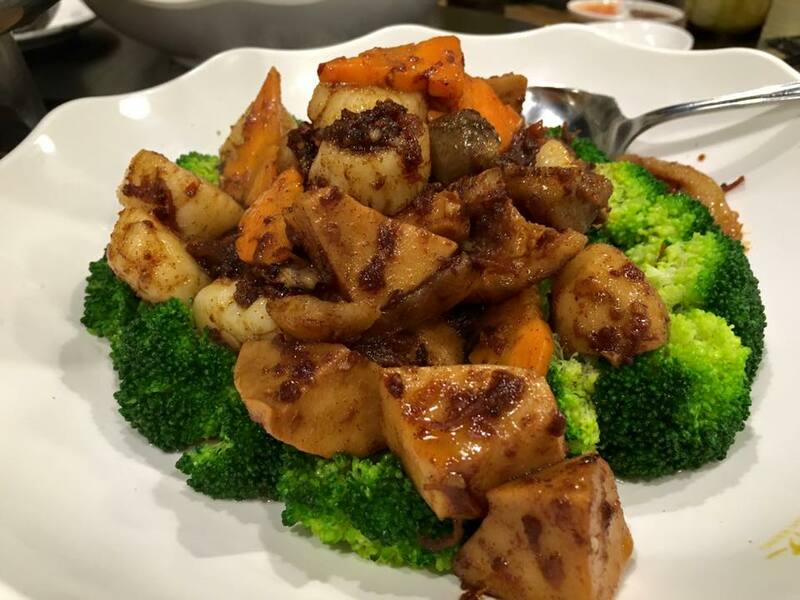 Excellent Dinner @ Xin Cuisine on 25Oct2015. we decided to take chinese since the next day we are having japanese at chotto matte. 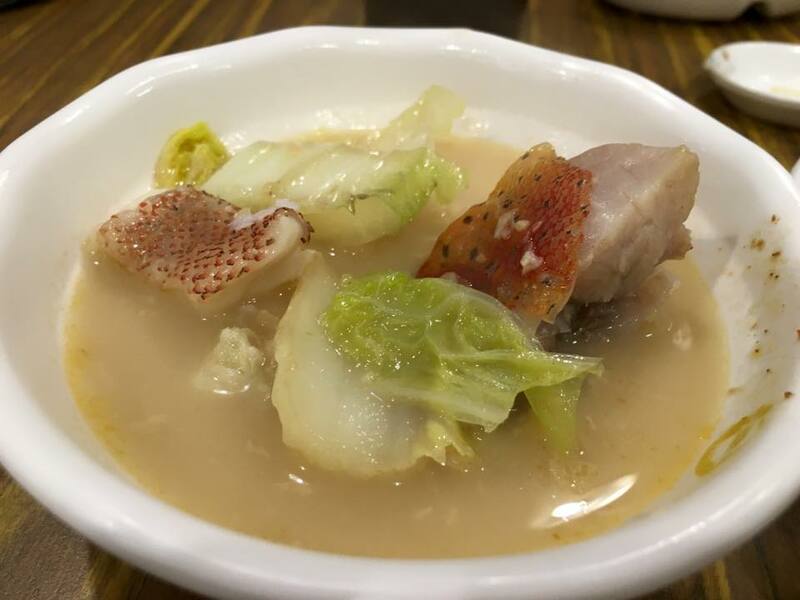 we were here at xin cuisine some weeks back on 1.10.2015.
we had a very nice lie tong 例汤 the last time here. 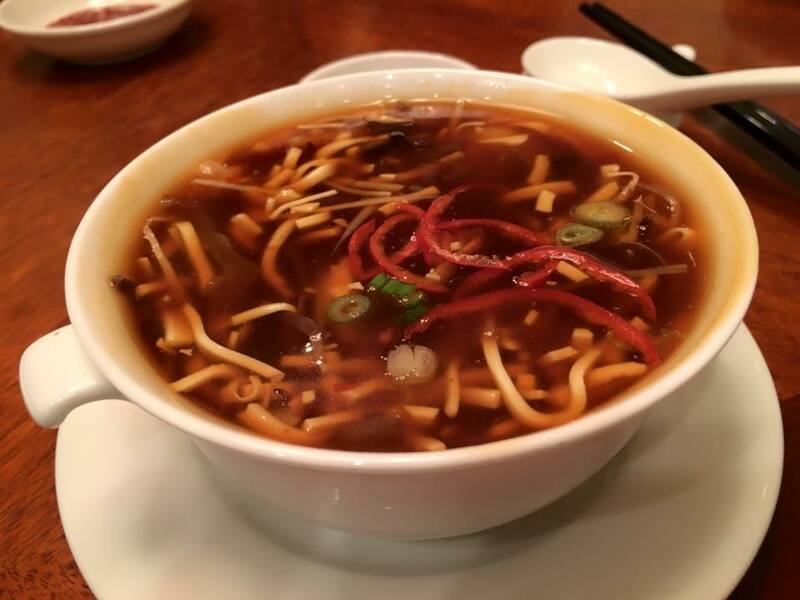 this time they had the chinese liang teh base 凉茶, so we decided to try couple other soup. 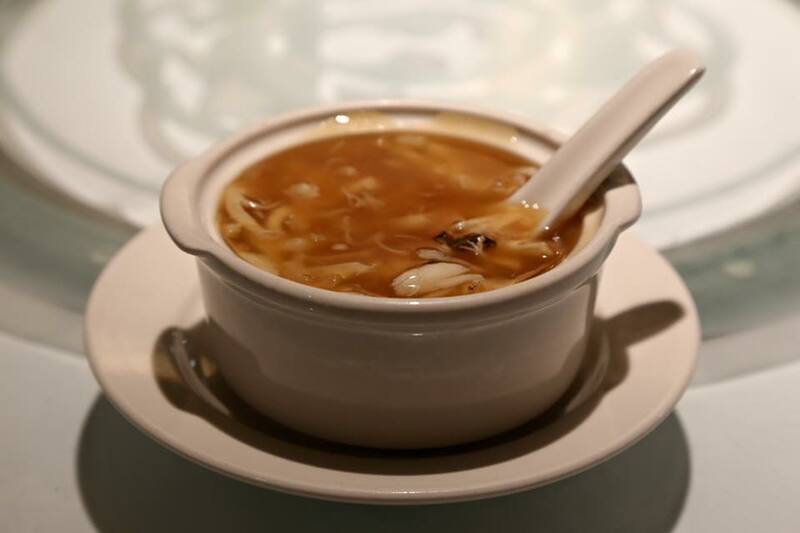 the seafood sweet & sour soup 酸辣汤 – S$9 was very good standard, fragrant & also lots of seafood ingredients. 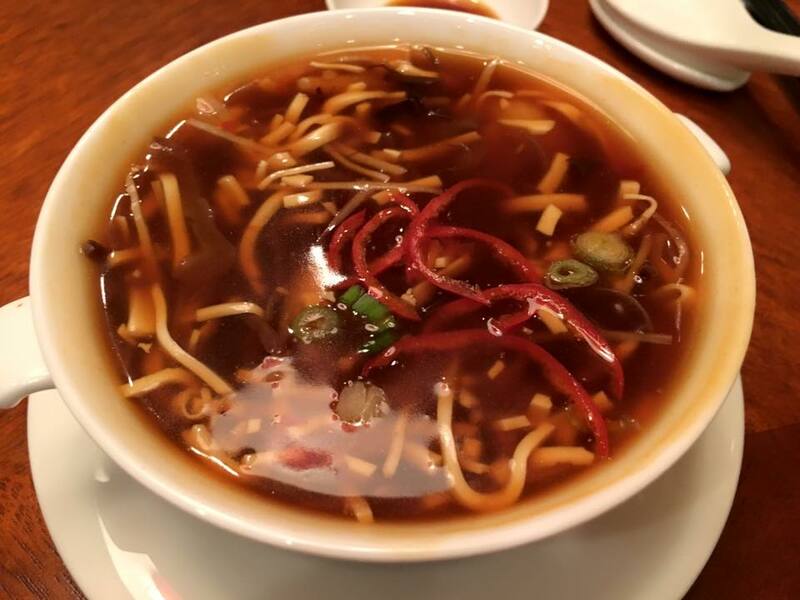 i would say a very good soup except this kind of gluey soup & just a bit sweet (though it was ok for this type of soup) for me not really my preference. 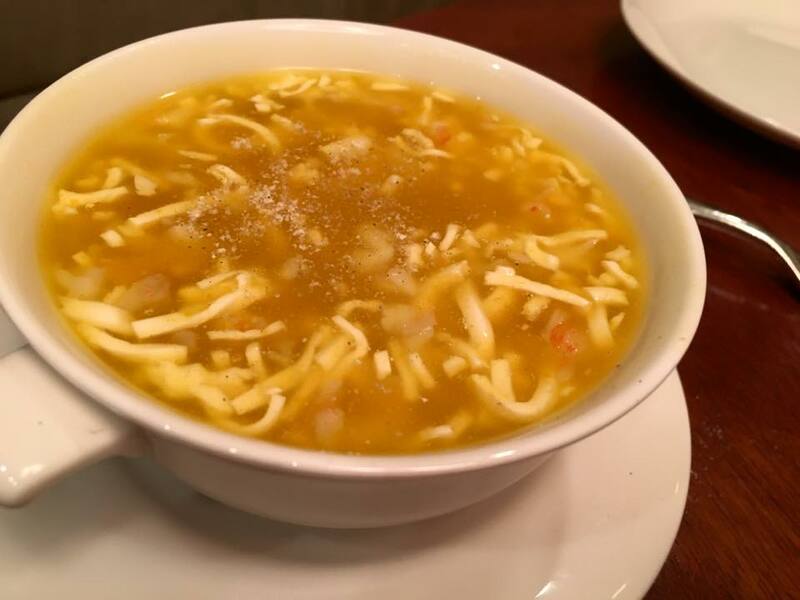 this soup actually had lots of lobster bits. 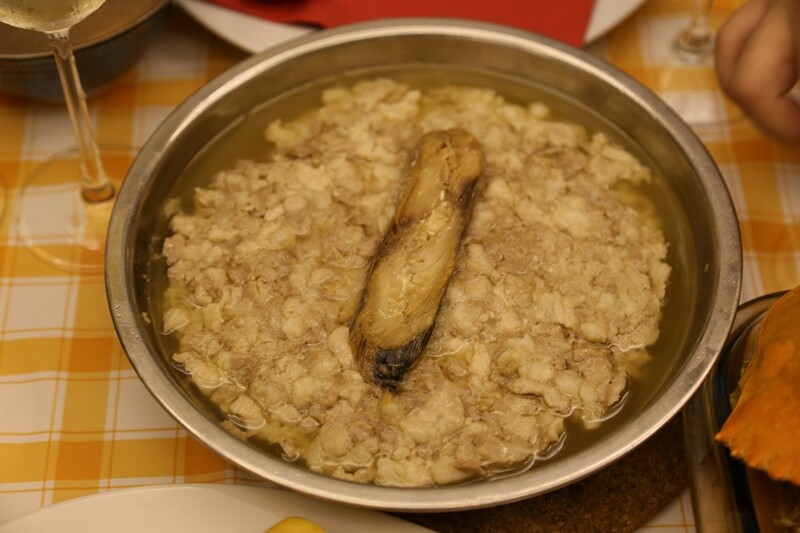 the soup itself (ie the stock base) was also very tasty, but again the gluey texture not my favourite. 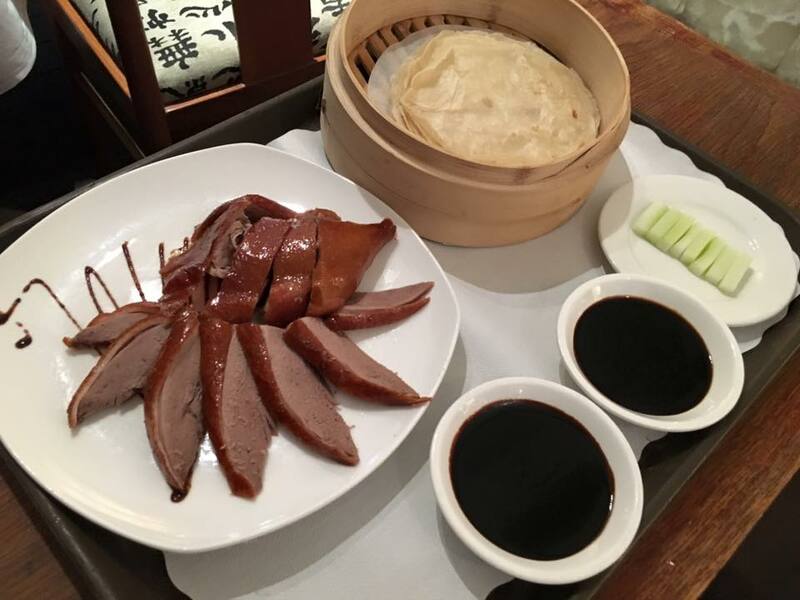 this tea infused duck is a must-have at xin cuisine. wife did not want too much carb items so we ordered just 1 loster noodles to share. 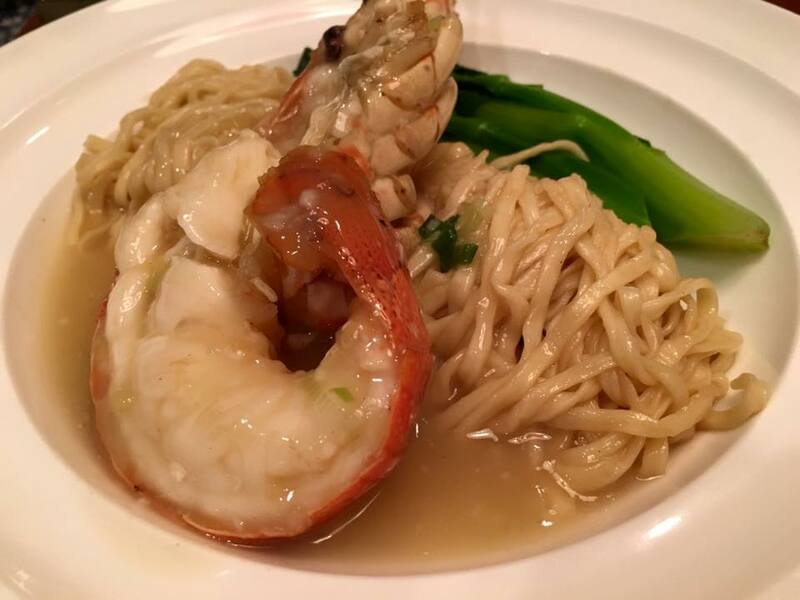 i must say this was extremely good, very tasty, both lobster & noodles were good. 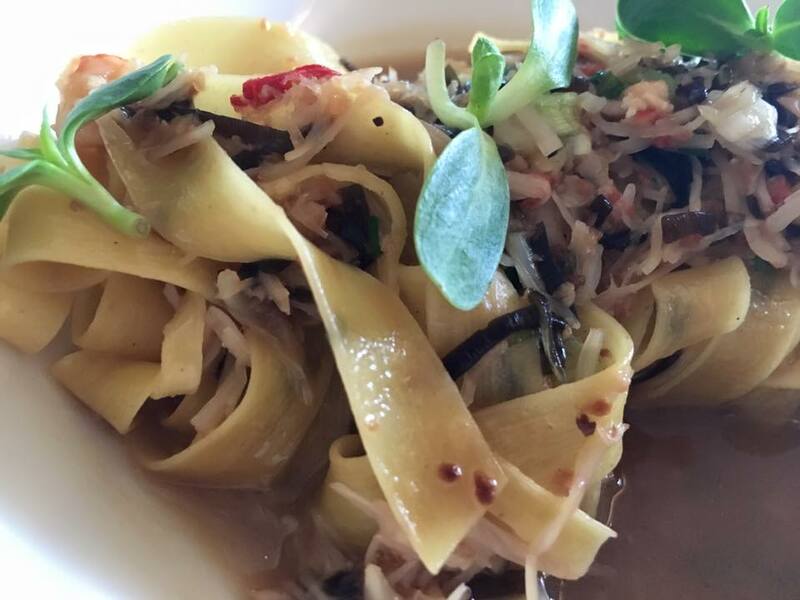 i must definitely order this again the next visit. 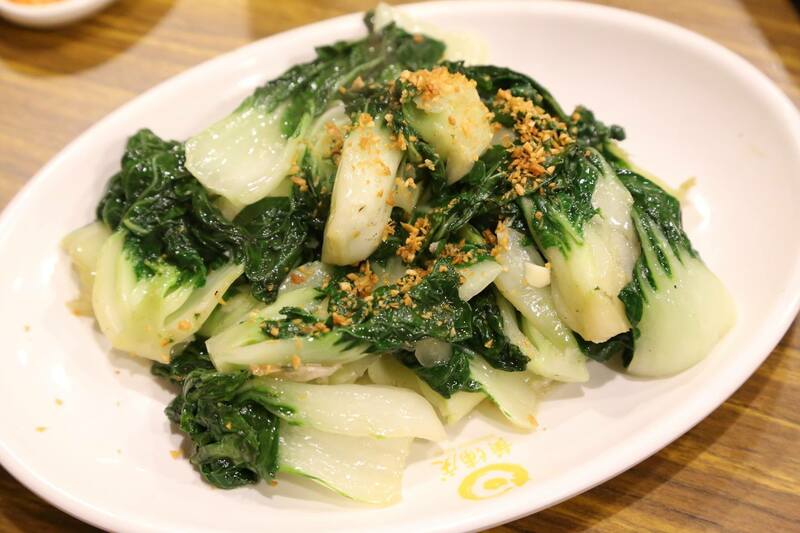 we had the dried mustard vegetable with small cabbage 梅菜烹娃娃菜 – S$18 again. this was really an excellent dish. 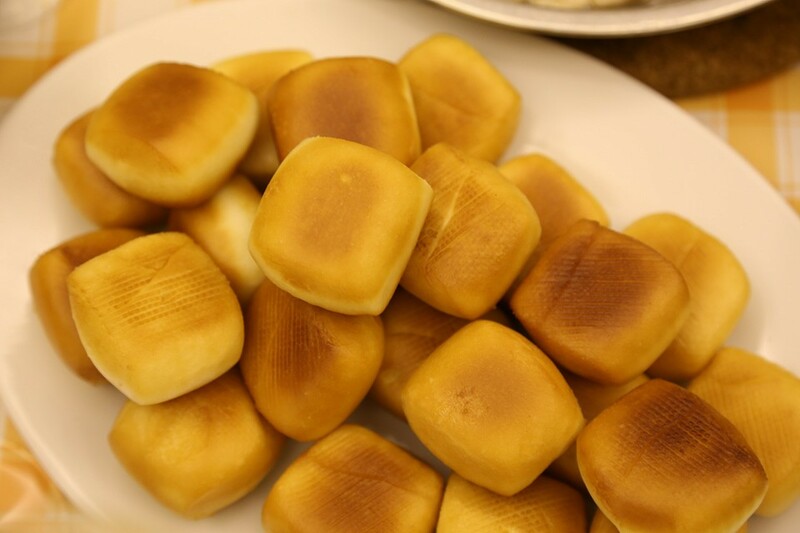 the 梅菜was so flavourful. 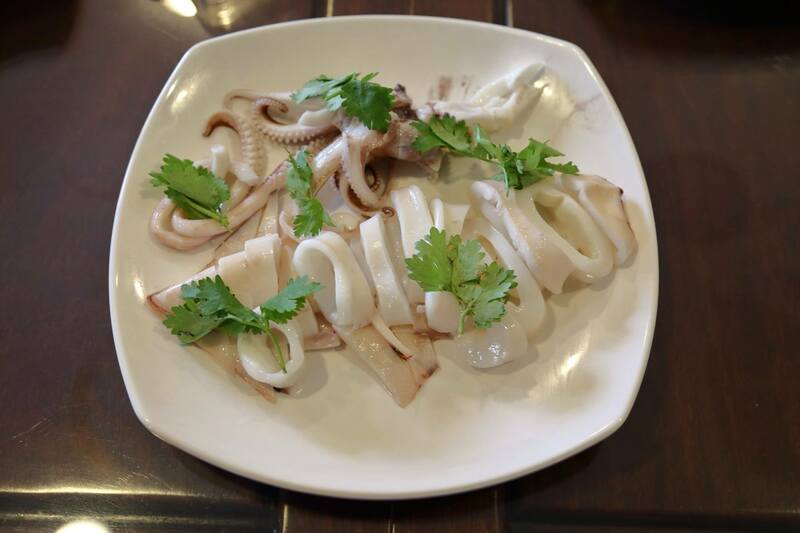 i must really try to do a 梅菜 dish at home. in fact today when i was in sheng shiong i bought 1 packet of the dried 梅菜. 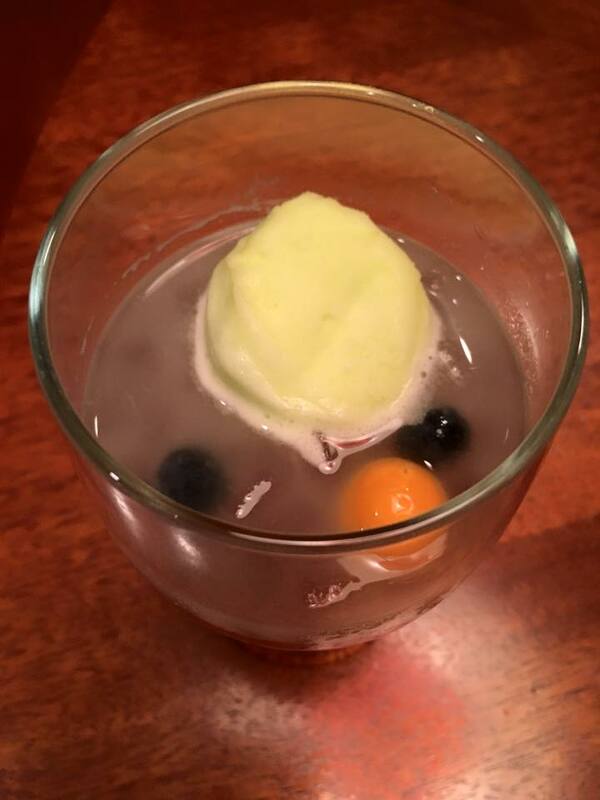 wife didn’t quite like it. 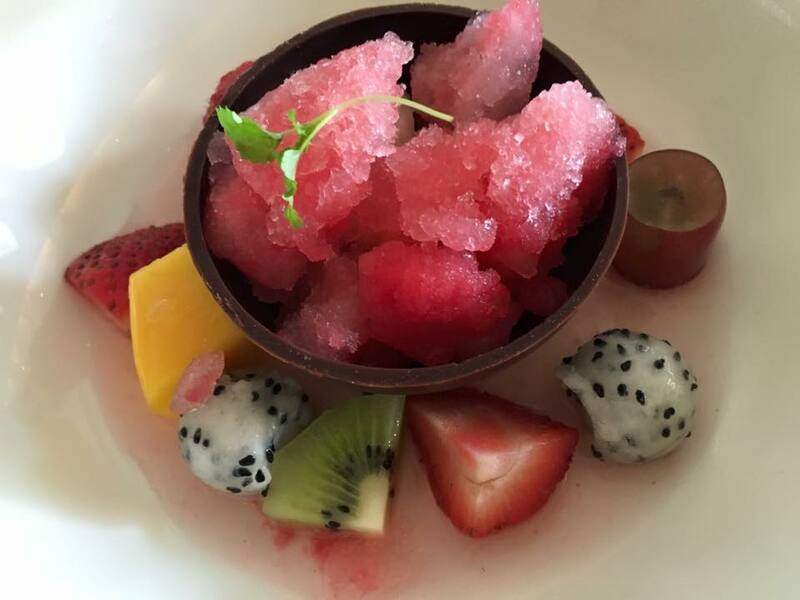 for me it was perfectly ok. lime sorbet was great, so was the aloe vera jelly, very refreshing. 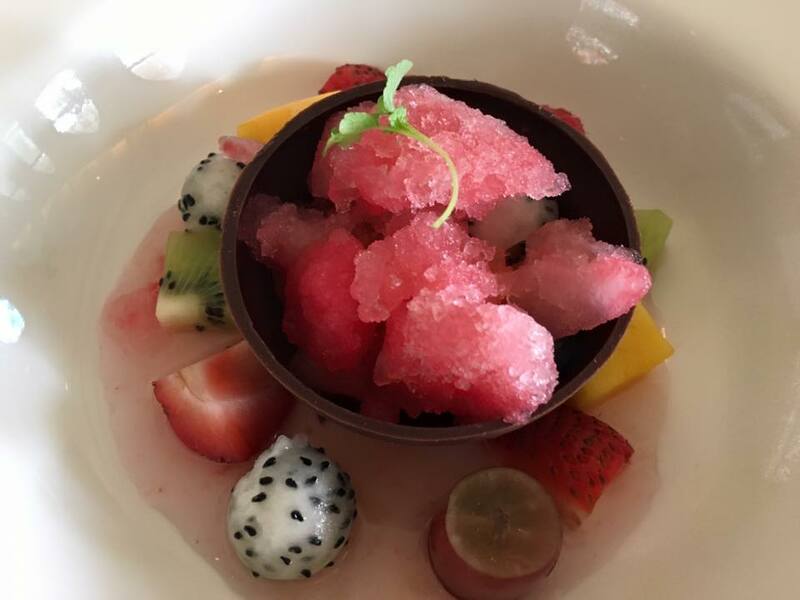 i do agree with my wife that the couple dessert we took at tunglok signature were better. 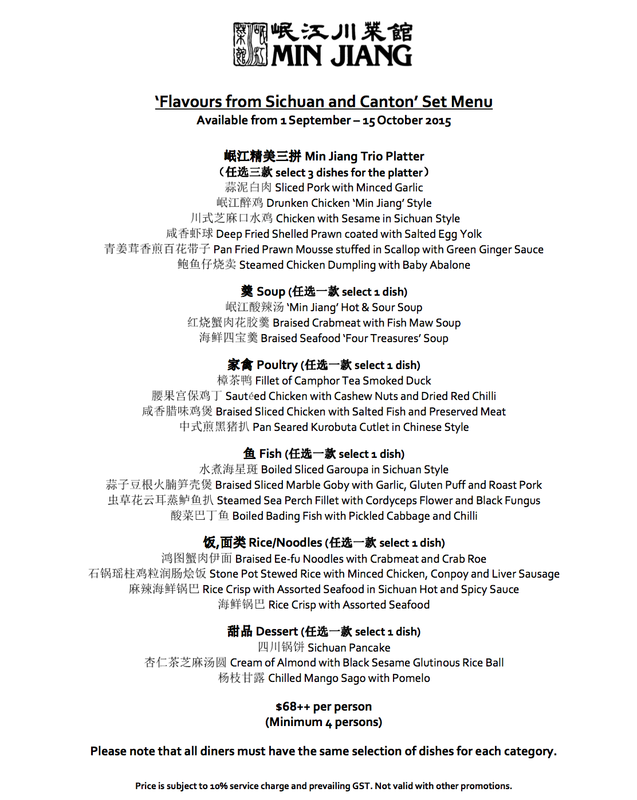 for the dinner, we only spent S$67 after 50% amex palate discounts for 2pax. 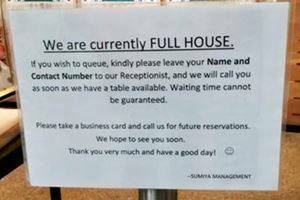 we were there at 1.15pm, hardly any queue & friend already seated at a table when i arrived. this friend is quite active in charity work. she is receiving some award from the msf minister this evening. i came here couple times when it just opened, must be like 4 years back? never been since, so no prior record on my blog. 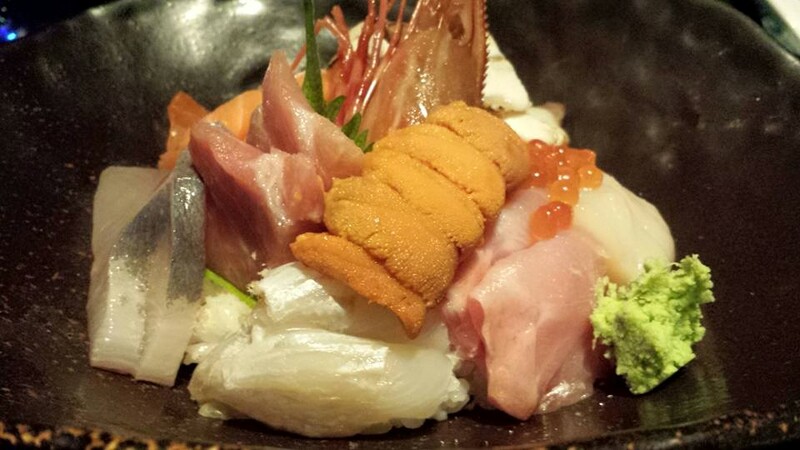 there were 2 amaebi, 2 tamago, 2 salmon,, 2 hotate, 1 hamachi, 1 tai, 1 kajiki, 1 ika & 1 saba. total 13 pieces. 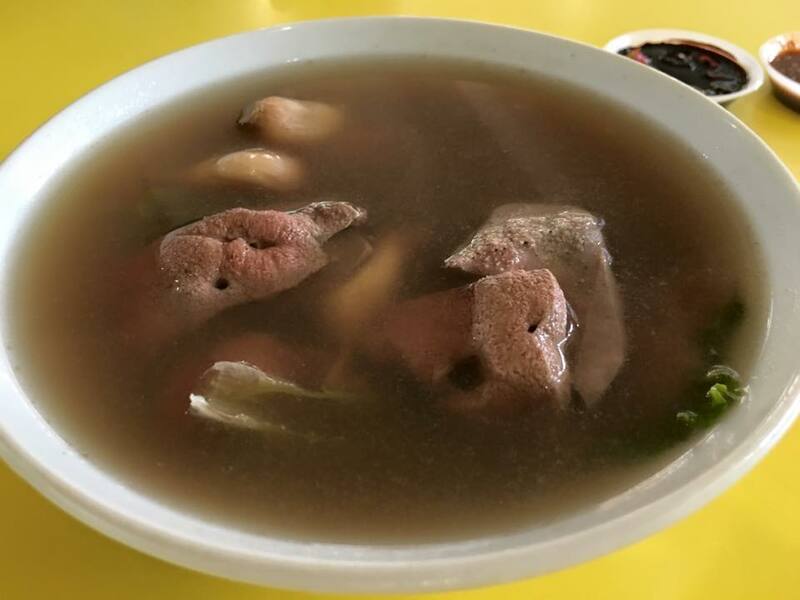 quite decent really at S$14.90. hotate was very good. so was the amaebi. 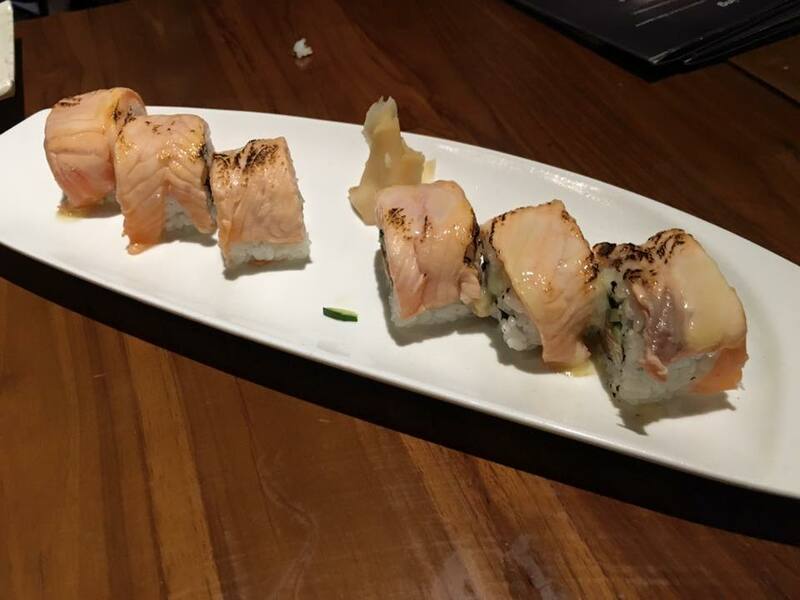 tamago & salmon were pretty good. only the tai was tough. sushi rice was not good. i made better tasting sushi rice. 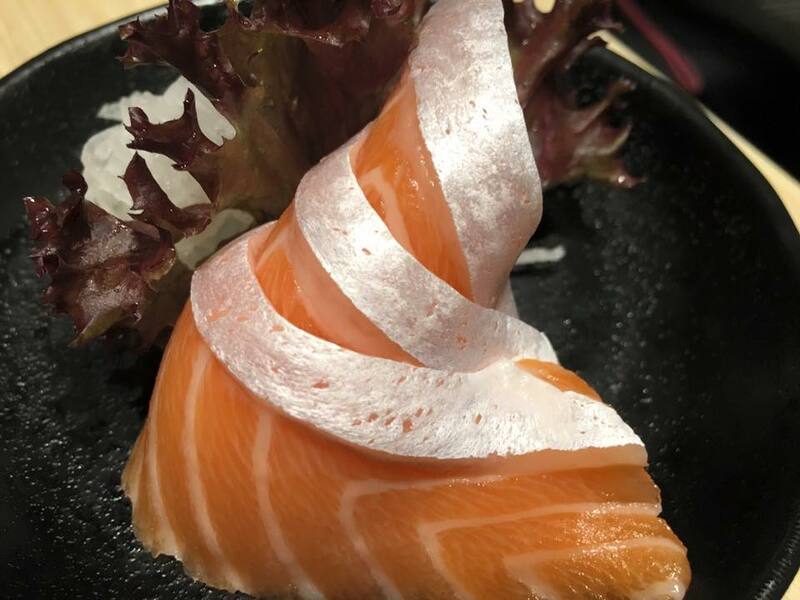 there were promotion items like the salmon sushi for S$0.40, but 1 person could only order 1 piece. 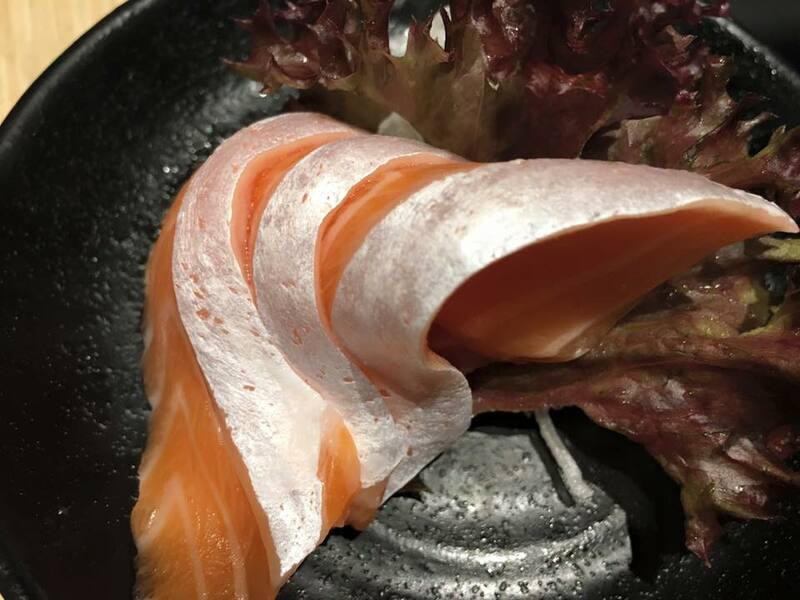 so i ordered the salmon sushi with mentaiko for $0.60. 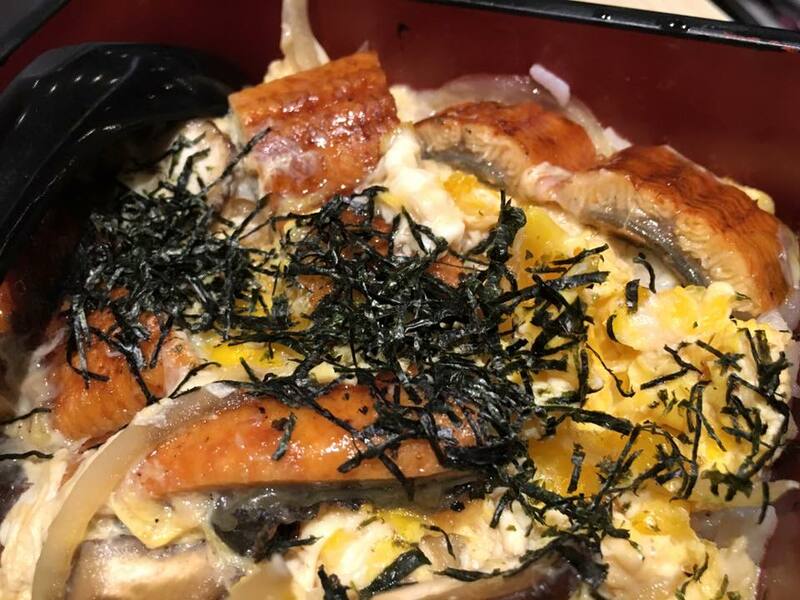 my friend had the unajyu oyakodon. it looked ok.
& she ordered some fatty salmon. 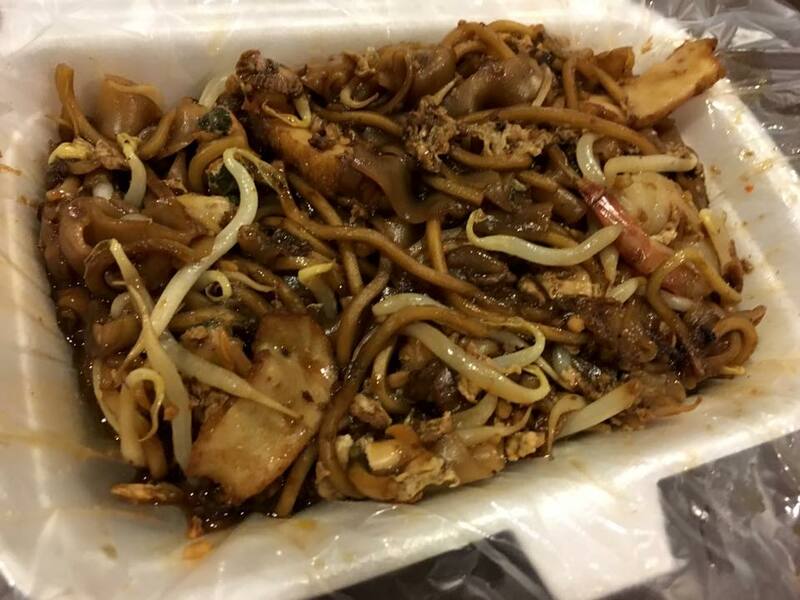 it looked good, but for S$5.10 it was not great. 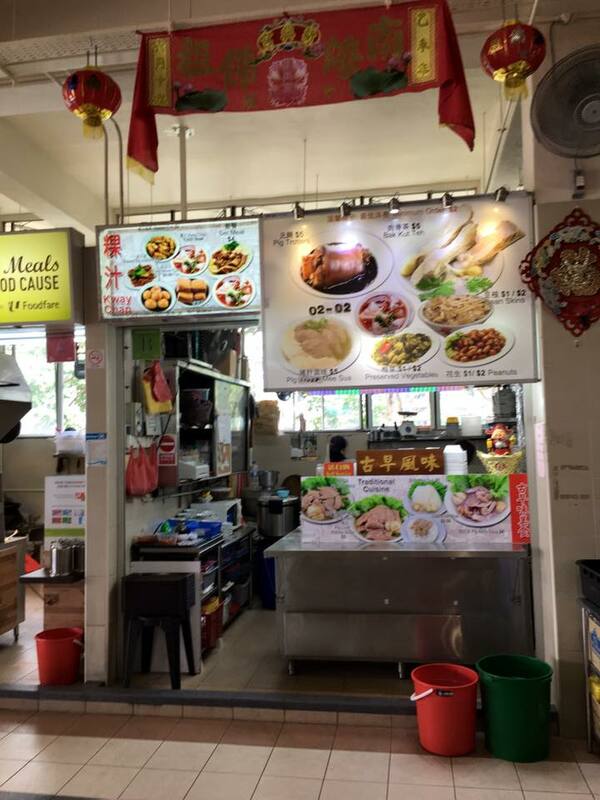 lunch was S$41.65 for 2pax. quite doable but nothing great. only 2 of us for dinner. 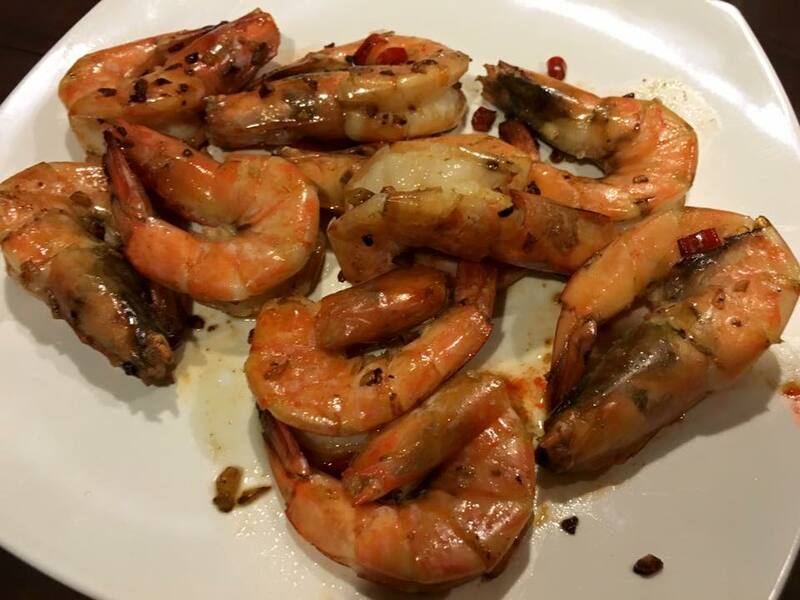 helper prepared some prawns & asked me to cook. 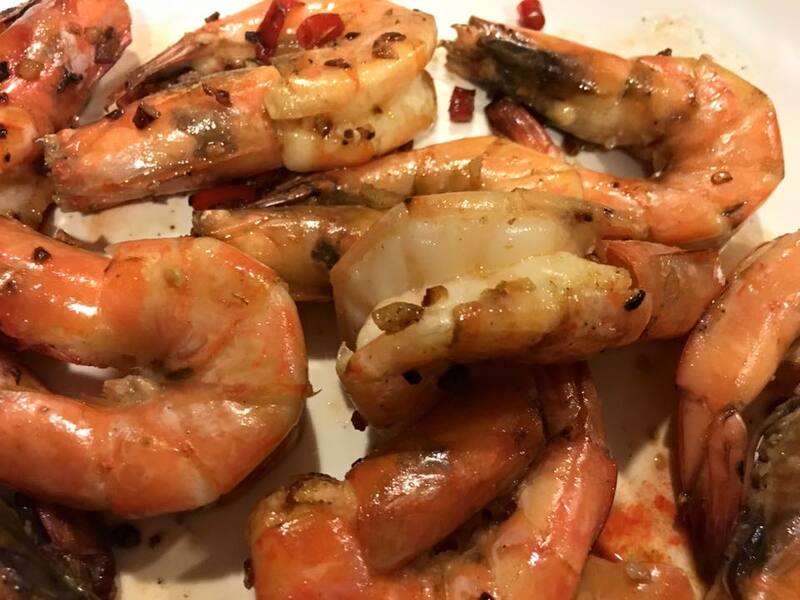 it’s my usual dry wok prawns style – recipe here. 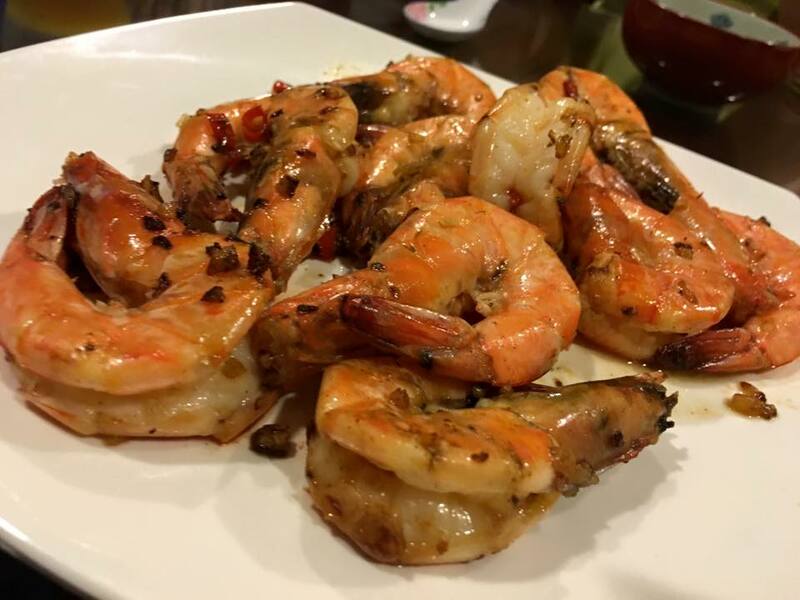 this method of cooking is like baking the prawns in the shells, very flavourful becos of both the bbq charred flavours & the aroma of the fish sauce in a very hot pan. a bit better to reduce it more to get more intense flavours. it was a nice, easy, quick dinner. with just a little rice. 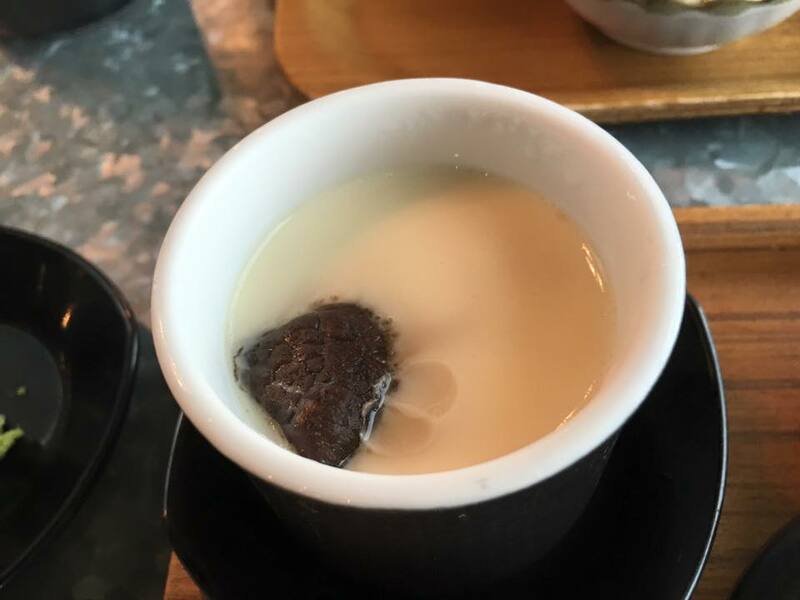 wife was meeting a close friend and had tea first & was waiting for me to join lunch. 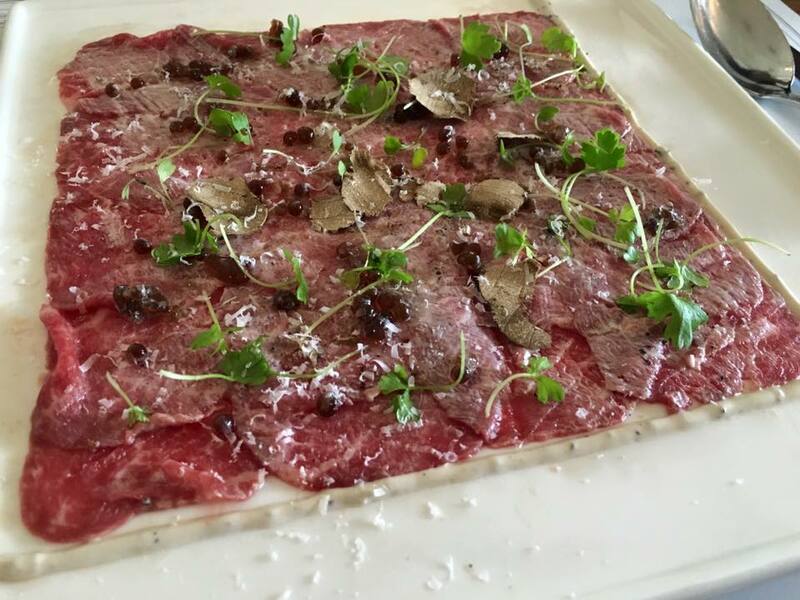 i was here recently with another friend just few weeks back on 30.9.2015.
carpaccio was really good, & just superb taken with the truffle cream. 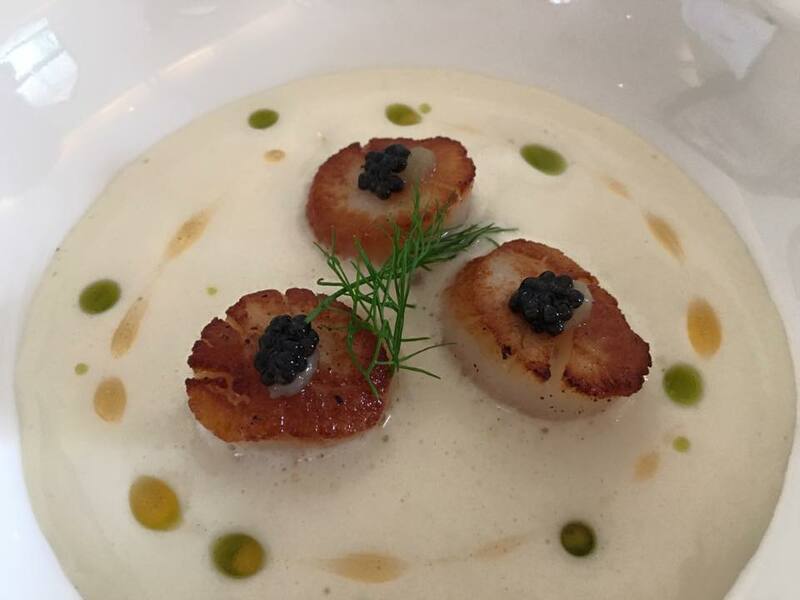 wife ordered the seared bay scallop. 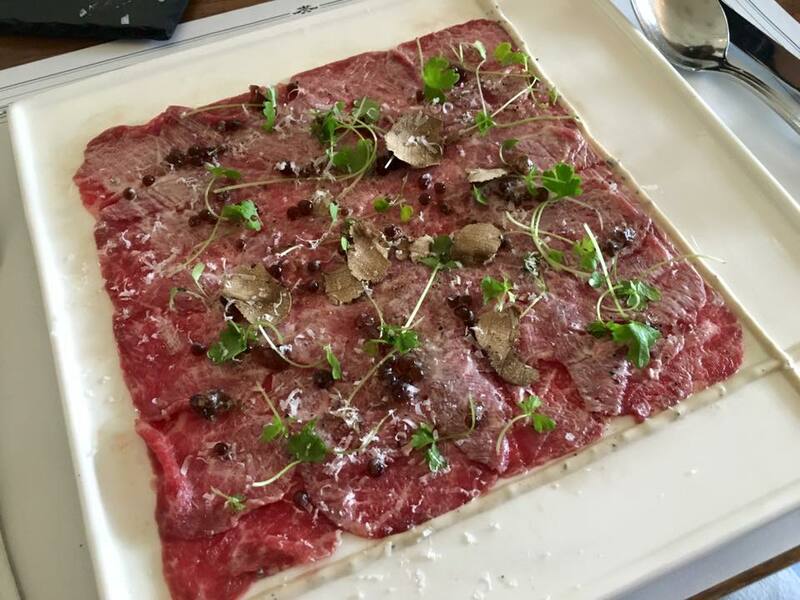 it was competent, but by comparison with the wagyu carpaccio, a rather mediocre dish. scallops were small. 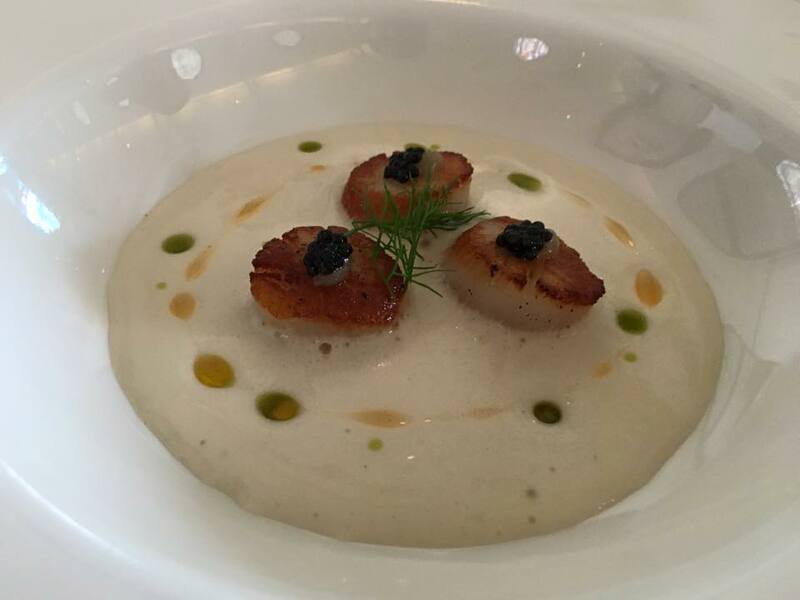 the white veloute was ok.
& no better than my own pan seared scallops really. i used IQF (individual quick freeze) scallops but my scallops were much larger, double the size. actually i think mine was much better. 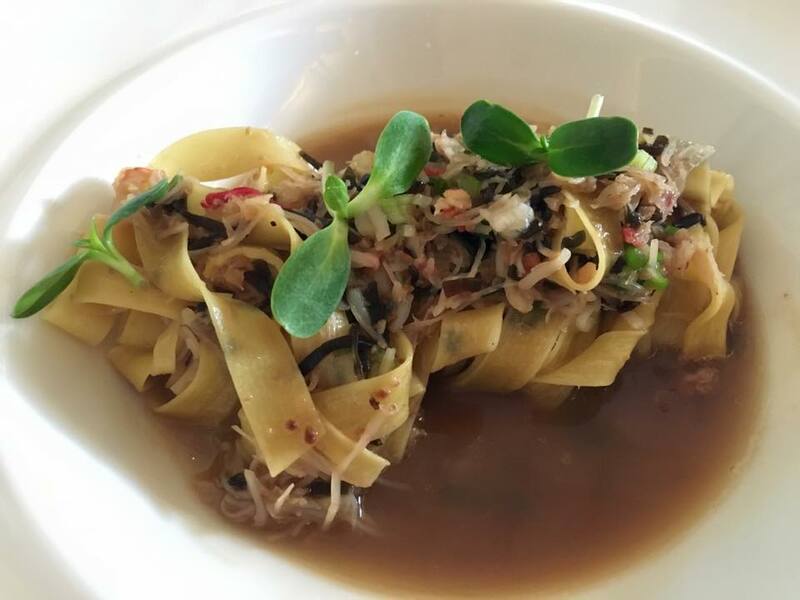 the alaskan king crab tagliatelle with pork broth & konbu was good. chocolate was a good match i guess, but i could do without. 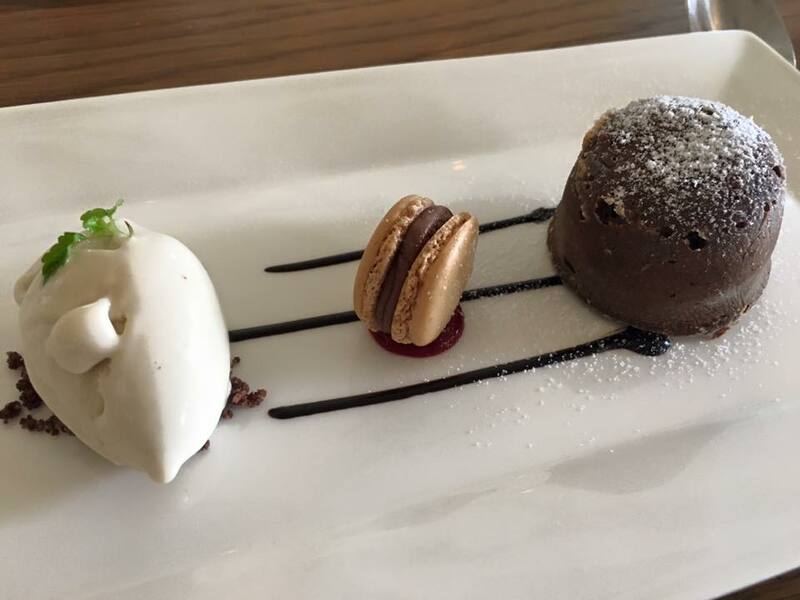 the chocolate fondant was kind of below expectation for me. no much lava at all. 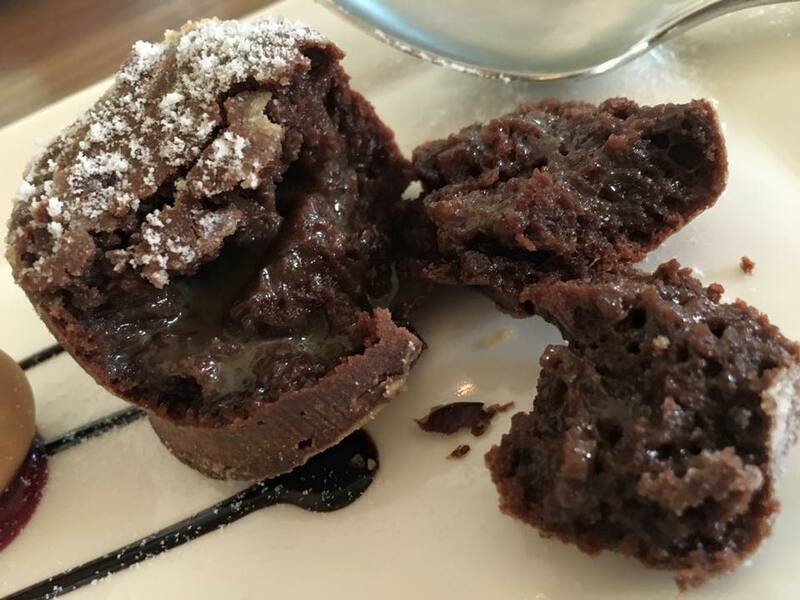 flavour wise i think my own chocolate lava cake also better. 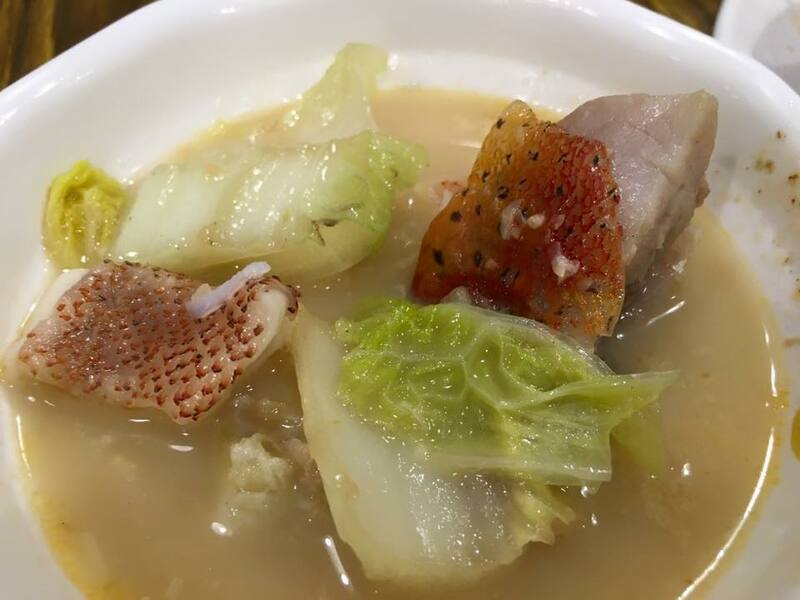 overall, i think it was really a superb value quality 3-course set lunch at S$21pax after uob 1 for 1.
at the full price, it was actually ok quality but nothing special, so not something i would be much wowed bu. 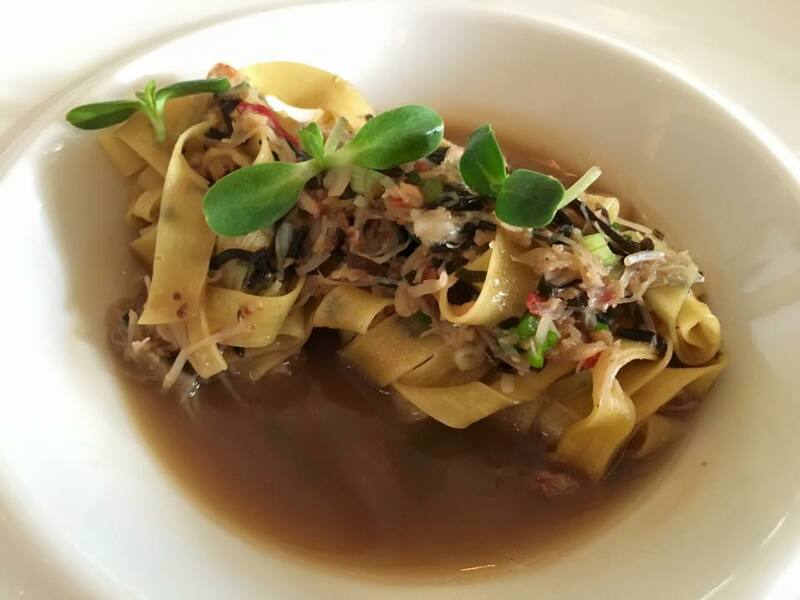 eg if you (say) c/w les amis 4-course set lunch at S$45, les amis would be a lot better deal. 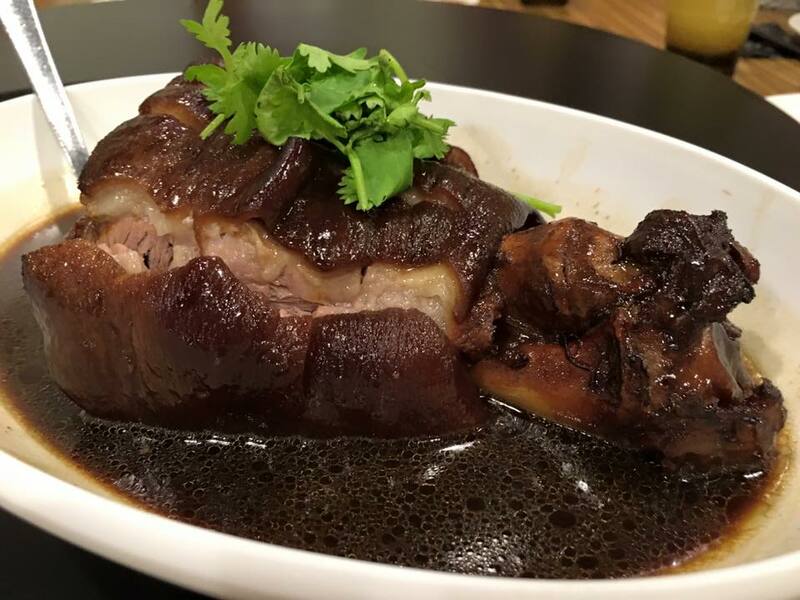 of course les amis doesn’t have this now, but the point is that is it is S$42pax then i would be looking around first none too anxious to try it. 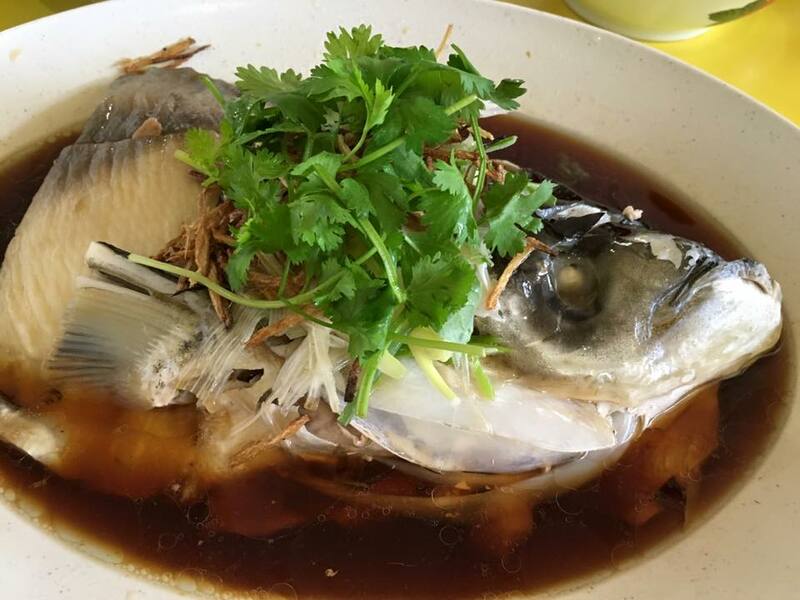 we were at mei ling market & food centre & had the S$13 song fish head hk steamed 港蒸松鱼头 at hong man ji delights 鴻满记小吃. 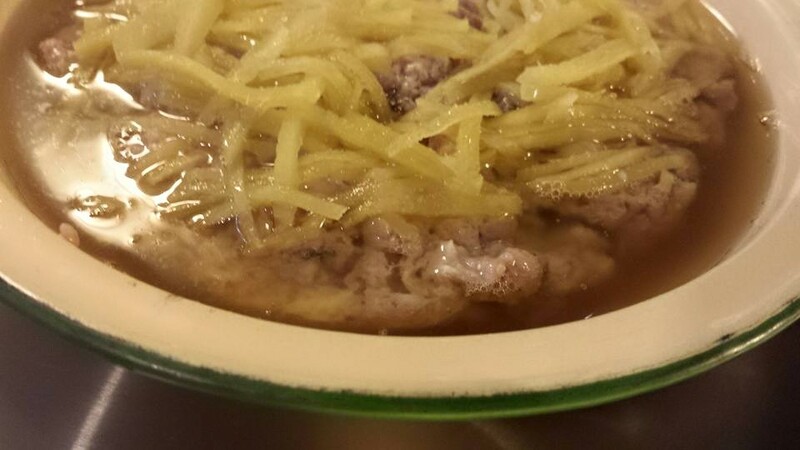 & also pig trotters & pig liver & kidney soup (below). 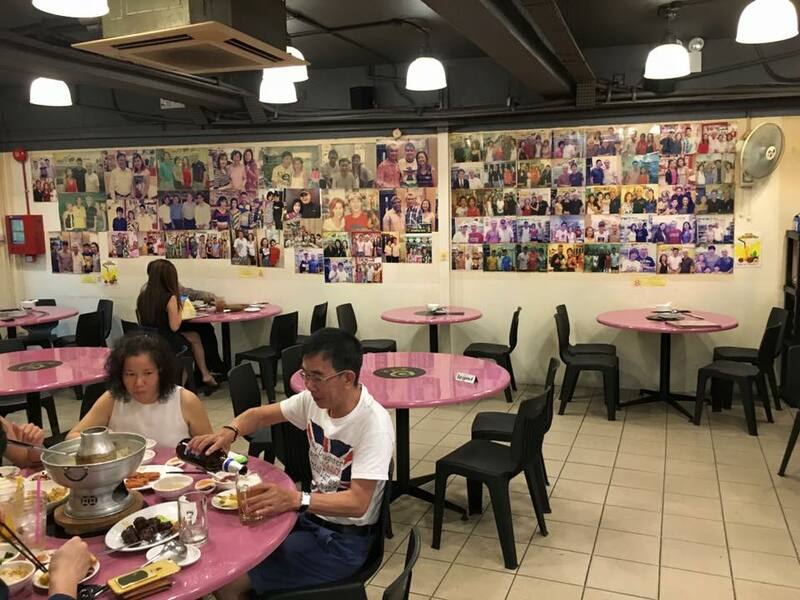 the one i usually goes to is at adam road food centre. 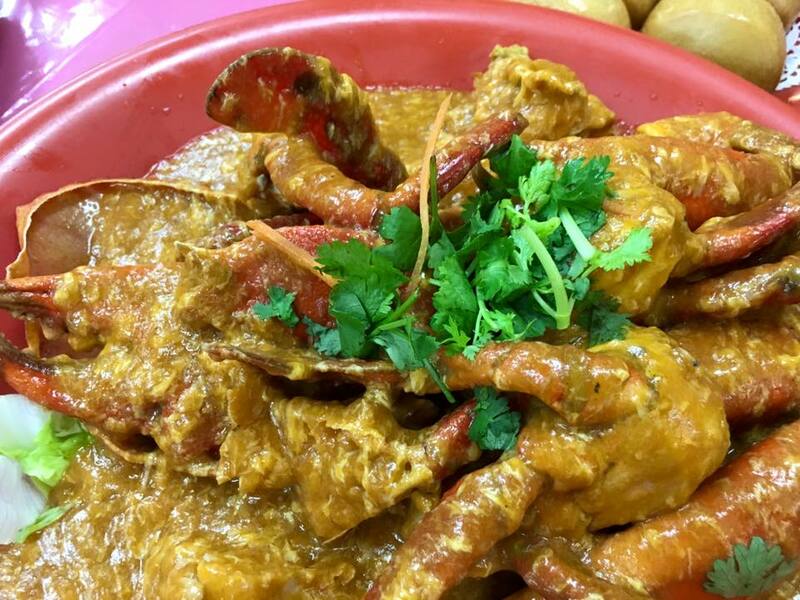 that is S$2, the usual price charged in most food centres. i was thinking maybe they have a thing or 2 to learn from adam road when the lady hardly added any evaporated milk. 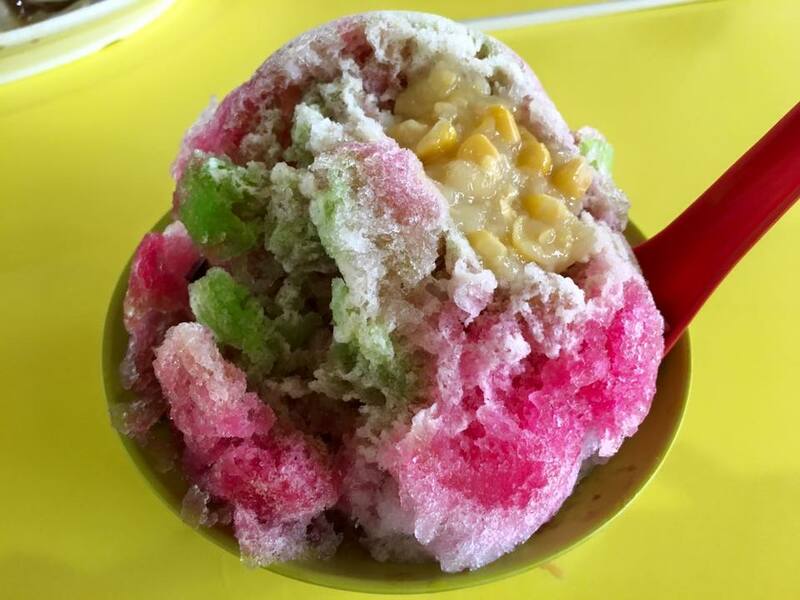 it’s like just a trickle whereas adam road pour like 20ml…lol.. onto the ice kacang. 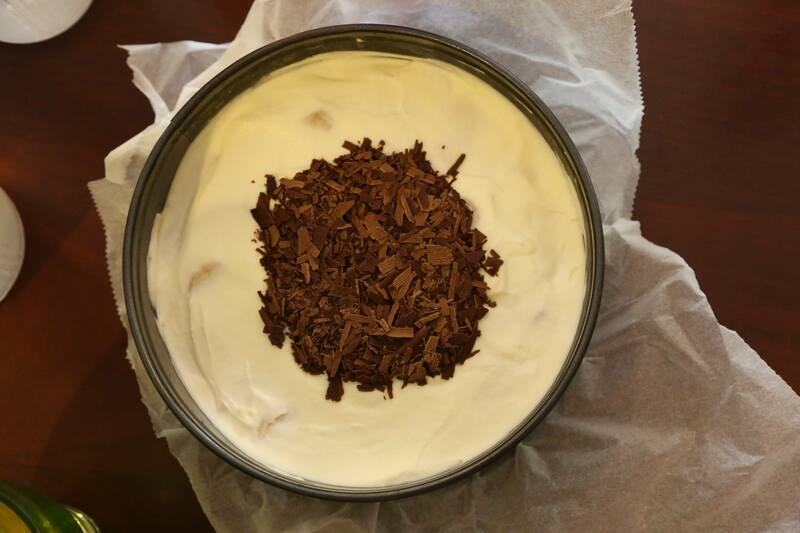 surprisingly though, it was very good, even though i still prefer more evaporated milk. haha! & that’s why i decided to record this. 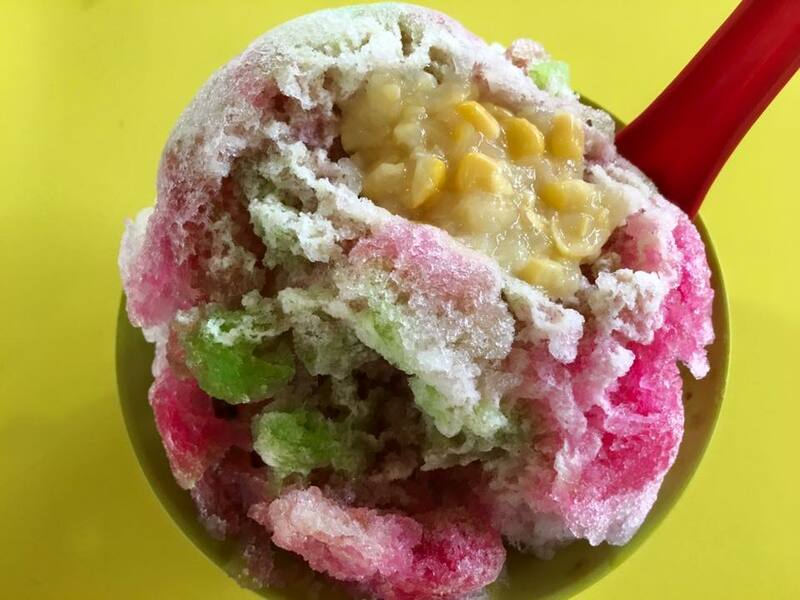 a good ice kacang. 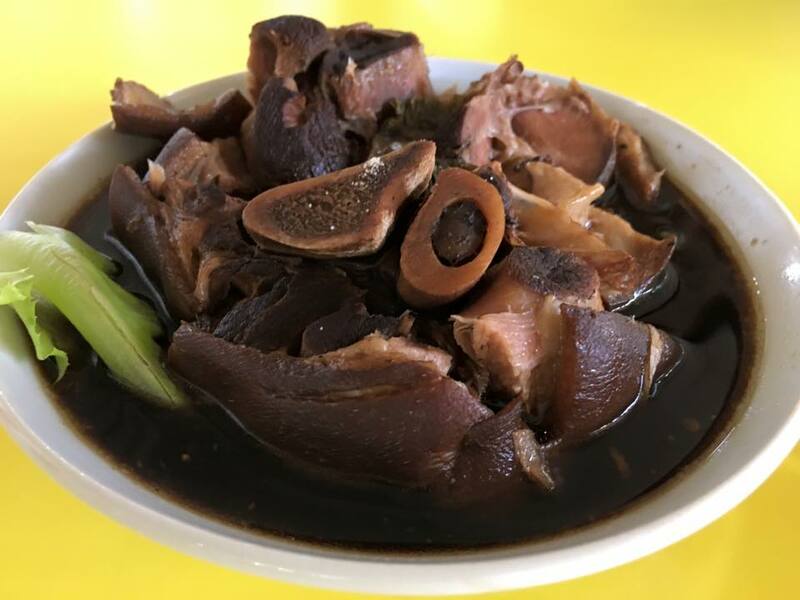 to add to our song fish head hk steamed 港蒸松鱼头 lunch, we ordered pig liver & kidney soup & pig trotters from the stall selling them together with bakuteh & kueh chap. 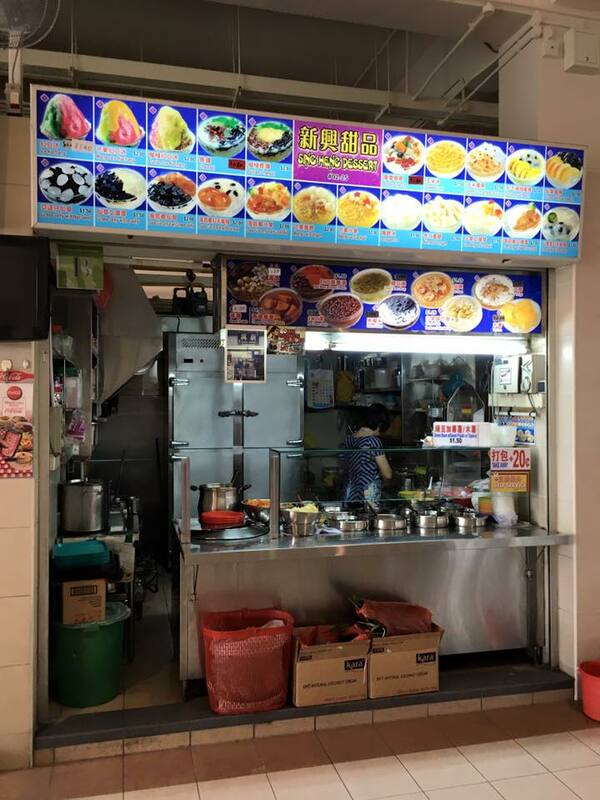 the stall proprietress is a vietnamese. 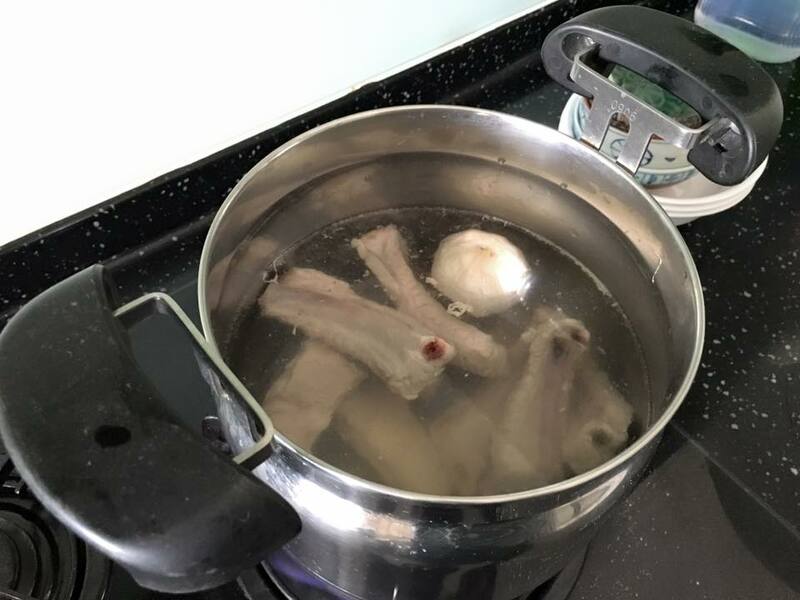 the soup was tasty, so maybe the bakuteh would be good. i won’t really want to try because the pig trotters was really bad & i lose confidence on the stall. the pig liver & kidney were so so. i had much better ones…. the pig trotters i think was a disaster! the braising sauce was tasteless. how could it be tasteless? when i saw it, the colour & look were all wrong. maybe the taste & texture would be ok, but they were not, downright bad! there was no gelatine texture & bite. definitely a stall i will not try again. 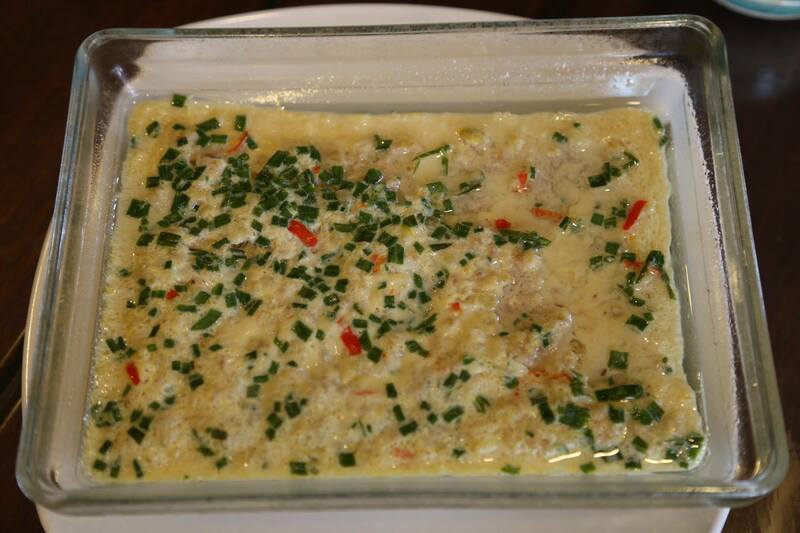 the spicy tau jeon sting ray was my first attempt. 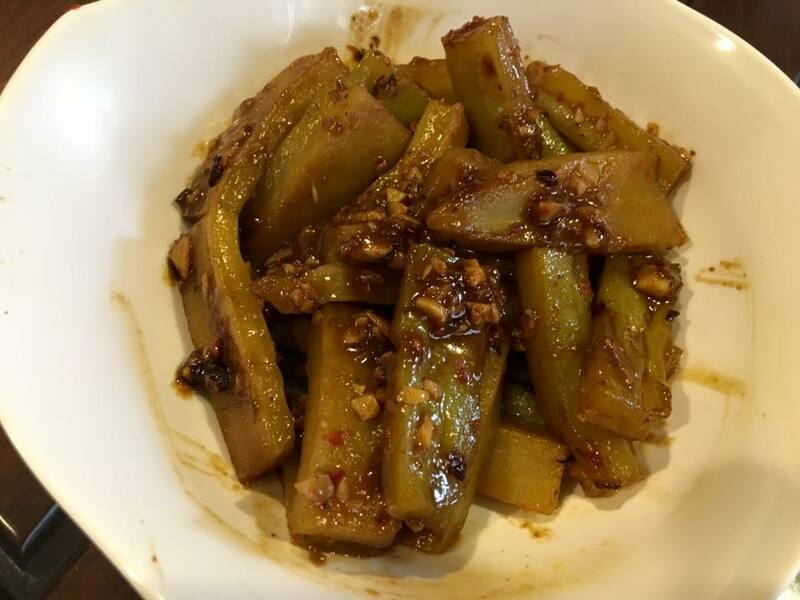 very tasty with the salted vegetables & spicy bean sauce. 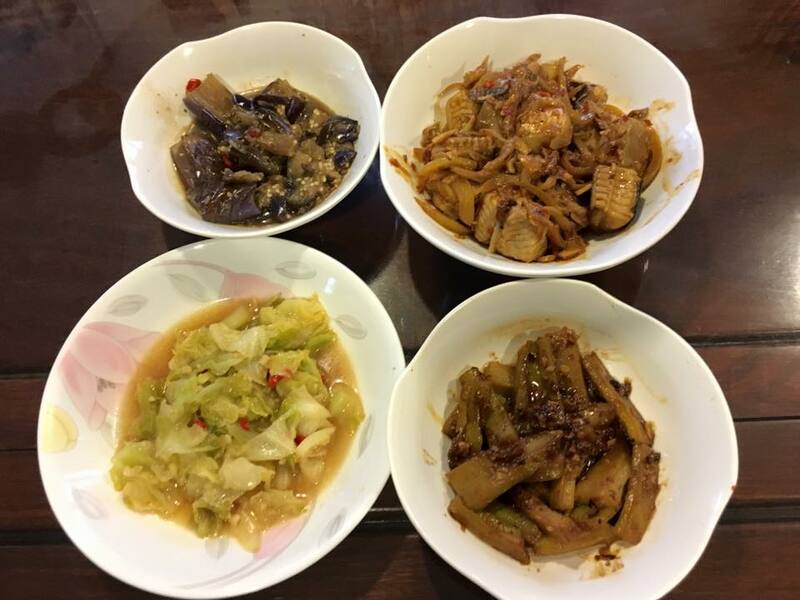 i did about the same for the other 2 dishes – stewed cabbage & stewed egg plant. 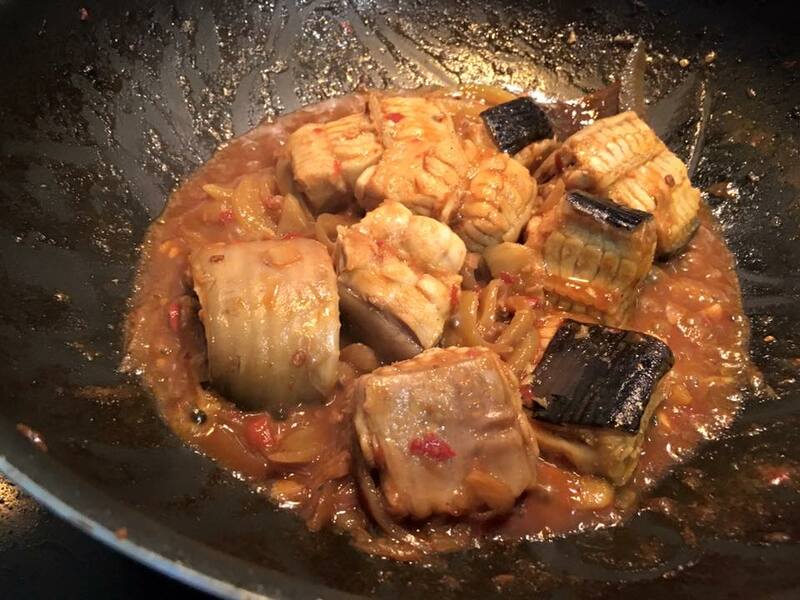 basically add cut chilli padi, chopped garlic & fry, then add the vegetables, oyster sauce, fish sauce or light soy sauce, then add stock, cover & reduce. they were both very tasty, though nothing special. 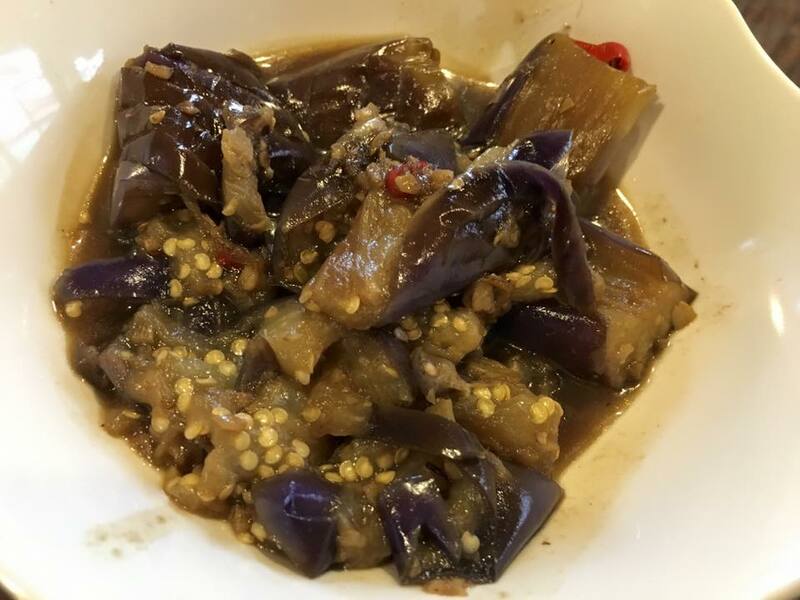 the egg plant was my second try. this time i did not add tomato sauce. 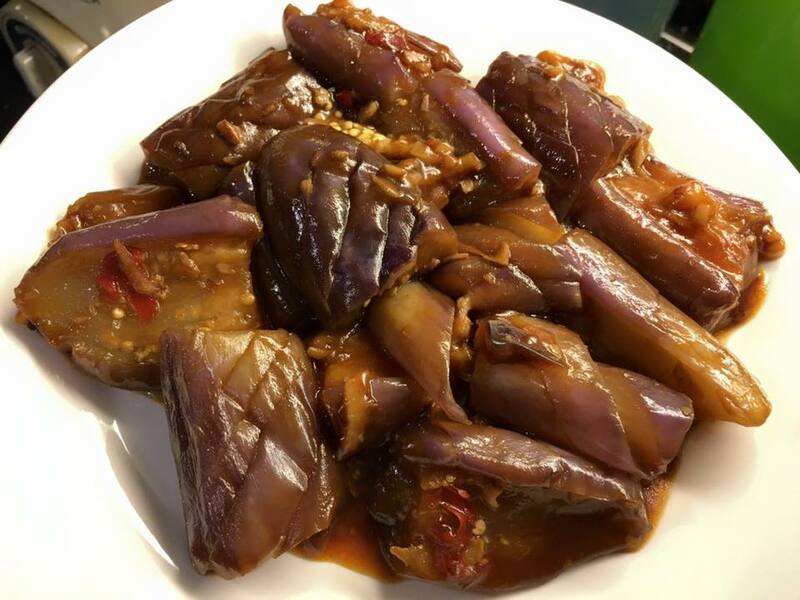 but the taste still different from ye shanghai’s excellent egg plants. 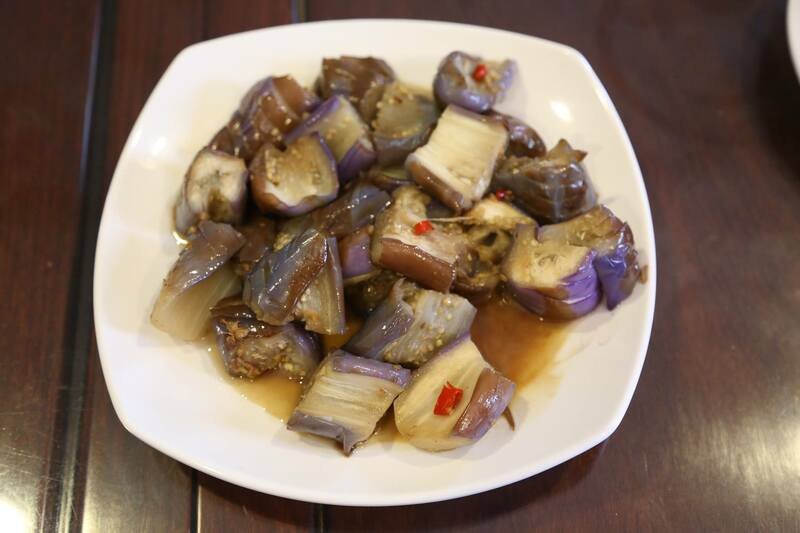 the egg plant was not as tasty as the wafu 和风 egg plants i did previously. 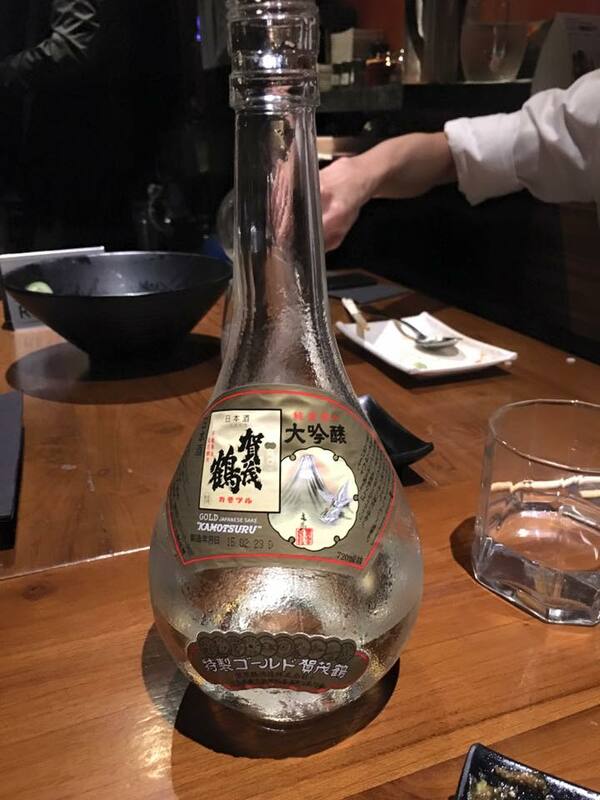 maybe i will try tsuyu to replace light soy sauce. each dish takes about 10-15mins, so i did all 5 in about 1hr. not too difficult & very enjoyable dinner with wife & daughter. it’s a place i wanted to try but never did. it seems it was the same with the organiser as he was overseas when a group of friends went & sent him nice photos. i told him 1 of the pluses of G20 was we get try places we somehow didn’t get to go ourselves. 3 of us decided to go early for a cuppa at the wheeler’s yard. i took flat white. strong coffee with very smooth frothed milk. i liked it. 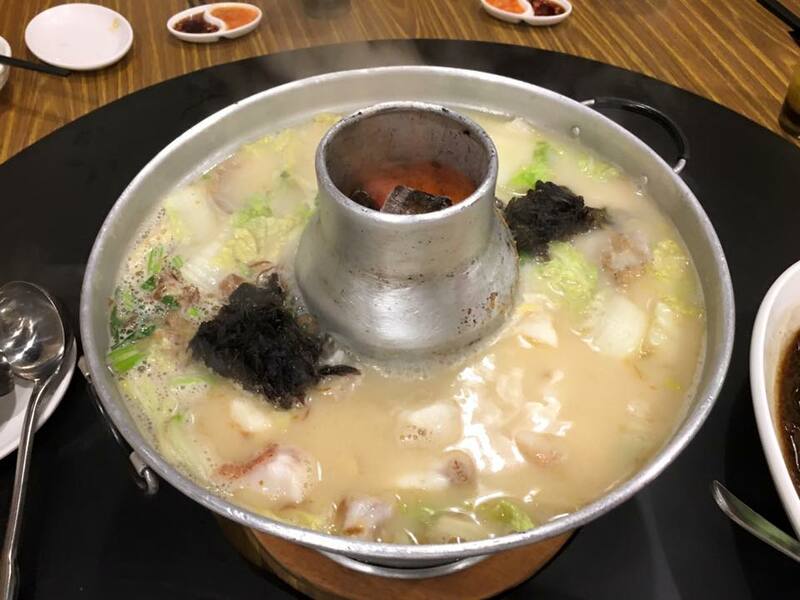 after our cuppa, we drove over to whampoa keng fishhead steamboat. i parked at ah hood gardens (HDB) along ah hood road (lots of parking) & got to the restaurant before 7pm. 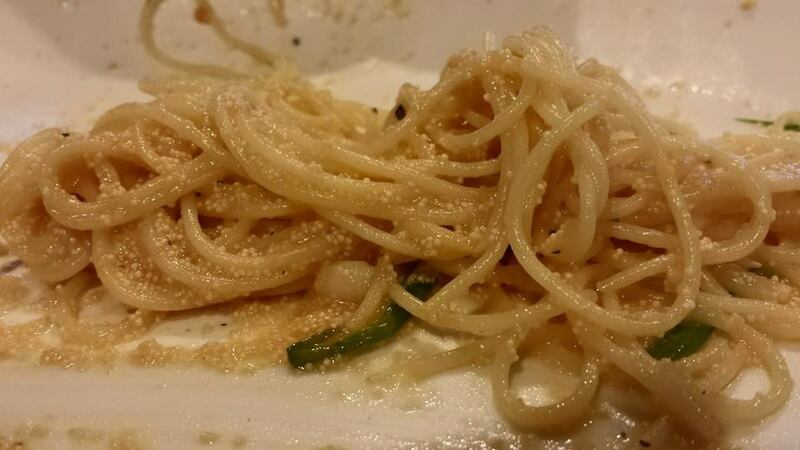 our friend the organiser ordered a S$288set for 10, and changed some dishes. 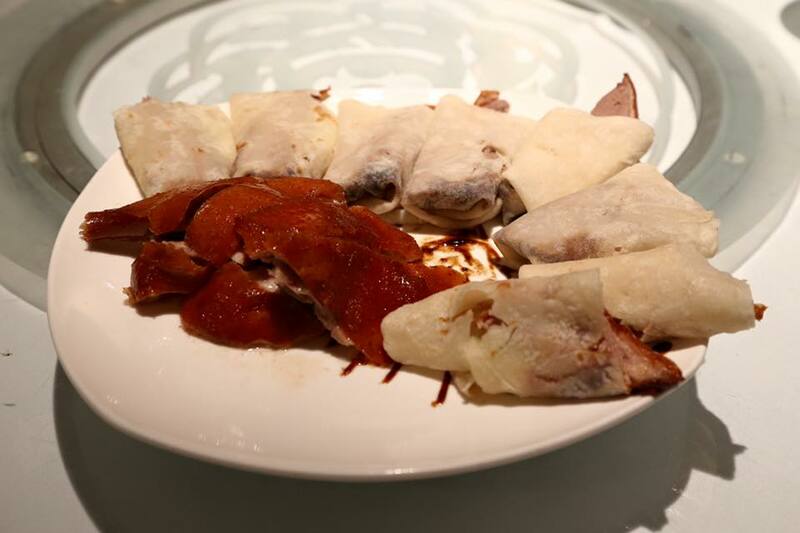 the signature braised pig trotters replaced the salted egg sotong. excellent call! 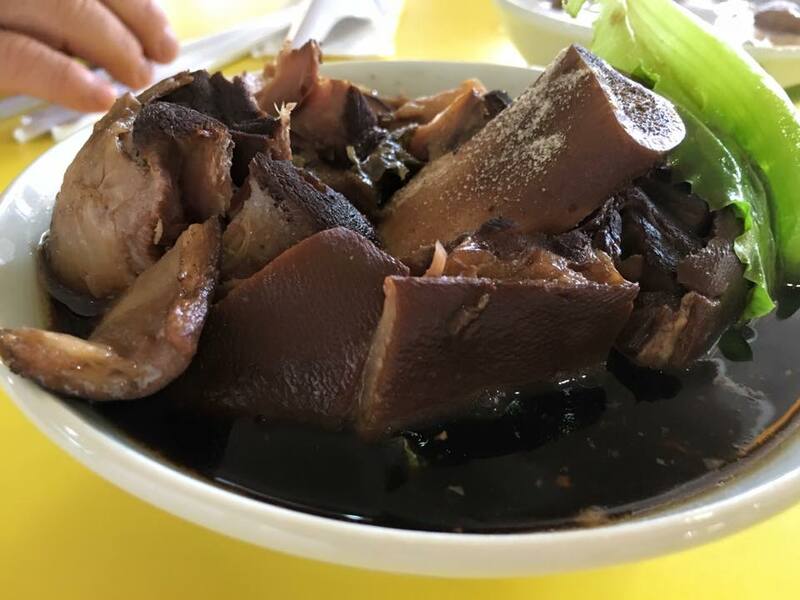 this pig trotters lagi shiok! 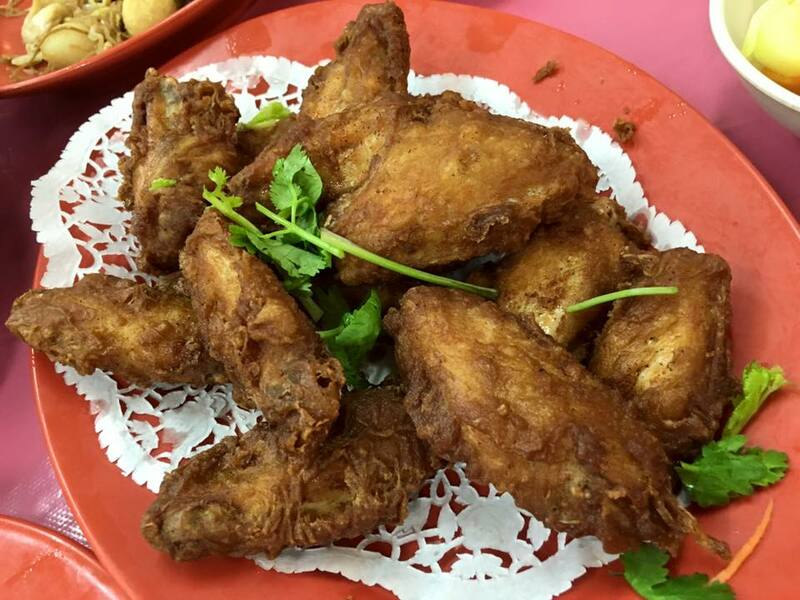 the best of texture not overly soft & mushy & tender meat falling of the bones. my friend liked the star anise flavours. for me that was just slightly over. 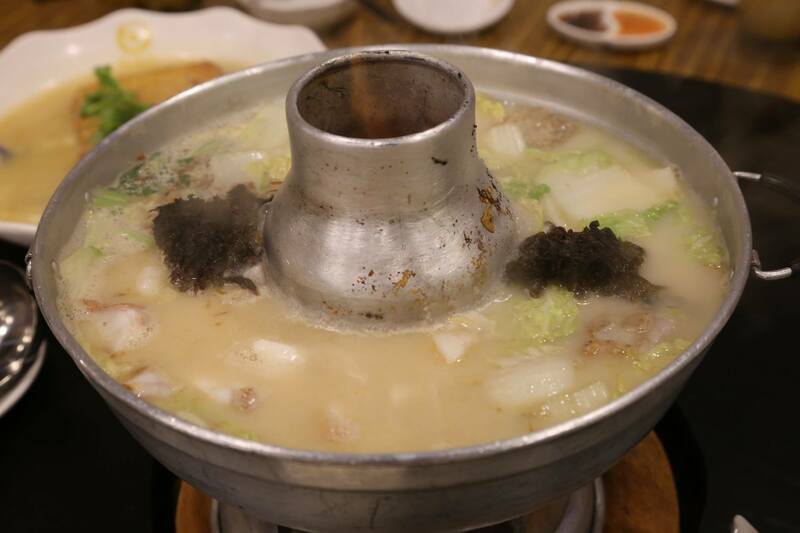 the best undeniably was the fish head steamboat. 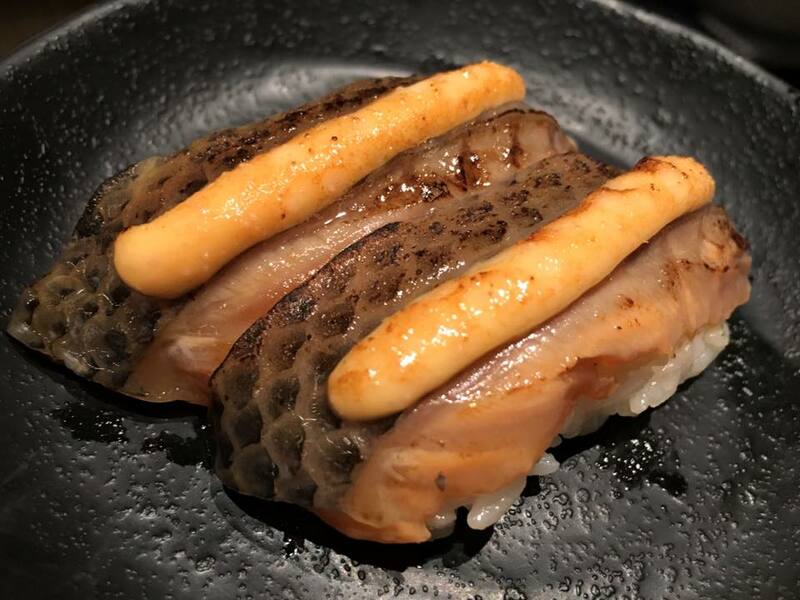 my friend ordered the red garoupa. & the refills were also not just water or light tasting soup, but almost the same intense stock. 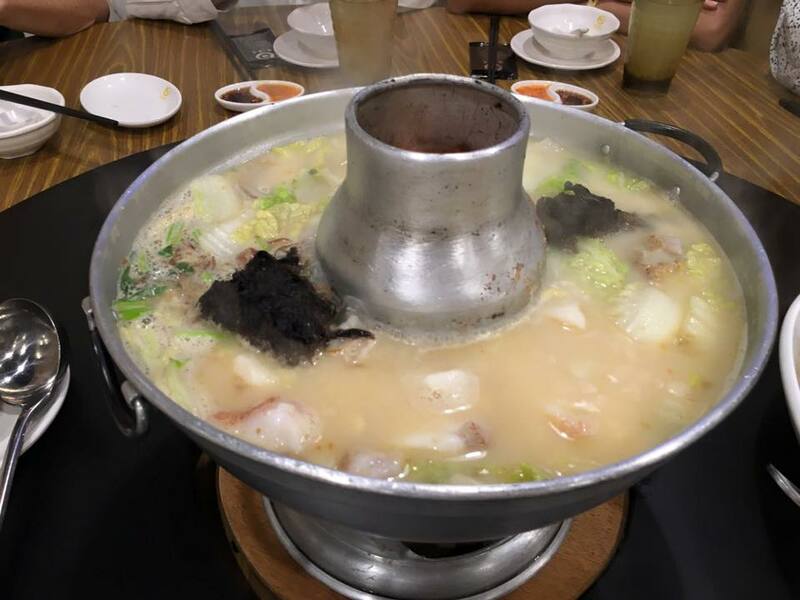 i guess the same stock minus the additional taste from the steamboat content. 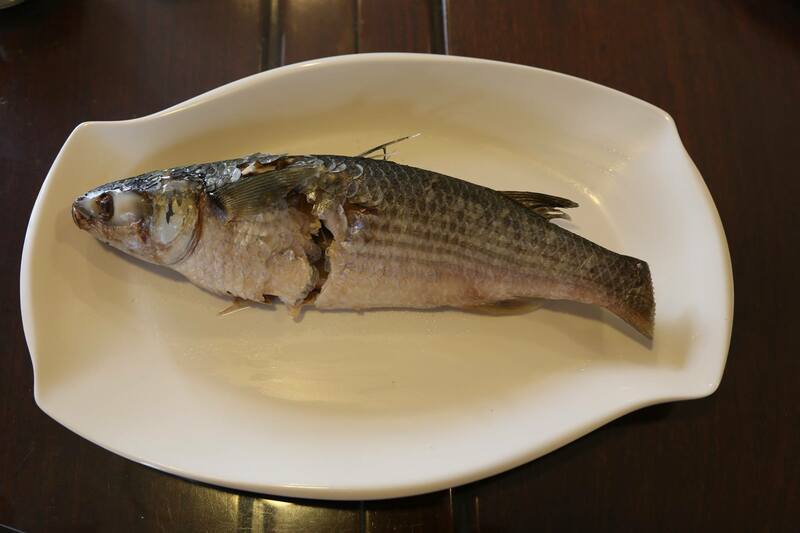 not sure if it was just the head or a whole fish but it came with lots of meat too. 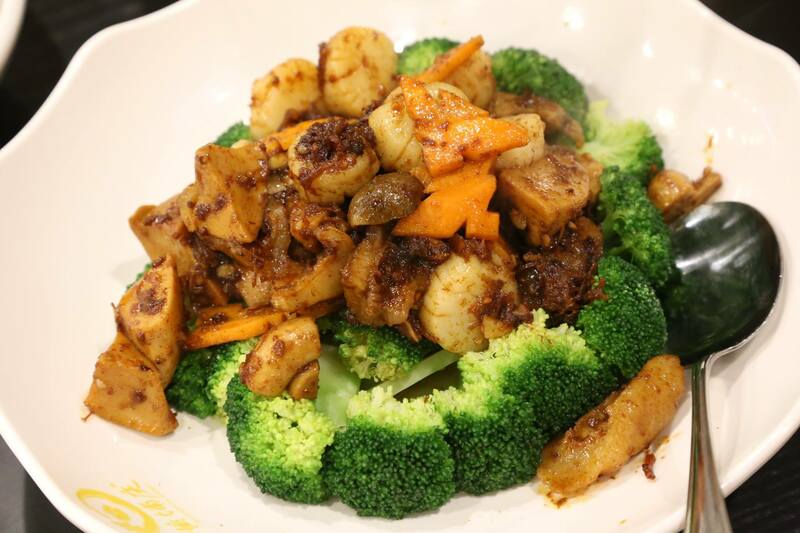 the stir-fried brocoli with scallops in XO sauce was a pretty nice dish. there was a good serving of scallops. & there was also something that tasted like the cheaper canned shellfish. 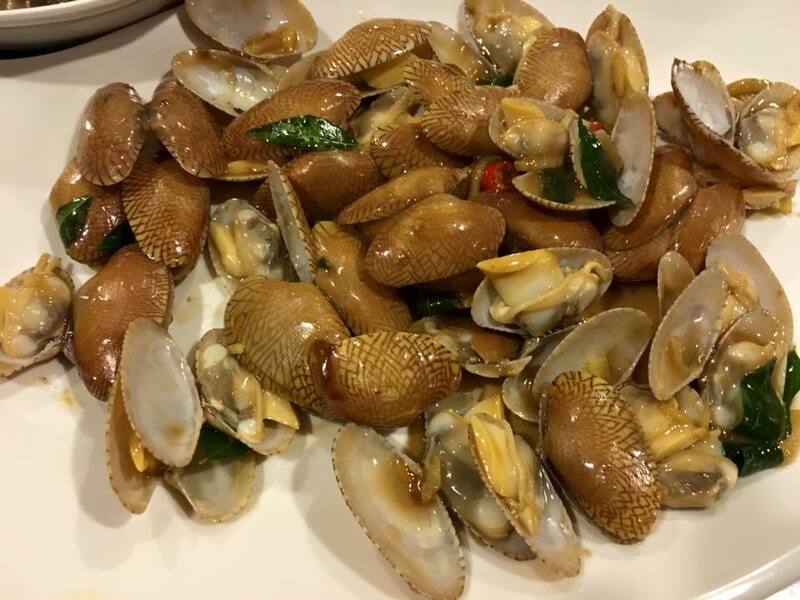 a friend thought it was gluten but i felt that the texture was shellfish. not sure. 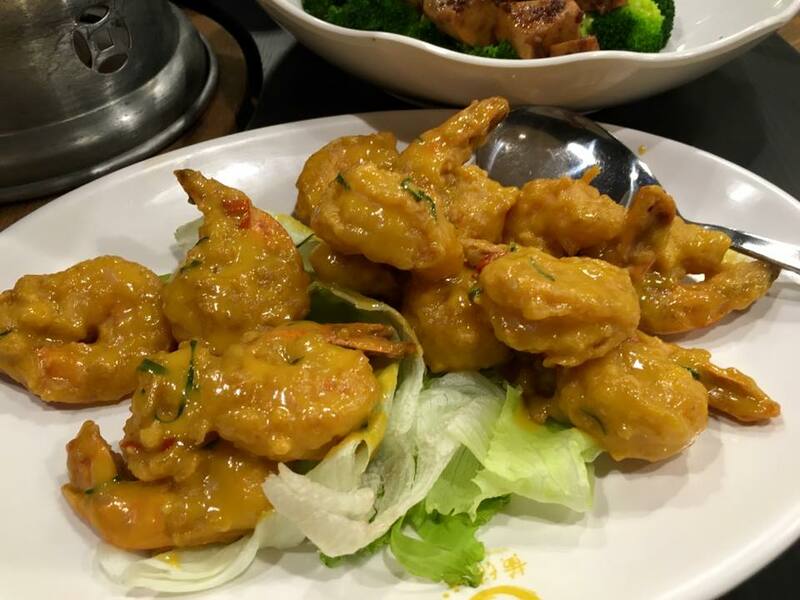 my friend changed the prawns in the set to their signature salted egg prawns. 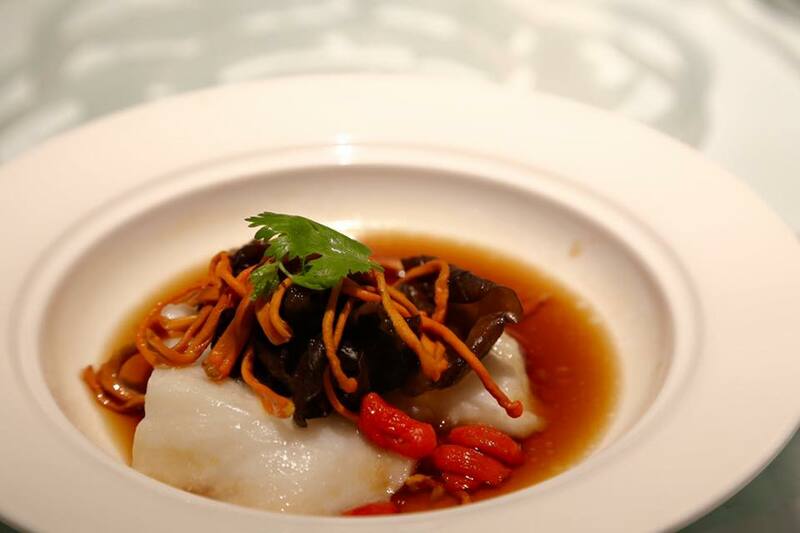 it was a good competent dish, looked nice & tasted good too. 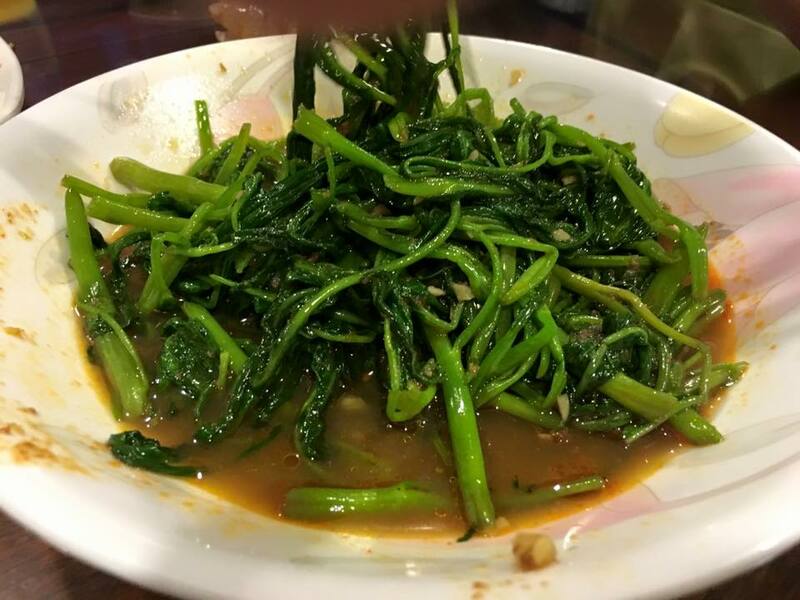 i guess it was nothing special just a standard dish in any zi char or restaurant. 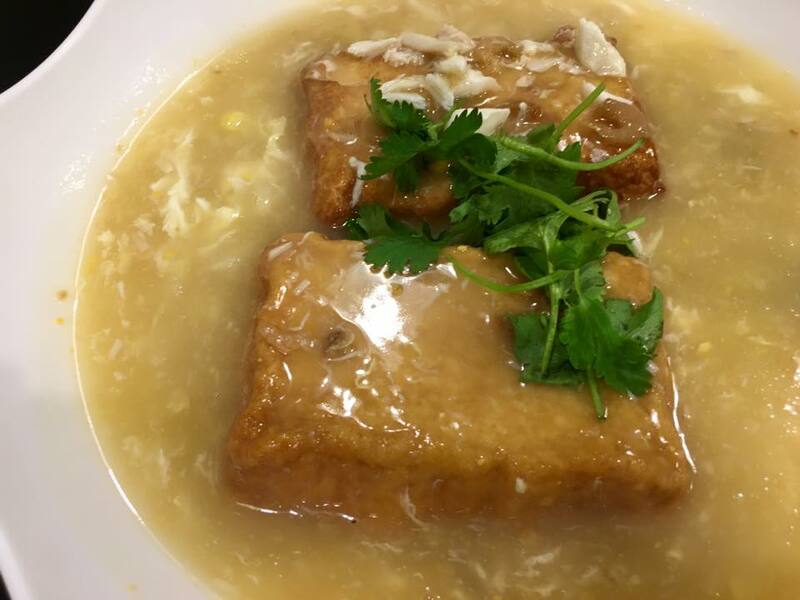 we had a tofu dish. 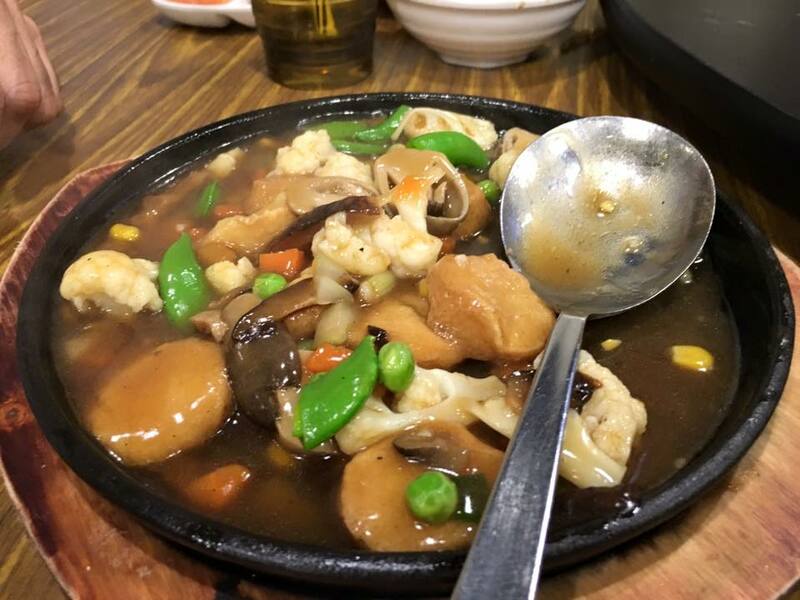 it was apparently a seafood sauce & the tofu was made by blending egg with silken tofu, or so according to other reviewers. didn’t leave an impression with me. 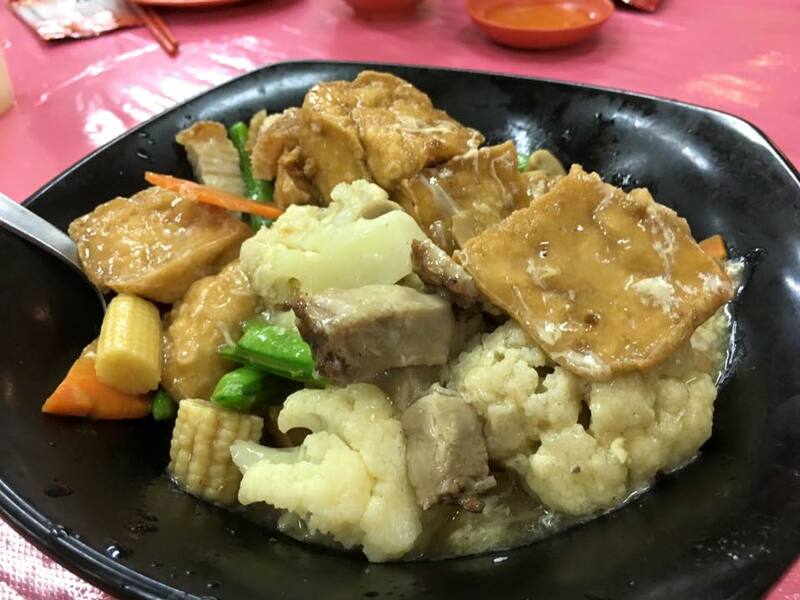 i think the tofu dish at kok sen & also at muliangzai liang kee were a lot tastier. 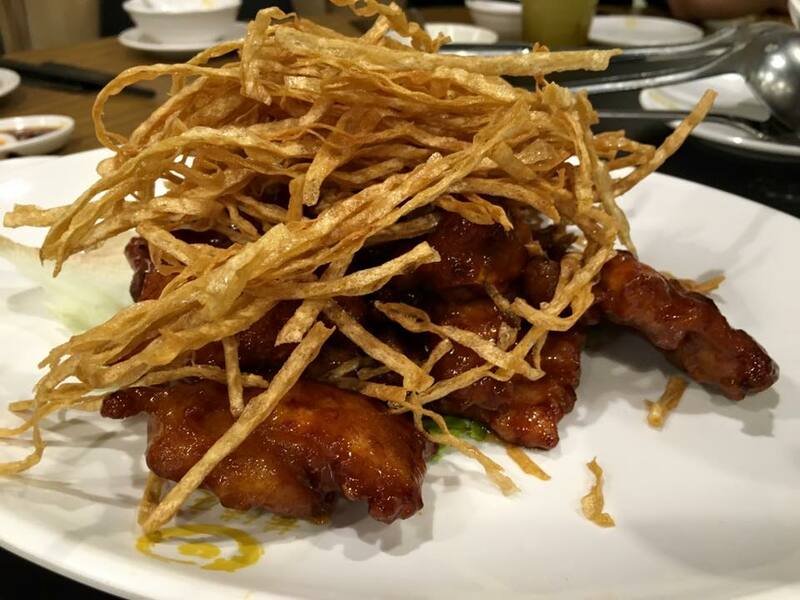 the pork ribs with deep-fried cod strips was another signature dish. 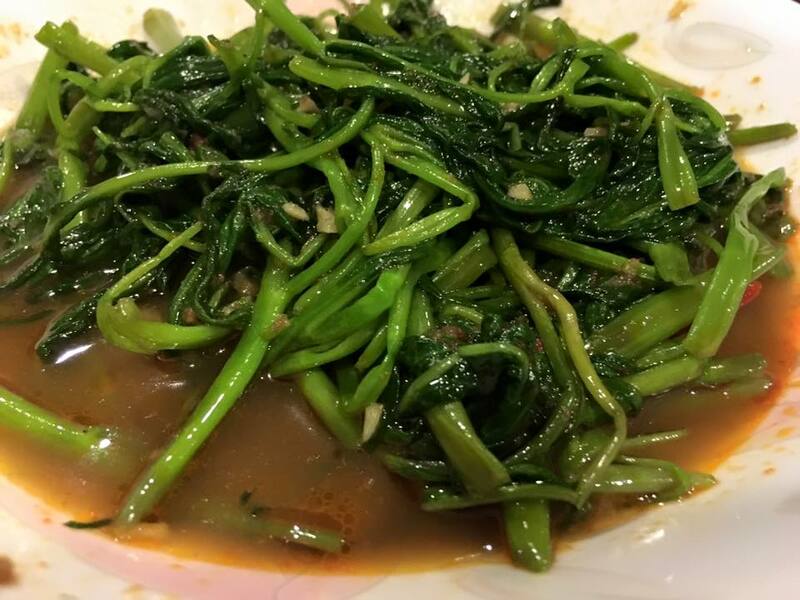 it was competent but like any 排骨王, it’s a passable dish not my favourite. 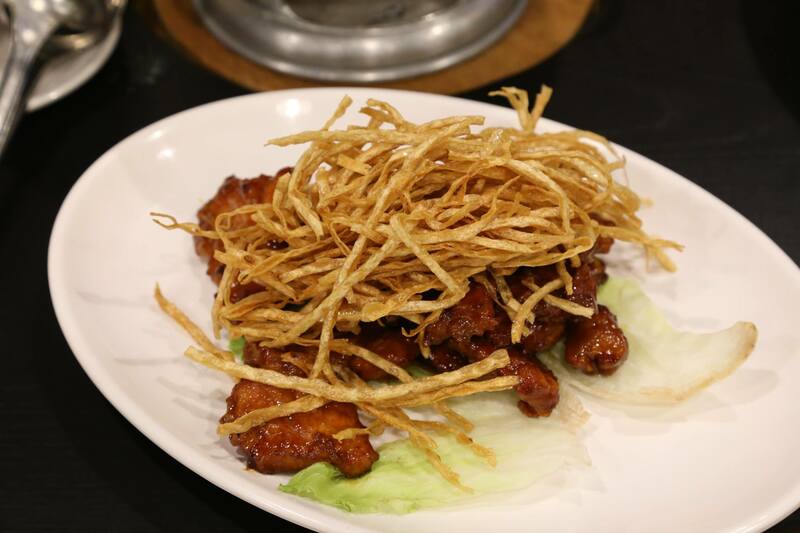 the crispy boneless chicken 金龙鸡 was another signature dish. a friend thought it was too processed. i totally agree! 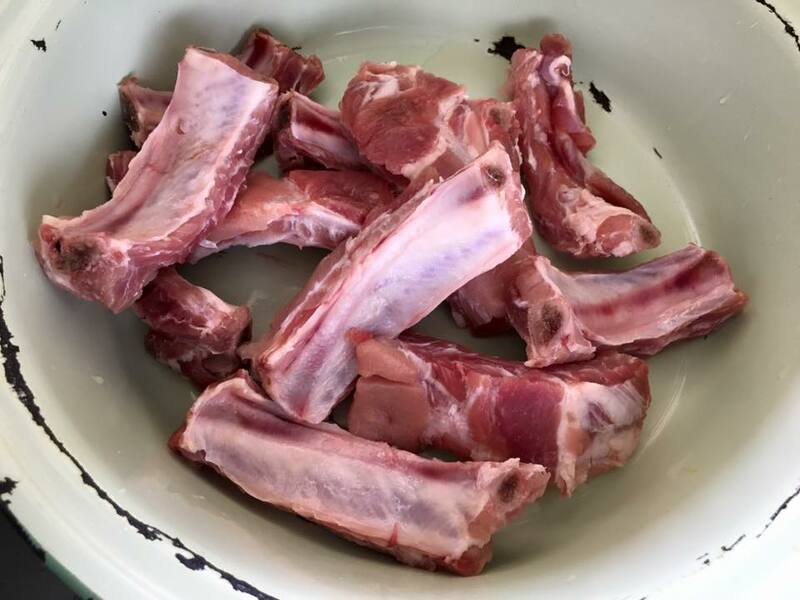 i think i like the “not favourite” pork ribs better than this. 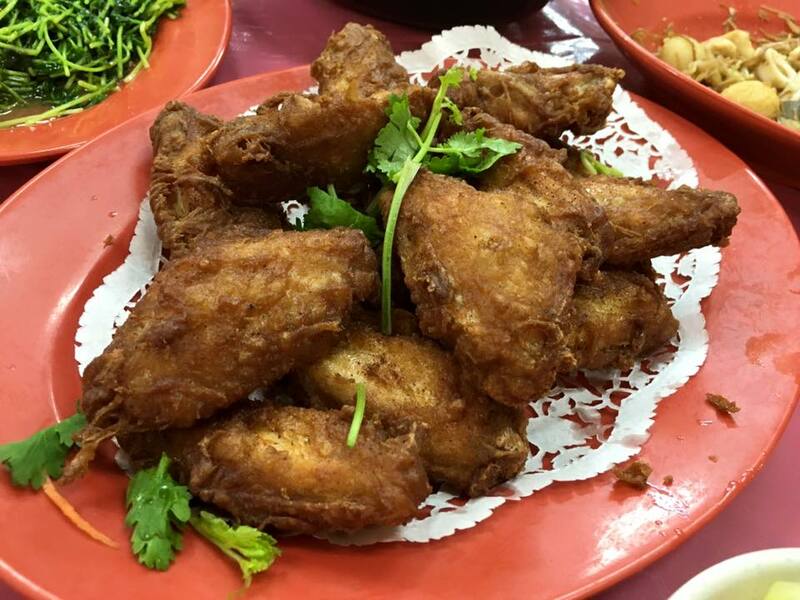 crispy skin was there, but the sweet, moist, flavourful taste of a roast chicken was gone! alas! 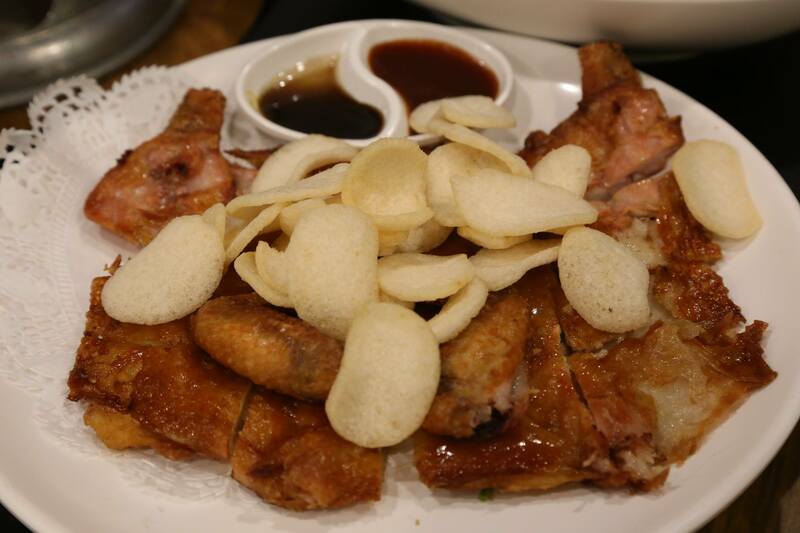 i like my roast chicken at 6th avenue coffeeshop better leh! we had too many dishes liao so did not get to try their 2 other signature dishes – the prawn paste chicken & the hae chor (teochew ngoh hiang). apparently those were quite good. the no. 11 friend is a lacto vegetarian (dairy no egg). he could only joined after 8.30pm. 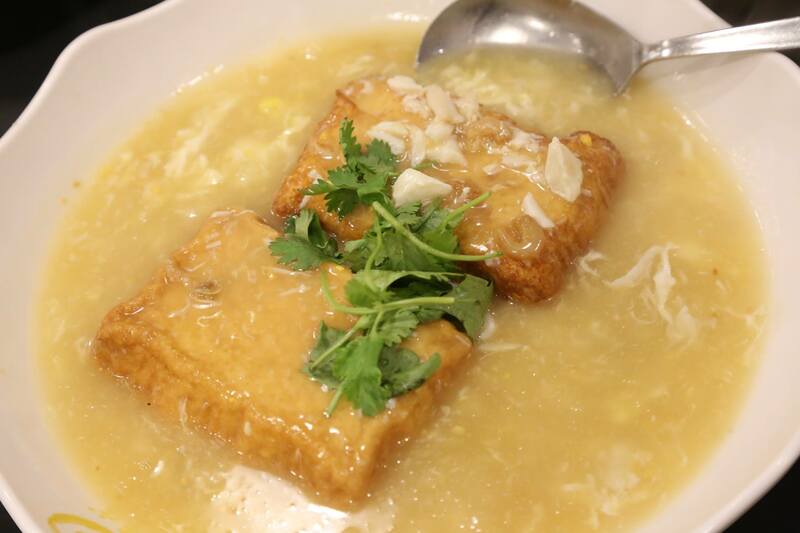 my friend ordered a tofu dish (we didn’t know it was egg tofu). 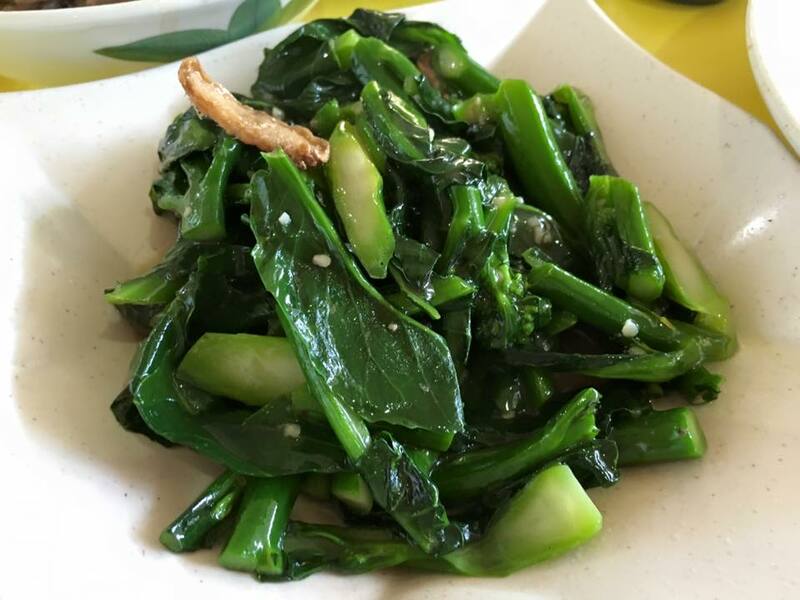 anyway he did not take much & we ended up finishing off the egg tofu & the greens. 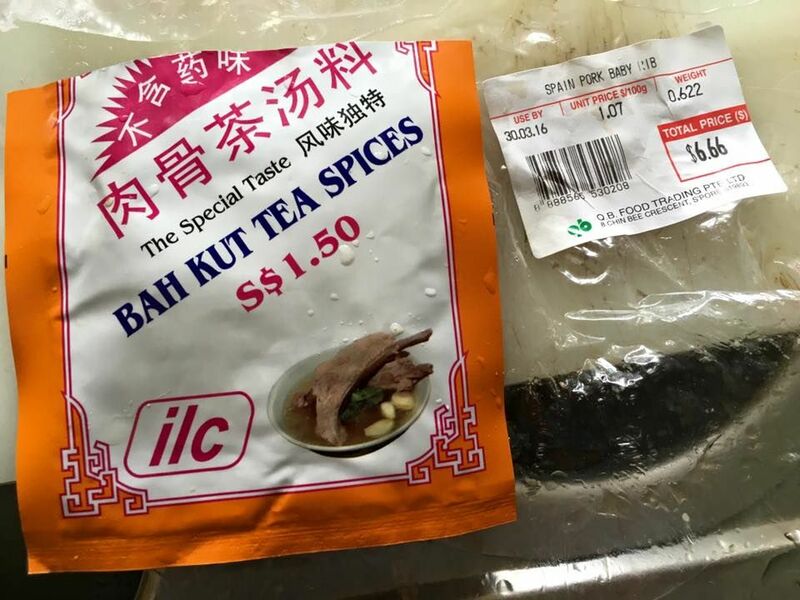 there are innumerable bakuteh spices in the supermarts. i use the cheapest ilc brand S$1.50 for 20g spices packet. this suited the 600g pork ribs i was cooking. for 1kg i use the larger 30g packet. 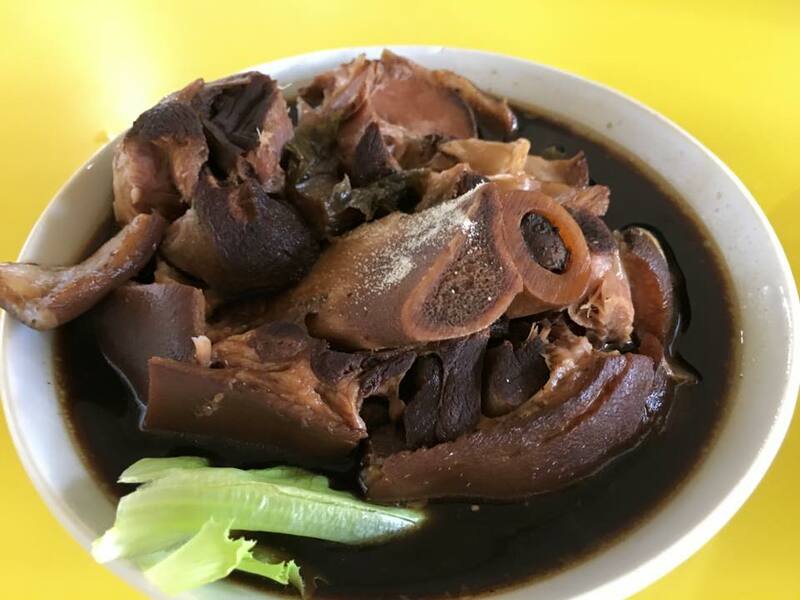 the last time i used indonesia fresh pork from sheng shiong, price around S$19/kg to S$21/kg. 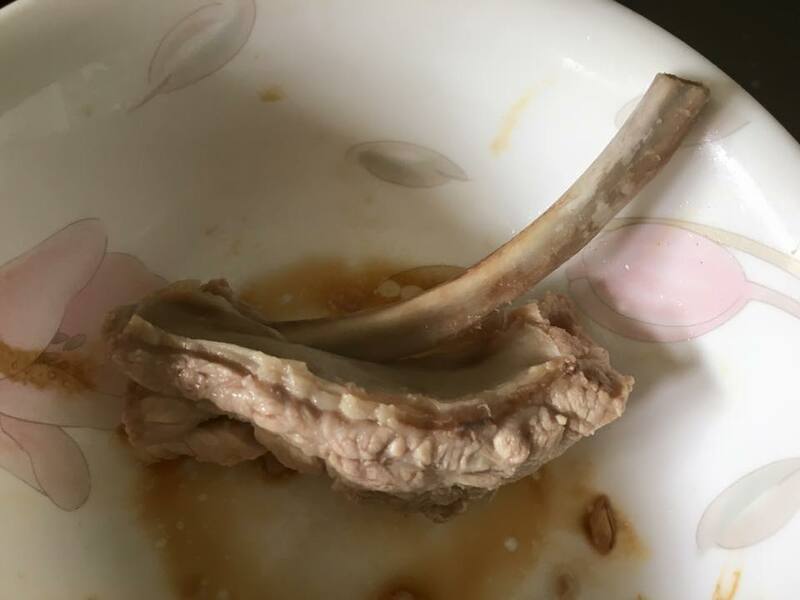 at 40mins or so, meat should come easily of the bone. 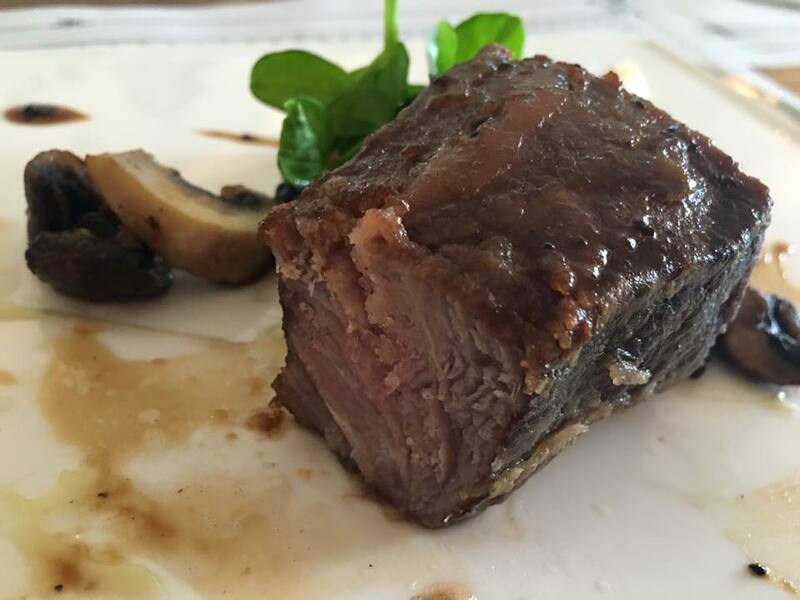 personally i prefer the meat texture to be firm with some bite, rather than completely soft & falling off the bones. 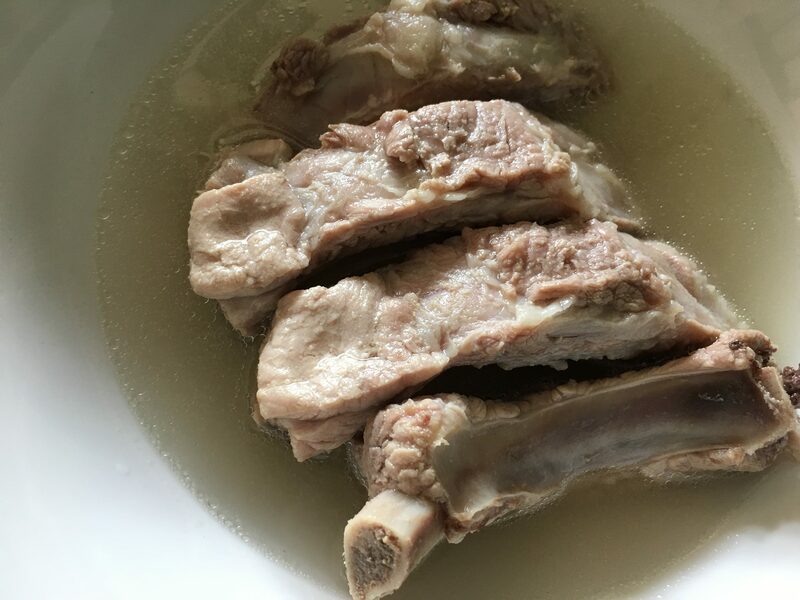 also unless you finish all in one go, you may reheat the bakuteh 1 or more times, so i prefer the ribs not to be overly cooked & soft. 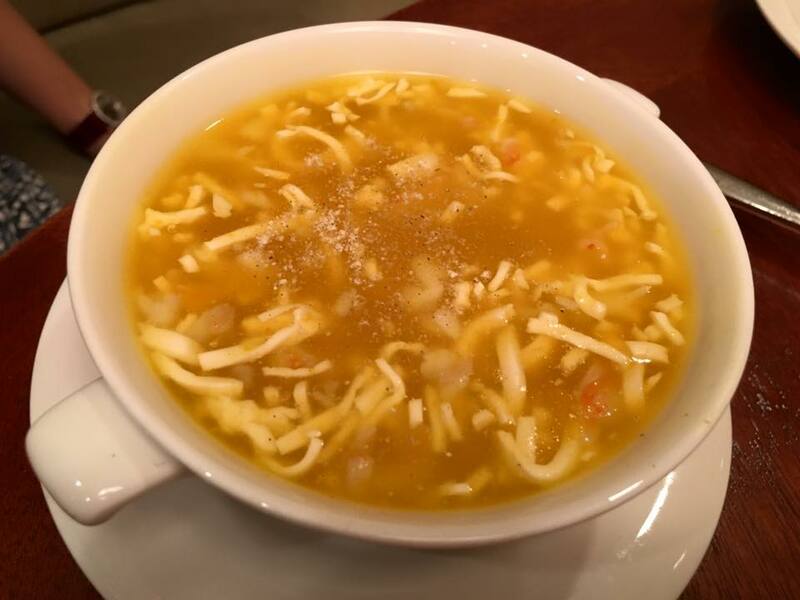 & btw, the soup was just delicious! 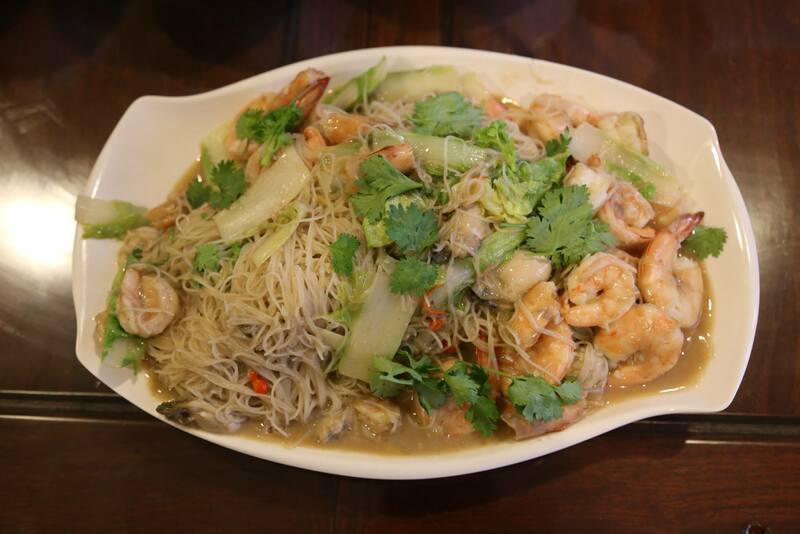 i did not add any salt, fish sauce & light soy sauce as it was salty enough for me. also no need to add pepper seeds. 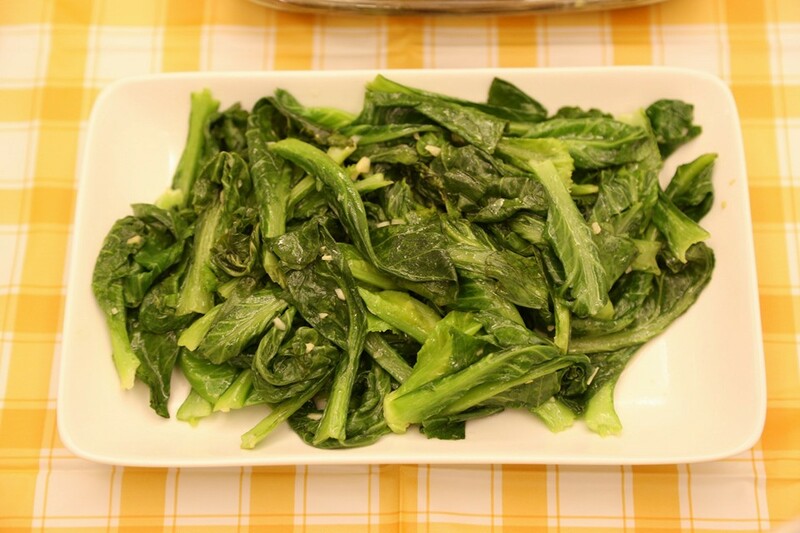 it is already peppery & just right, not overly! 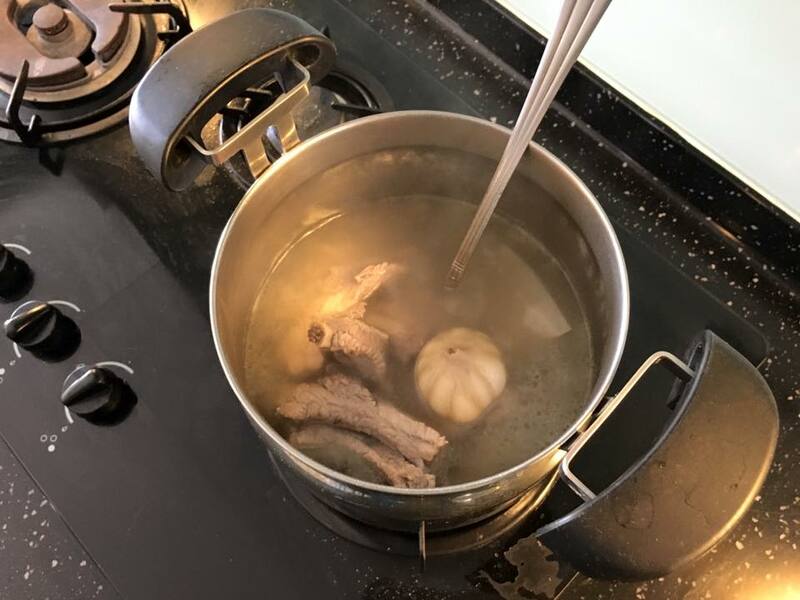 but they were still very good, and with the excellent tasting soup, this home brewed bakuteh was as good as most bakuteh outside except the few very good ones. 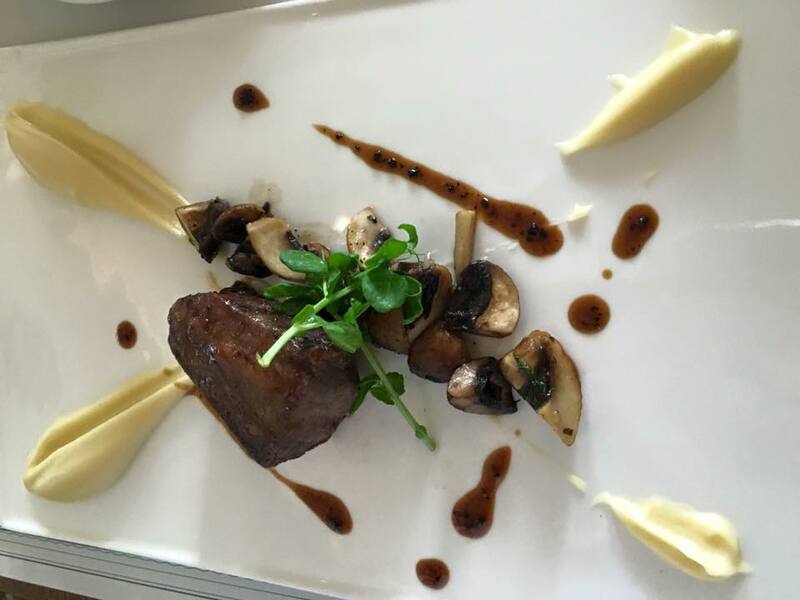 this may not be exactly fine gourmet, but with a bit of plating, it looks good enough to be served as a course meal. for me anyway haha! there were fe customers at lunch. we skipped tea (normal chinese tea S$3pax no harm to have if need), just had complimentary water. 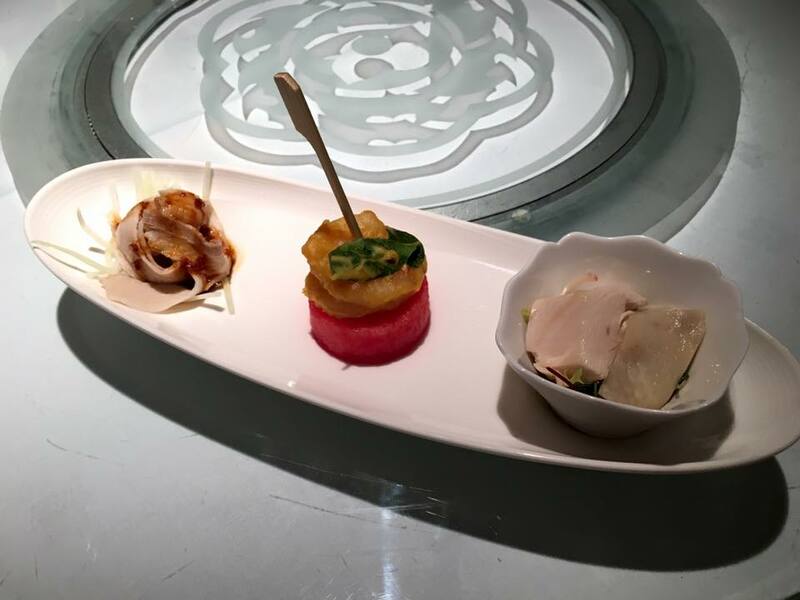 they charged S$1pax so that was ok.
we selected 醉鸡，咸蛋虾，蒜泥白肉 from the choice of appetizers. drunken chicken very good standard. 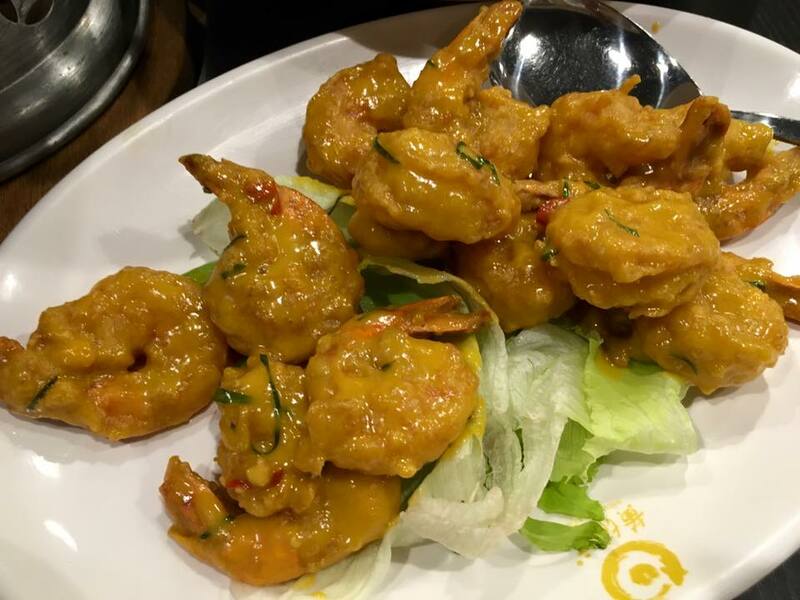 i think 1 friend said the prawn was very good. 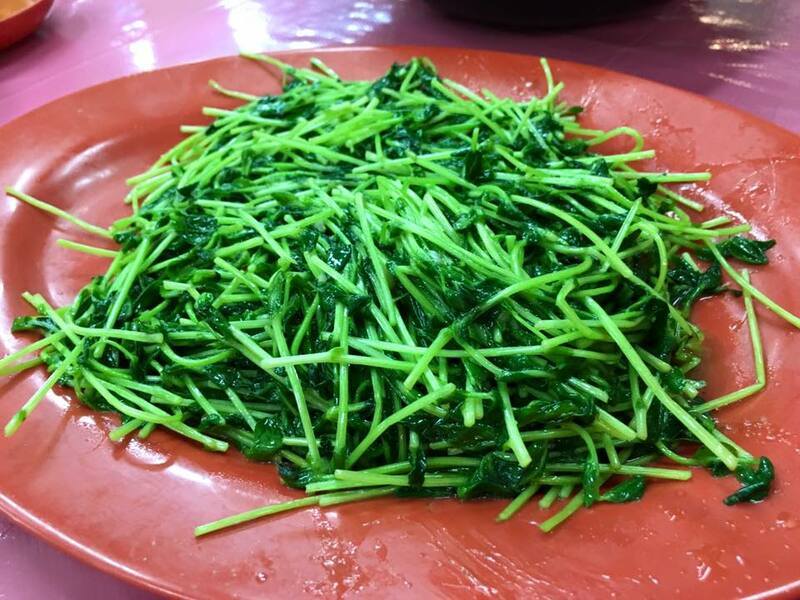 this a common item in chinese restaurants, i did not find it particularly special. 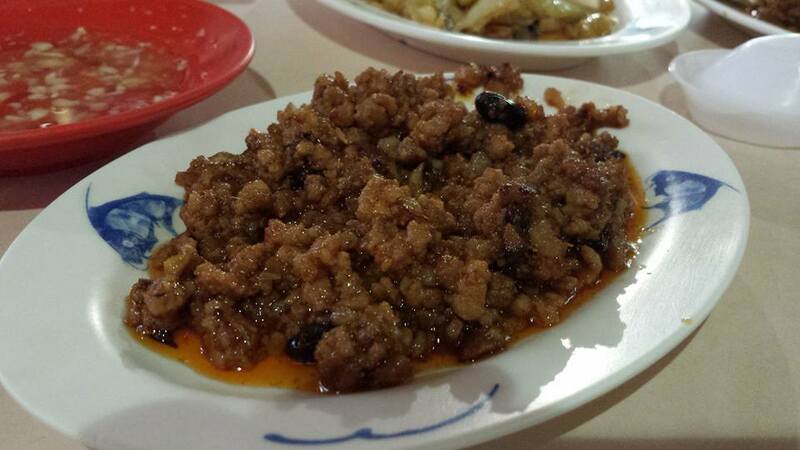 the 蒜泥白肉 minced garlic pork was good i guess, but i didn’t find it special too. 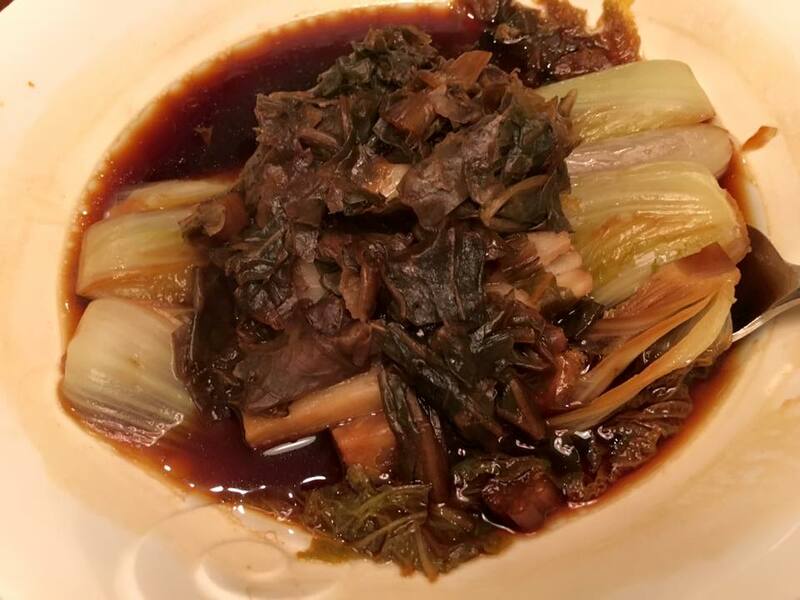 better look but not better tasting c/w my own 蒜泥白肉 though slightly different style. 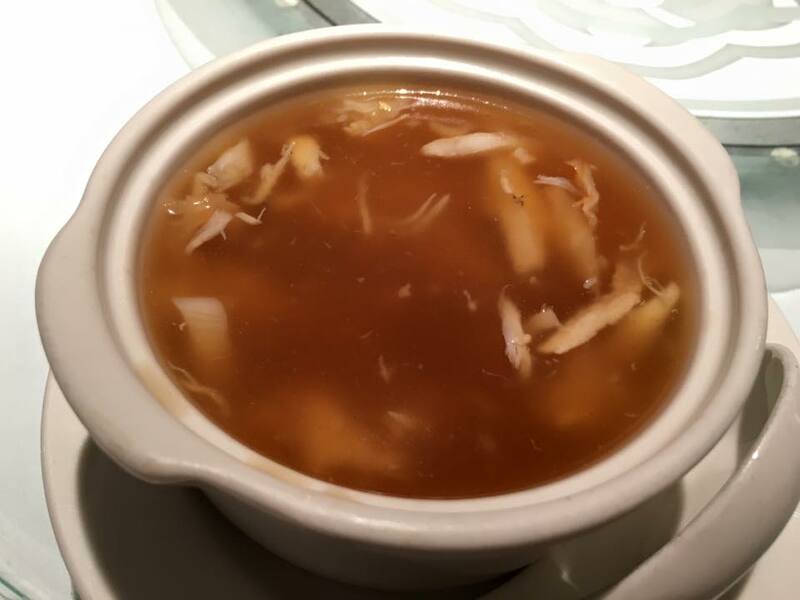 the crabmeat fishmaw soup 蟹肉花胶羹 was excellent! 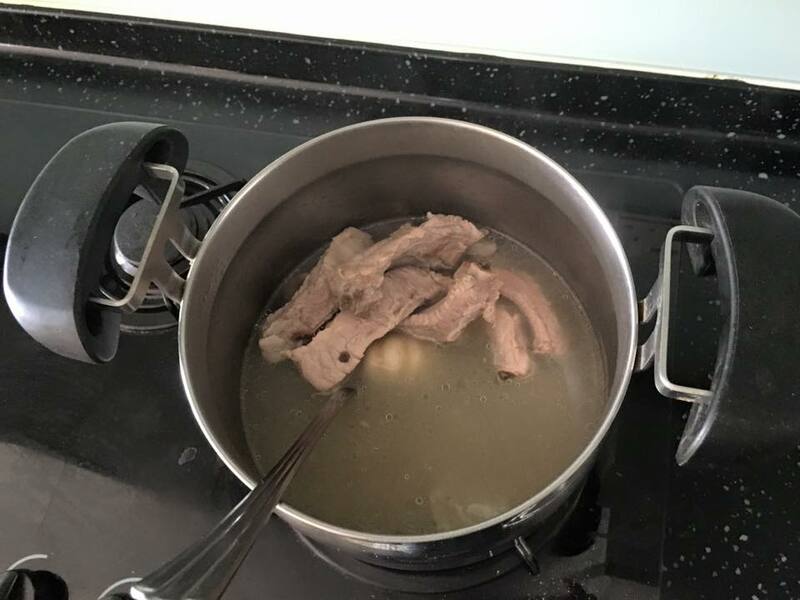 really tasty soup. 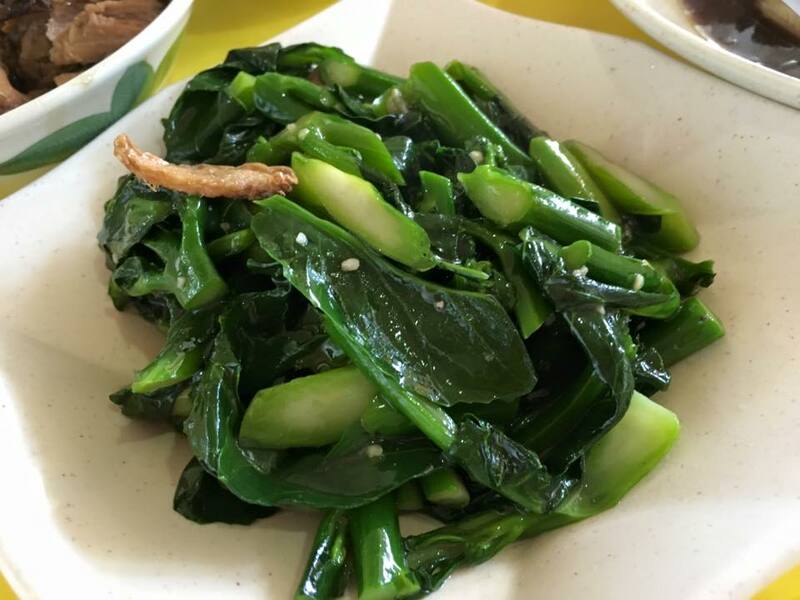 it was a good serving, though the 花胶was not a whole piece but chopped up. 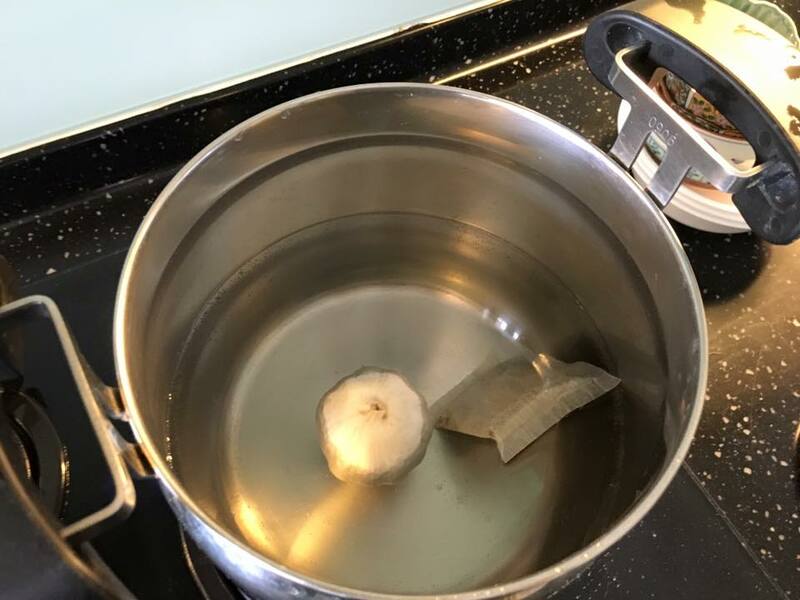 the key to a good soup is the stock base, and this one was par excellence! 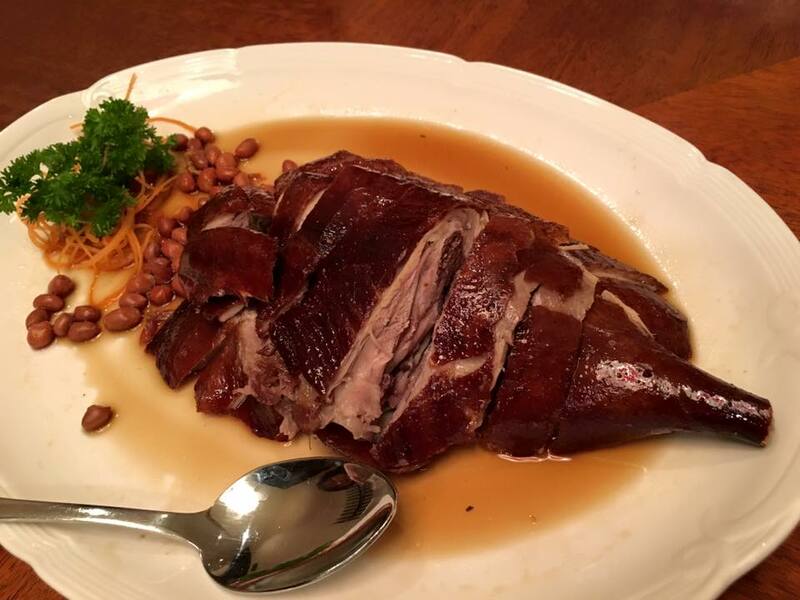 the tea camphor duck was also very flavourful. 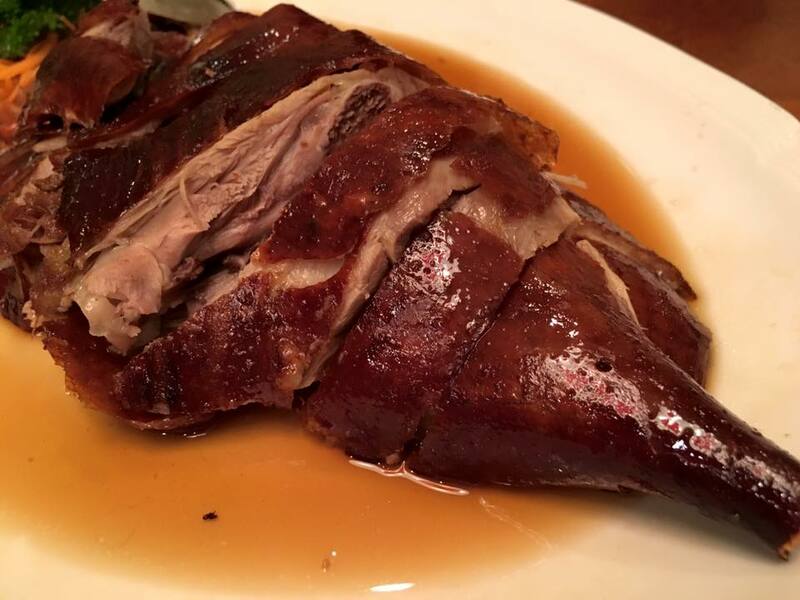 excellent duck, though the wrap was so-so. skin was so crispy & flavourful. 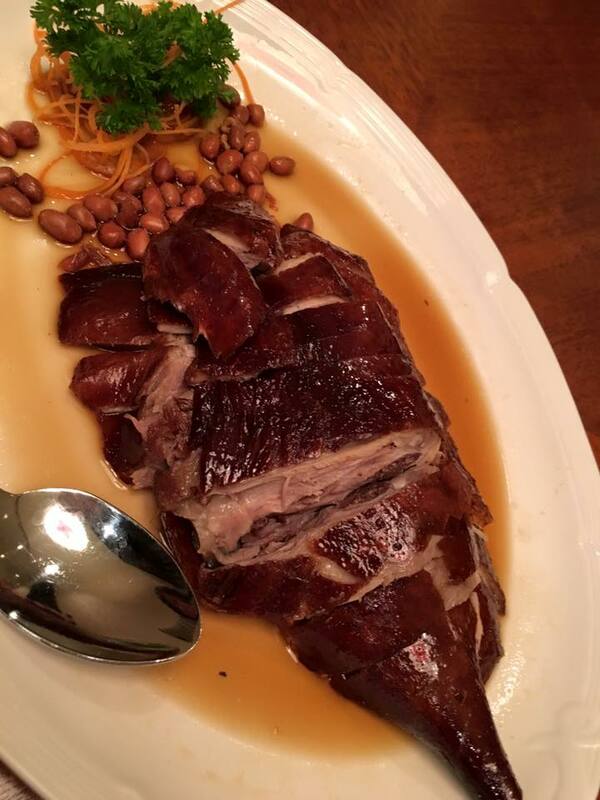 and the duck was very tender & moist. one of the best! 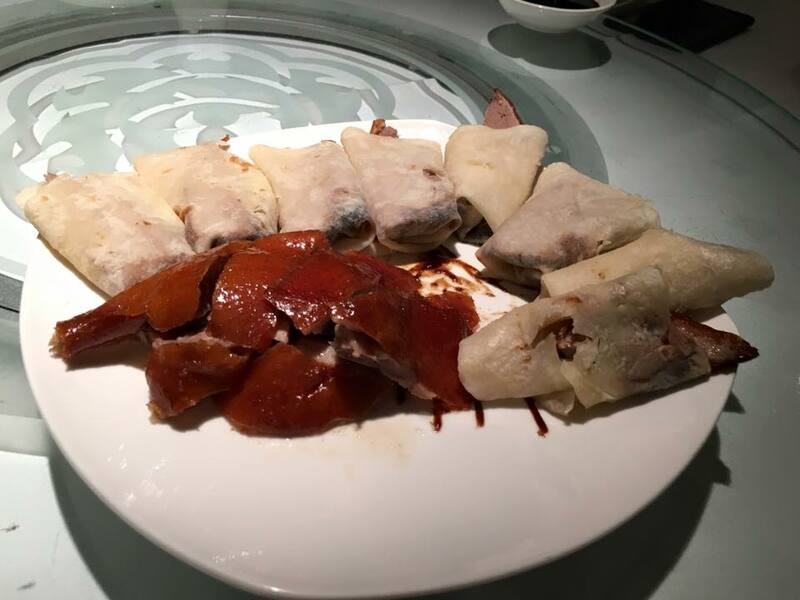 may not be better than the equally wonderful tasting tea infused roast duck at xin cuisine i had recently on 1.10.2015.
texture & taste almost like cod. 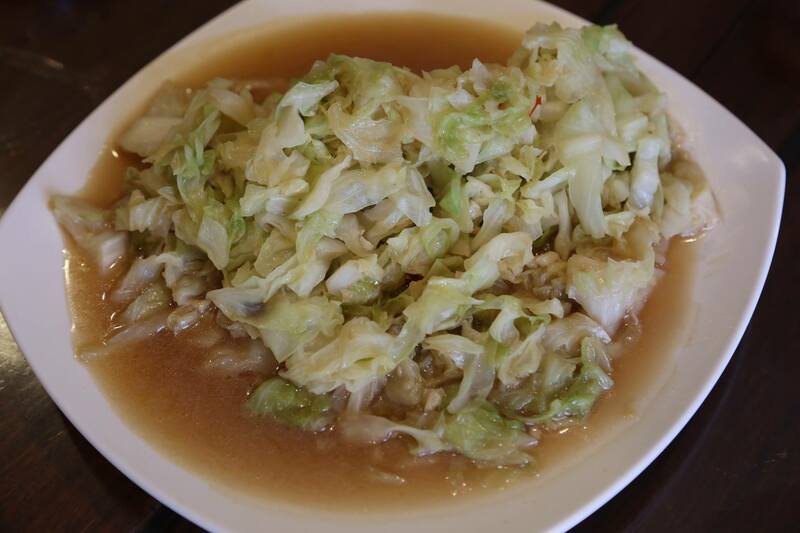 we wanted to order some 锅巴dish. 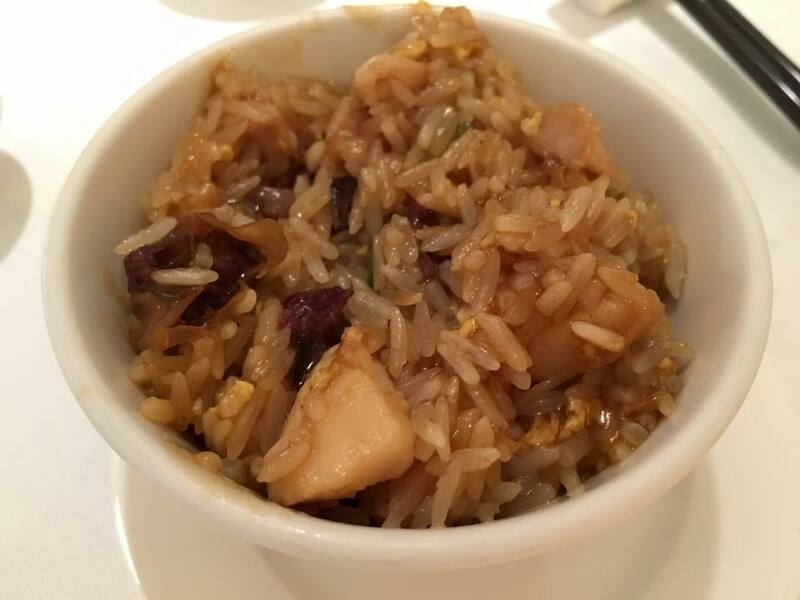 the server recommended this popular dried scallop seafood stonepot rice so we had that instead. it was good! 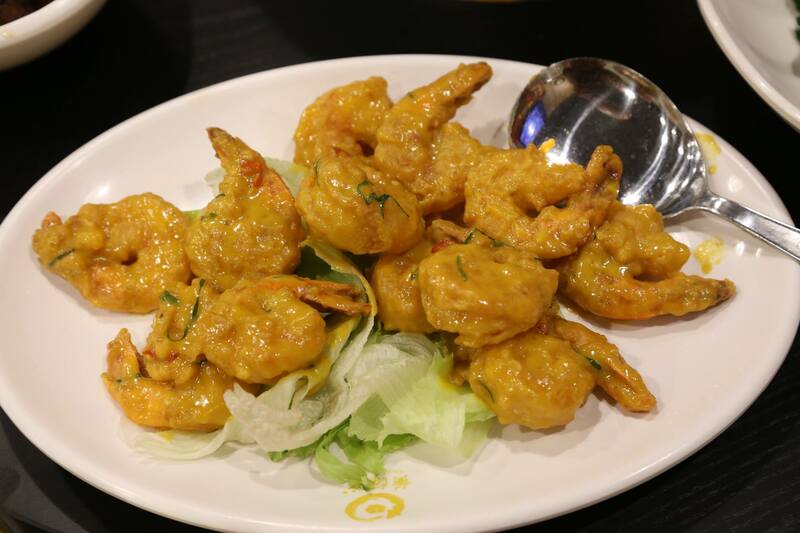 very flavourful & chokeful of ingredients. 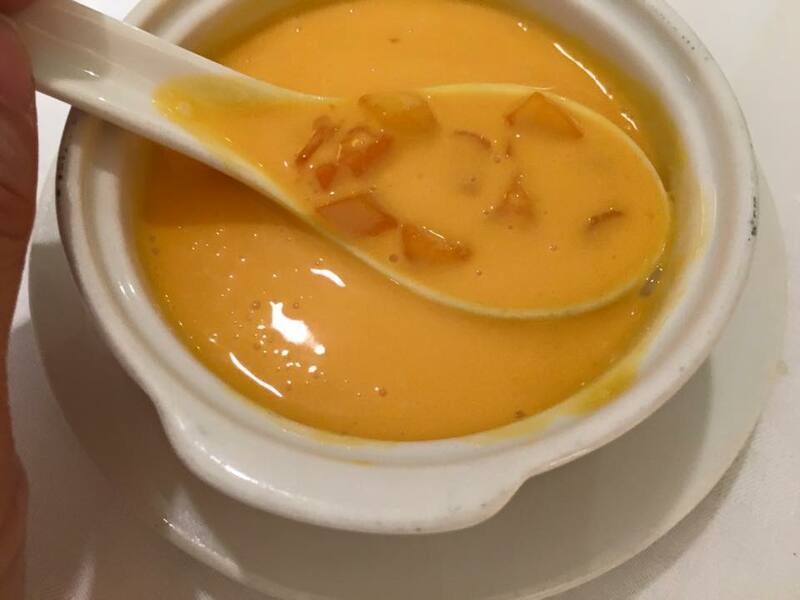 the mango sago杨支甘露 was refreshing, good dessert to have though it was just average. our birthday girl makes a better one actually. haha! overall, a very good set. the ingredients may not be a good as some of the special promotion set at majestic or tunglok or at xin cuisine, but the cooking was very fine & delivered great tasting dishes. 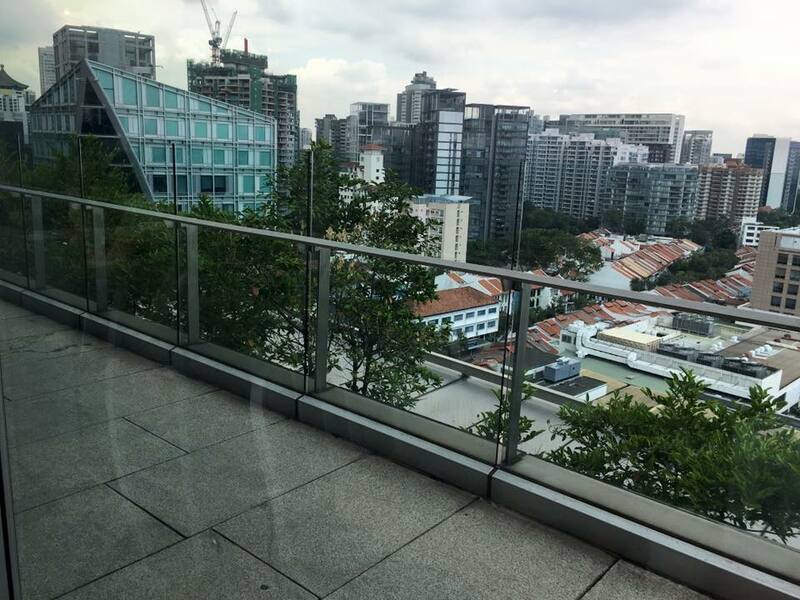 the only horrendous thing was that i paid S$22.50 for parking & my friend S$20, no carpark redemption. never ever going to park at goodwood park! 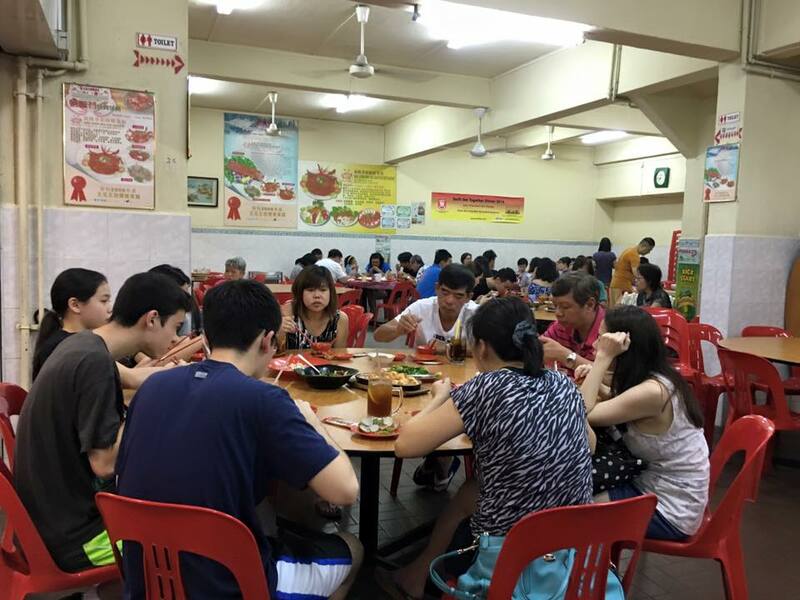 had some teochew muay lunch with friends at ye shanghai recently. 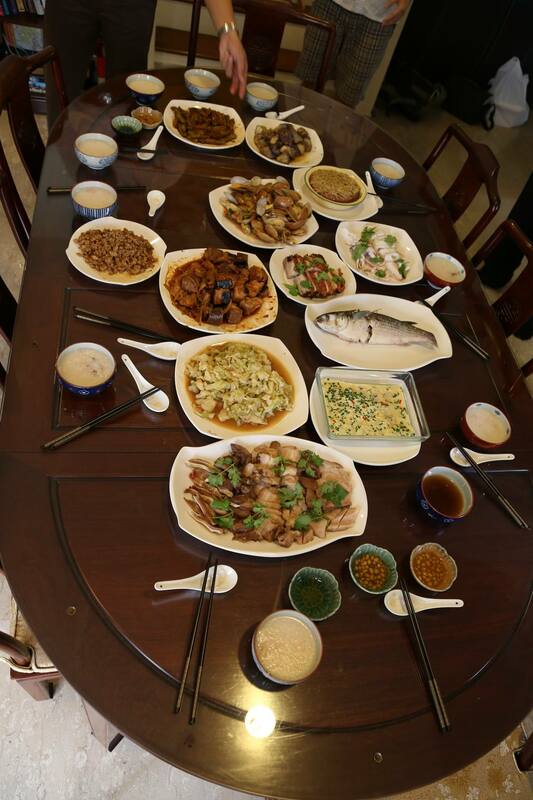 many dishes like braised belly pork etc, salted fish minced pork 咸鱼饼, chilled fish (eg mullet) i can already make. 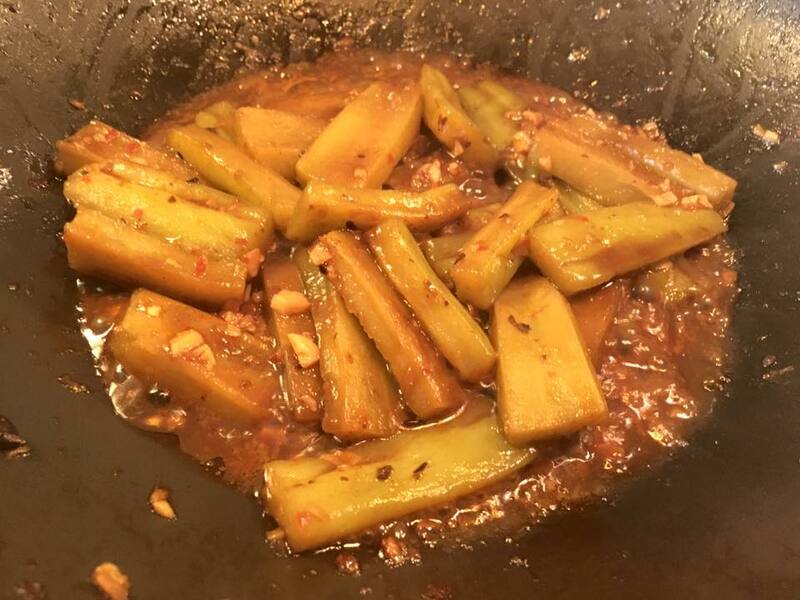 was thinking to recreate other dishes like the spicy stir-fry eggplants, stir-fry bittergourd, & the chilli sting ray dishes. 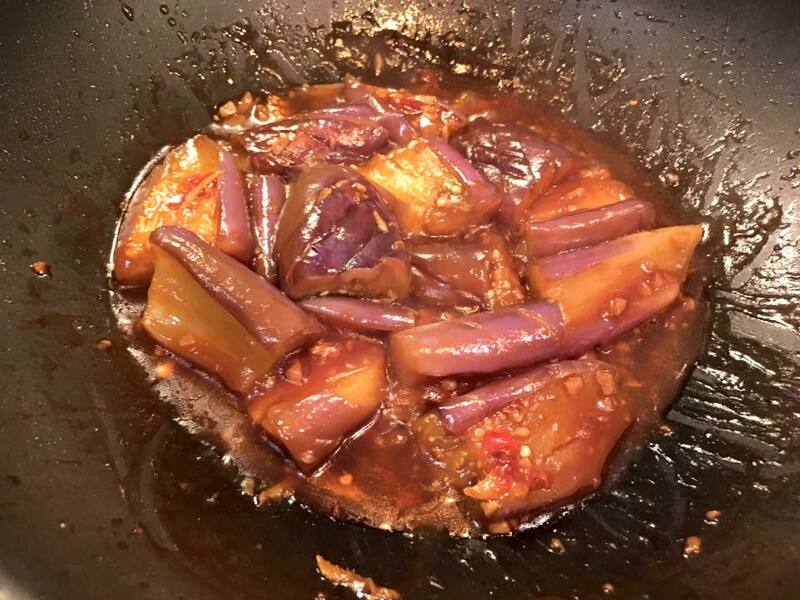 for this evening on 12.10.2015, i tried the spicy stir-fry eggplants. 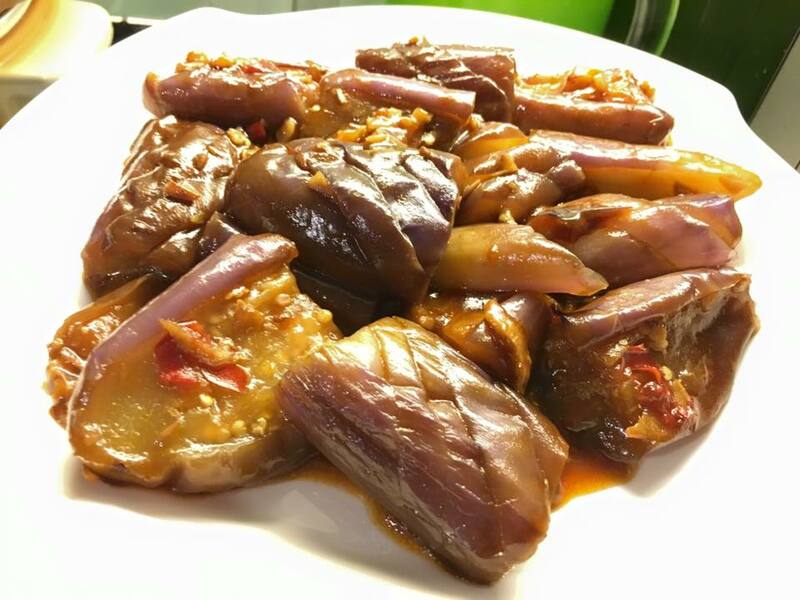 cut 2 eggplants in halves, sliced diagonally then cut each halves into 4 pieces. 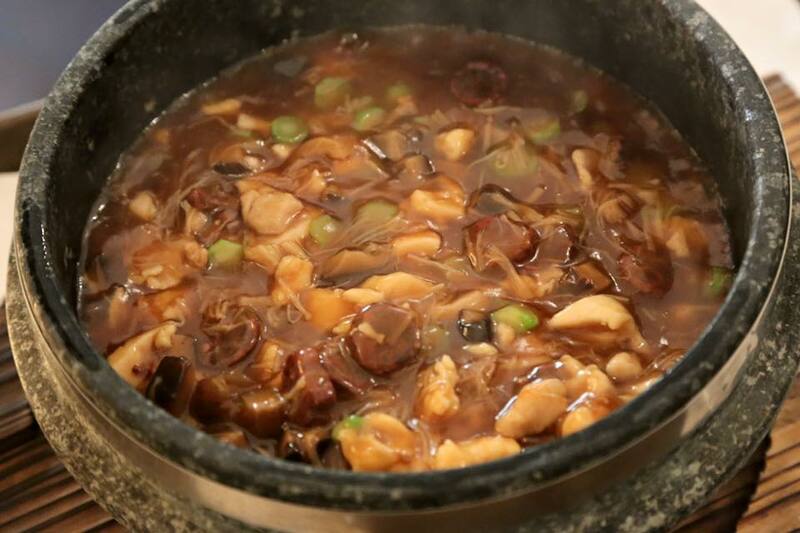 add 1 tbsp oyster sauce 1/2tbsp tomato sauce & 1 tsp fish sauce & 1cup water, add to pan, cover & reduce. & that’s all there is to it, about 10 to 15mins. 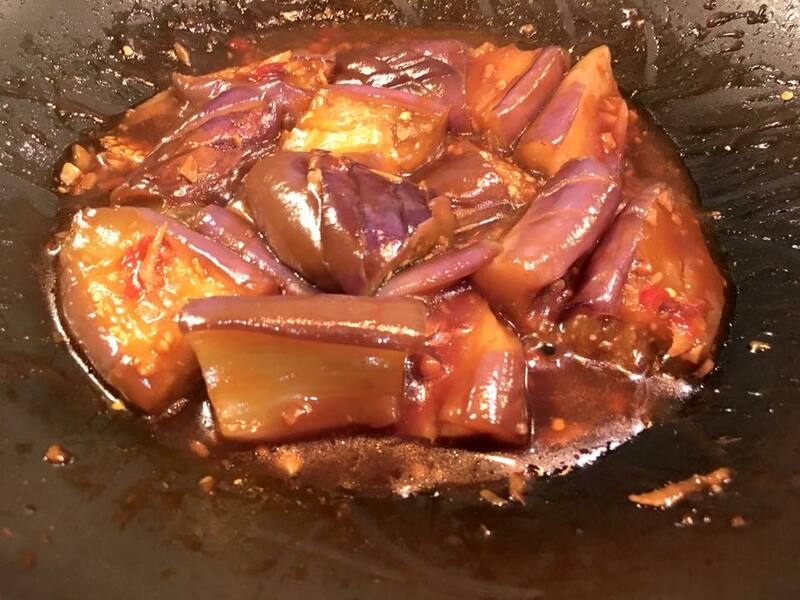 the diagonal cuts also allowed the eggplants to absorb the sauce fully & well infused. the sauce though was not quite the flavour i was looking for. i will drop the tomato sauce the next time. 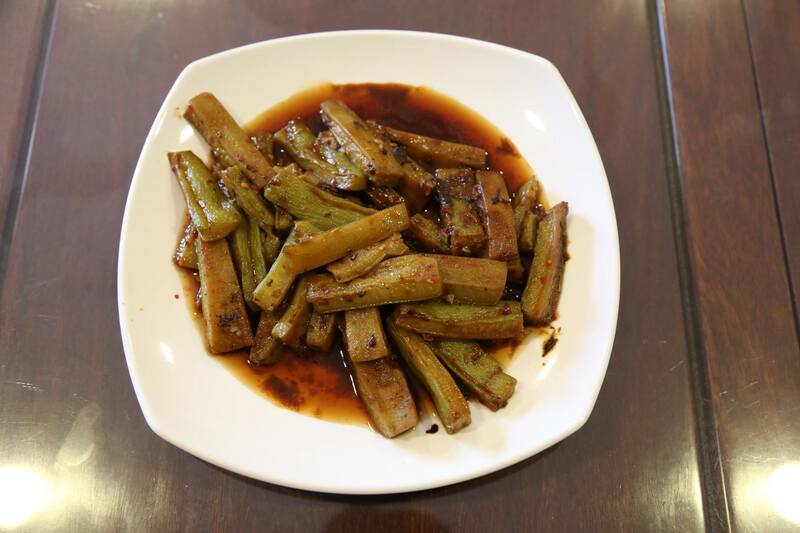 maybe use light soy sauce with oyster sauce. 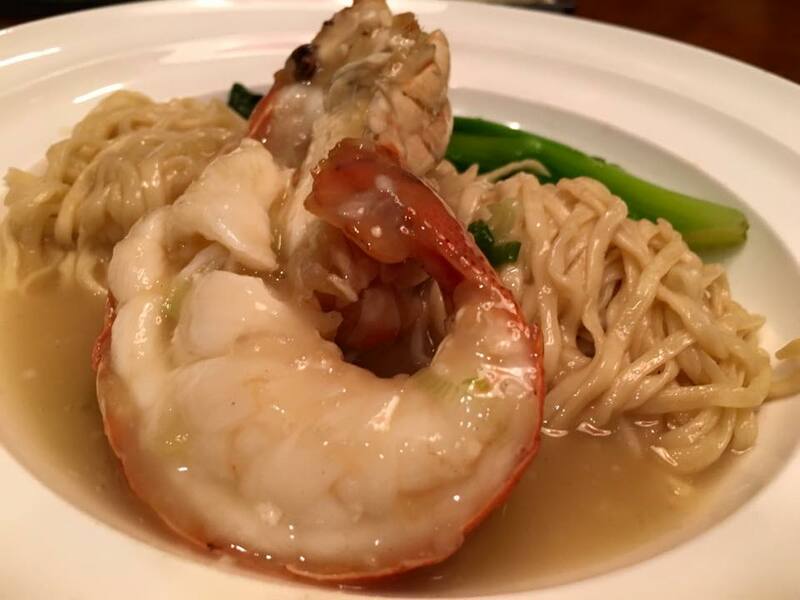 alan (my very good friend’s brother) & his wife invited us over for homecooked dinner on 9.10.2015.
alan & his wife & another partner, started “why eat har” big prawn noodle stall in mar2015. 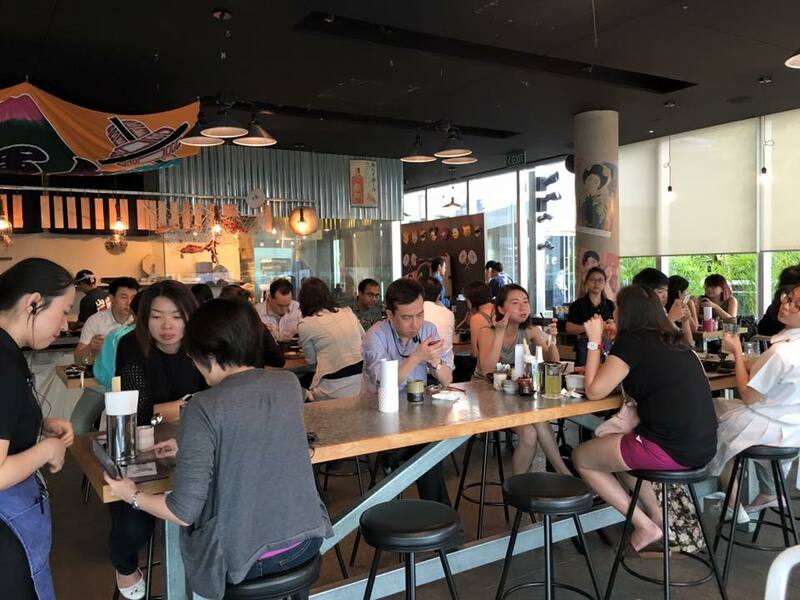 after eating at “why eat har” many times liao, we all agreed that it is undisputably among the top 3 in singapore, and it all depends on one’s personal preference which is the most preferred. 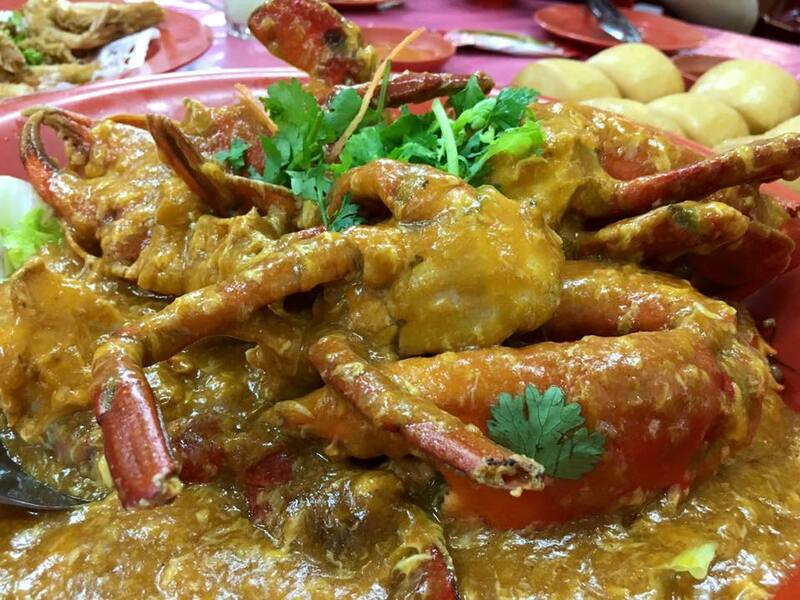 the chilli crab sauce had clear intense crab flavours, yet very smooth, delightful & lingering. alan & his wife said it was slightly dilute but actually we all liked it that way. 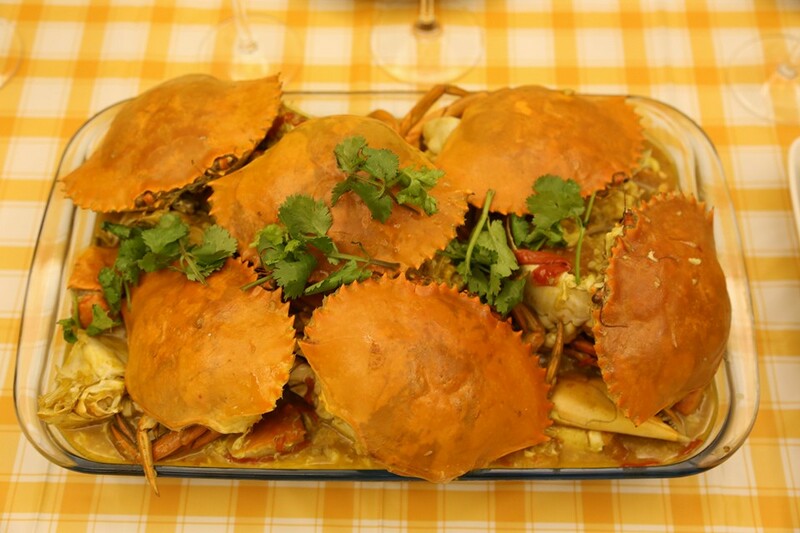 the crab was not very “solid” i guess that depended on the day/timing. 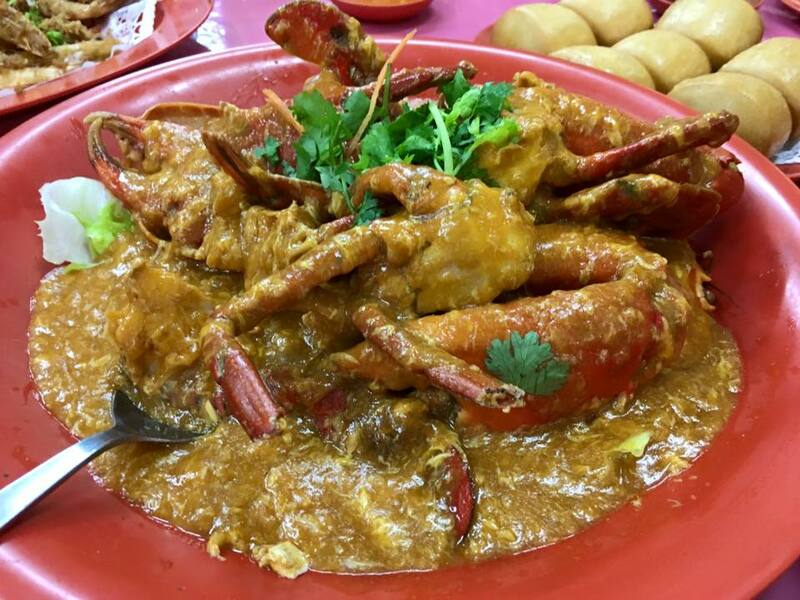 the body & the pincers were sweet & tasty. 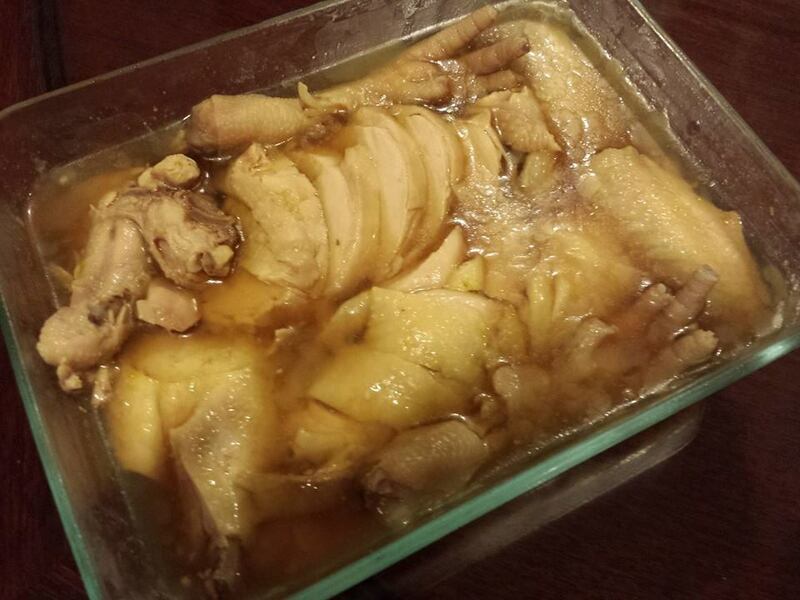 the drunken chicken* was good too. 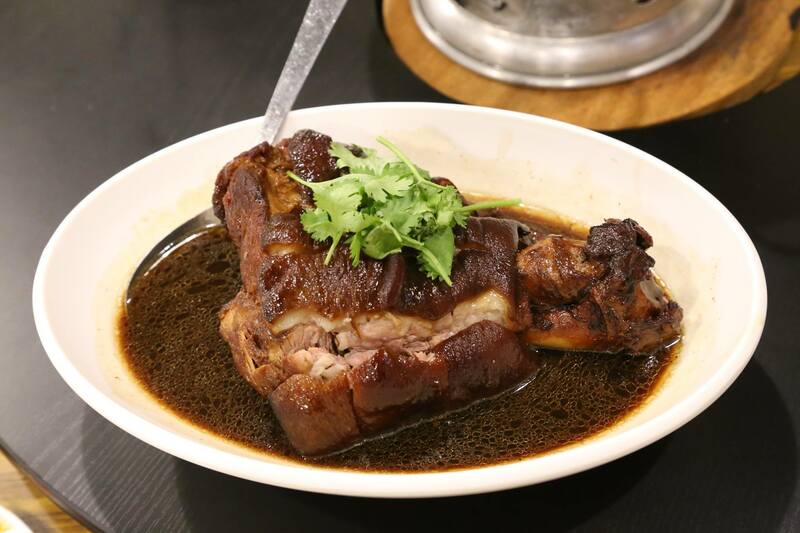 the 绍兴酒 was mild & fragrant, a very good flavouring to the sweet chicken. 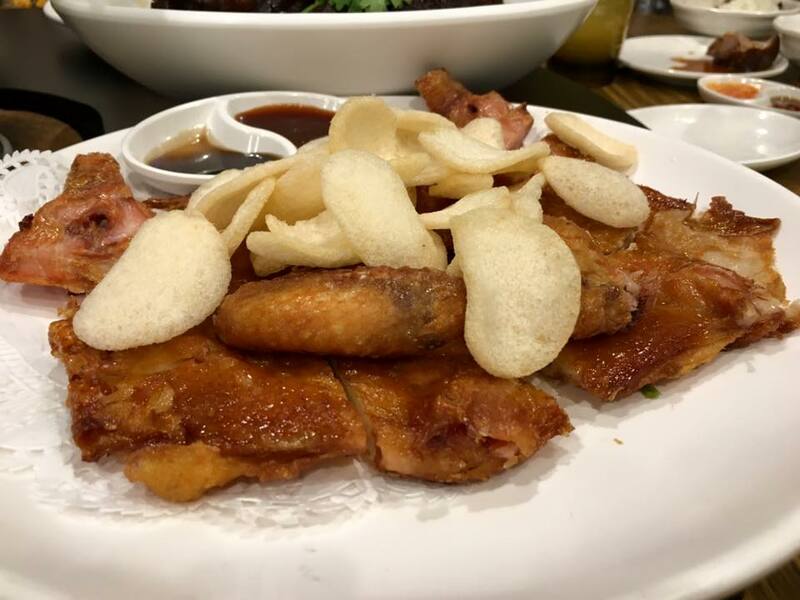 alan’s partner was saying alan’s roast chicken was even better, so we said we would all have to try that, surely, if it was better than this drunken chicken. 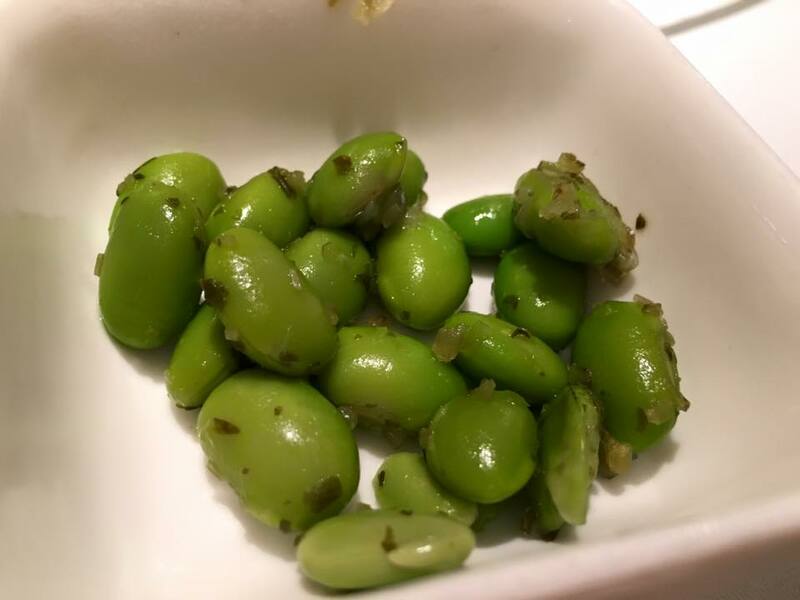 alan told me that the difference in his preparation for 白斩鸡 was that he did not add garlic. 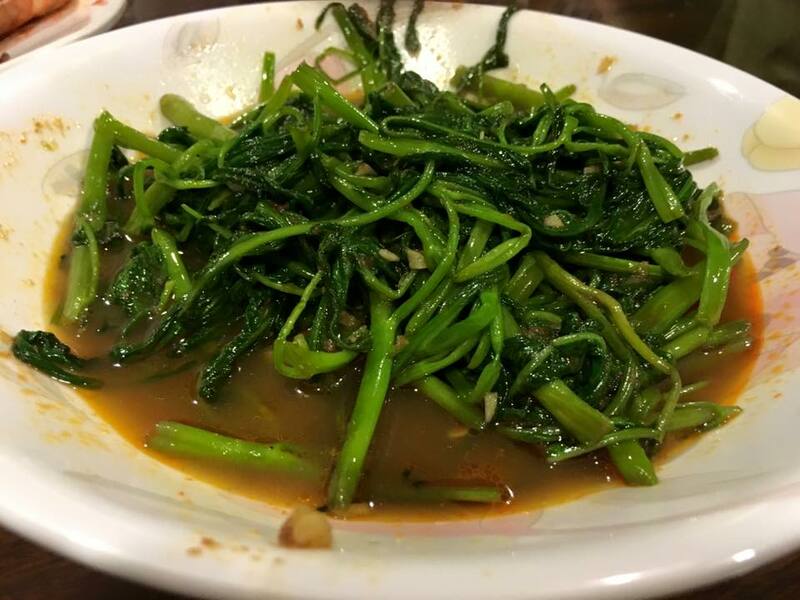 & i liked the salted fish minced pork咸鱼饼** a lot so i ate quite a bit. 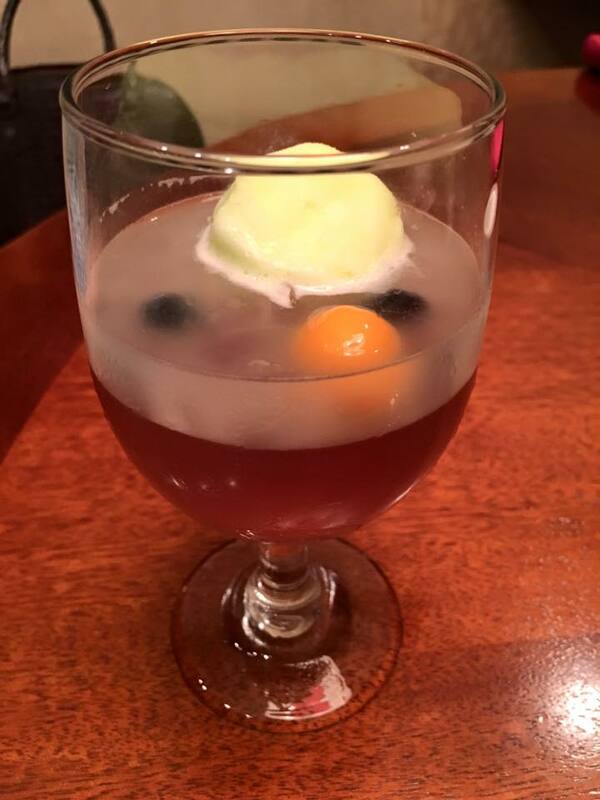 it was different from the style we made at home. 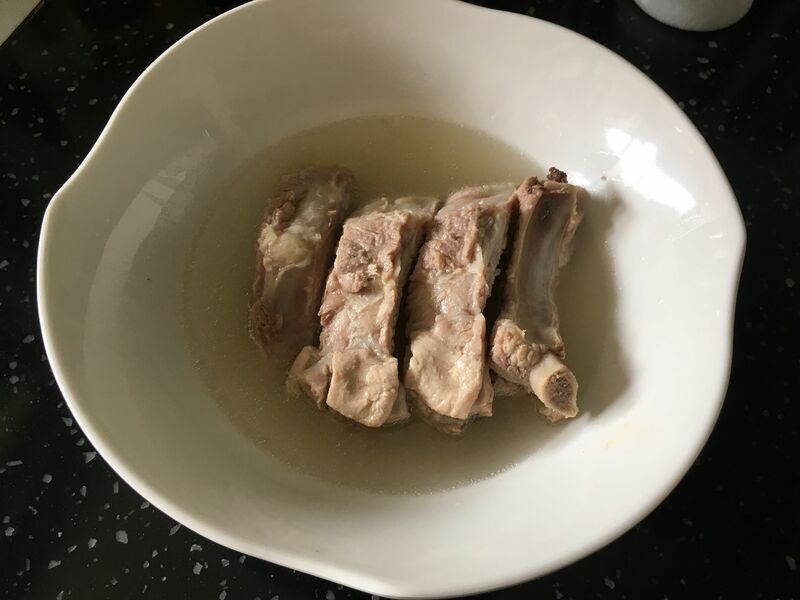 he minced the pork himself & had the fat in a bit chunky to give the bite. 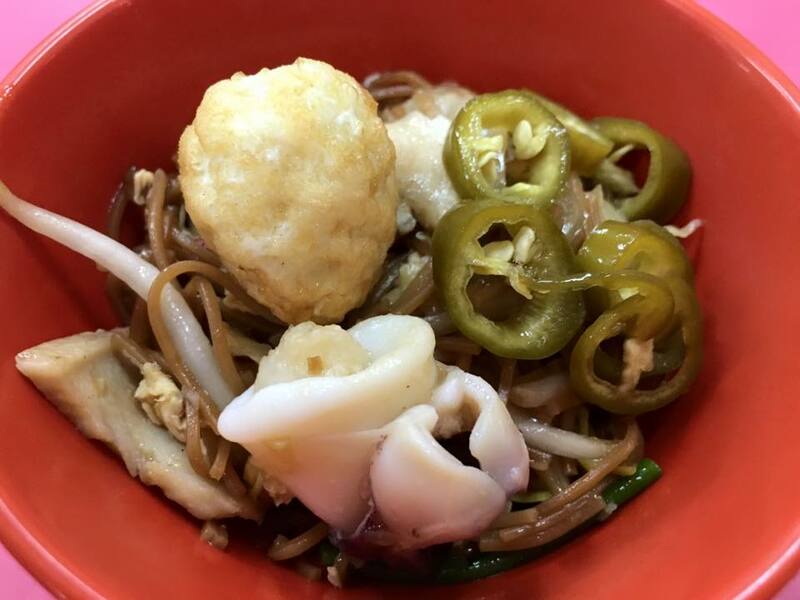 this style is the genuine one we get to eat at the good zi char stalls. 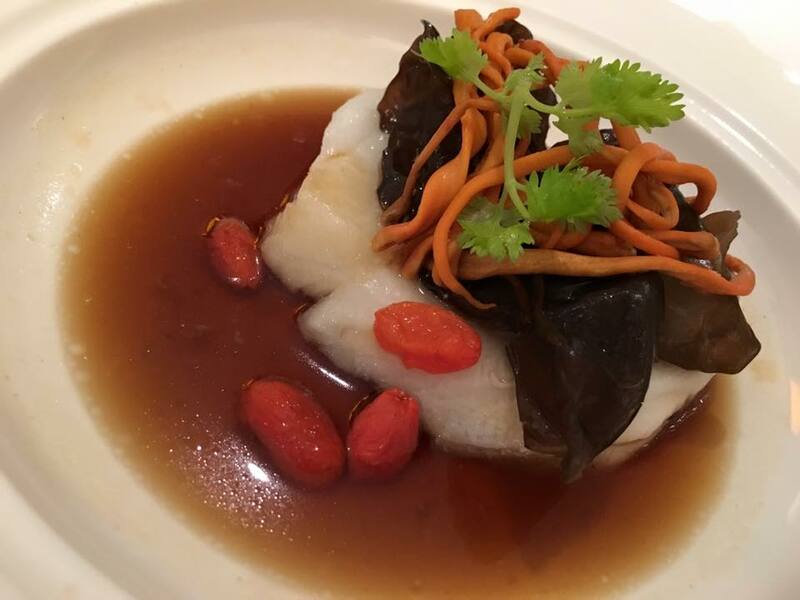 there was also teochew steamed red garoupa with salted vege & sour plum & sliced belly pork. 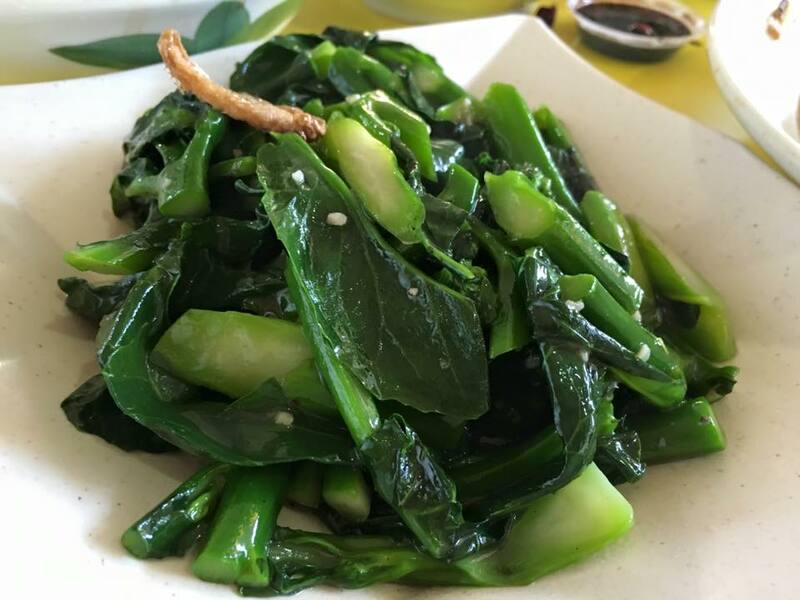 fried vege was simple dish but good. we forgot to eat the grapes another friend, our default grape supplier, brought. 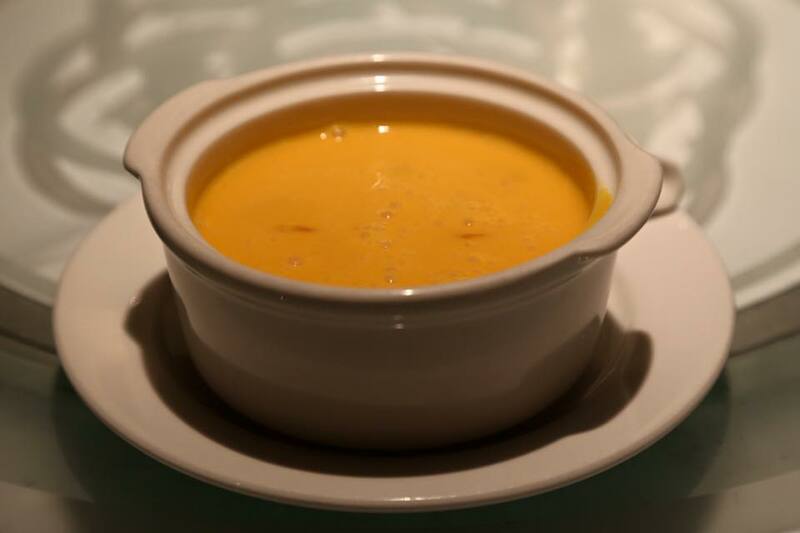 & alan’s wife made a refreshing mango sago dessert. 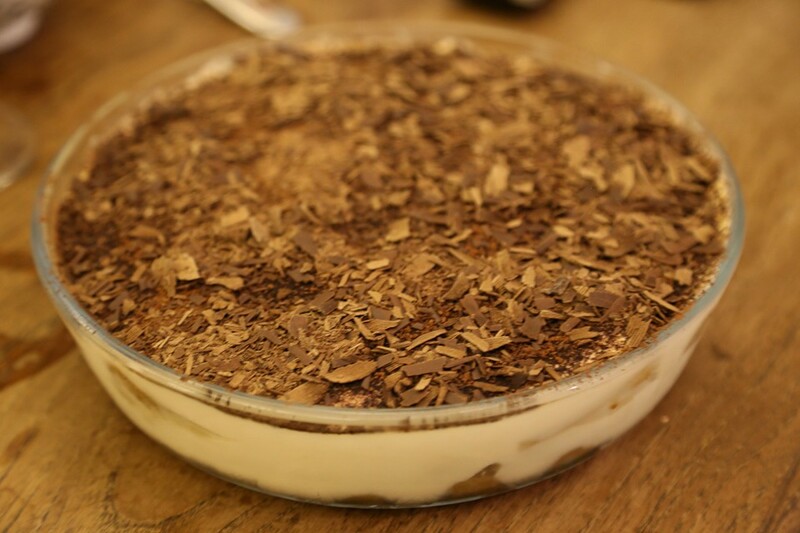 i brought my tiramisu. 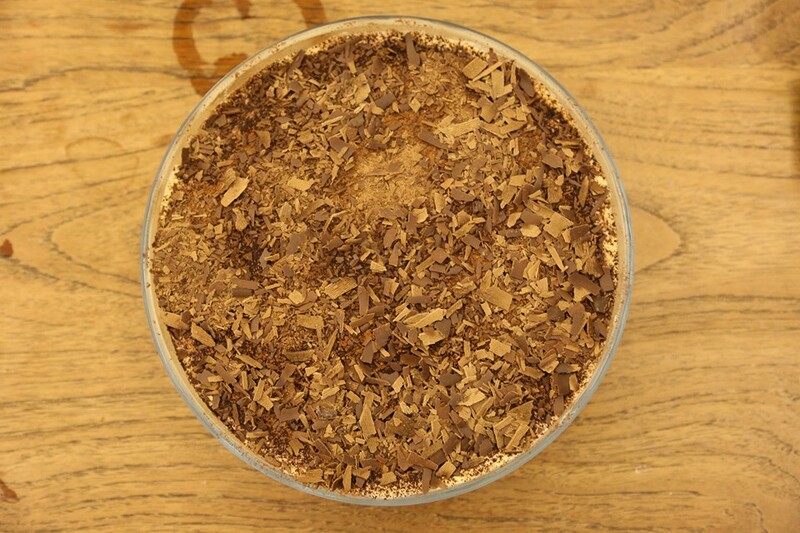 i added double the usual dosage of brandy (60ml instead of the usual 30ml). my friend loved it! 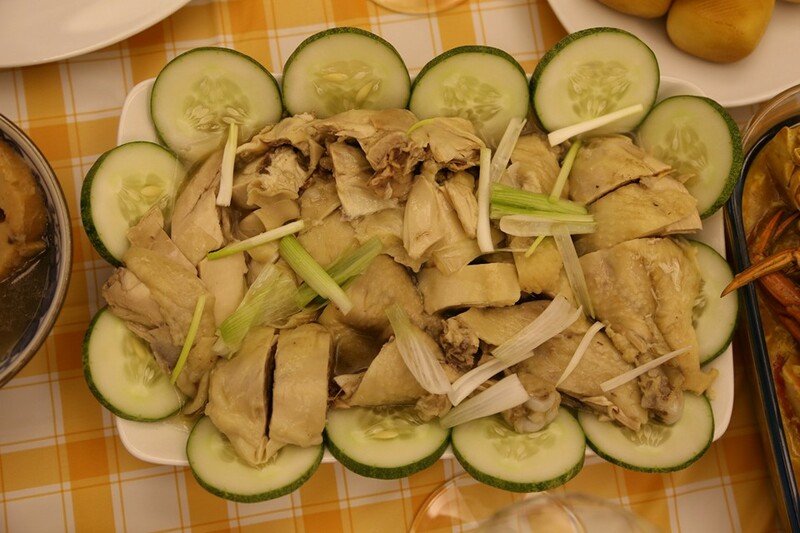 *my own drunken chicken not as good though i made a really awesome chicken rice chicken 白斩鸡. 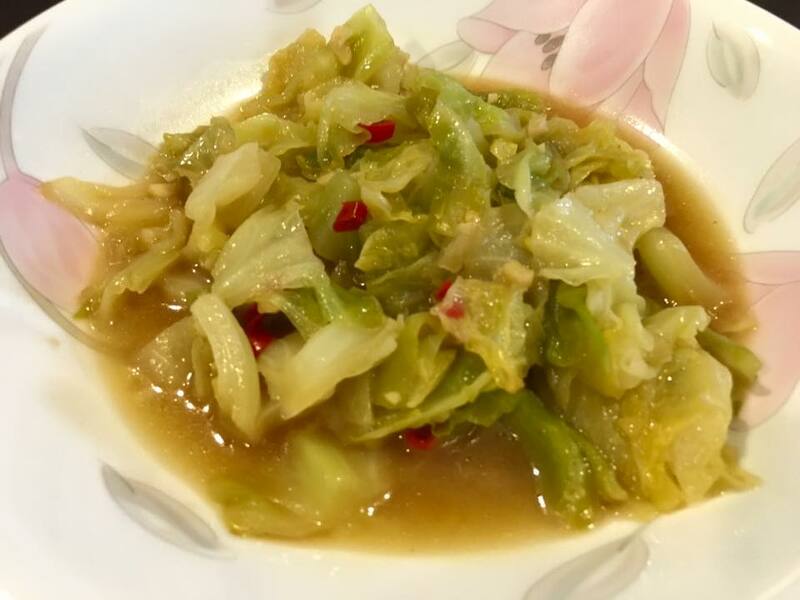 principally becos i used a very cheap S$1.80 绍兴酒..hehe..& my wine marinade is still experimental & need some tasting & improvement. 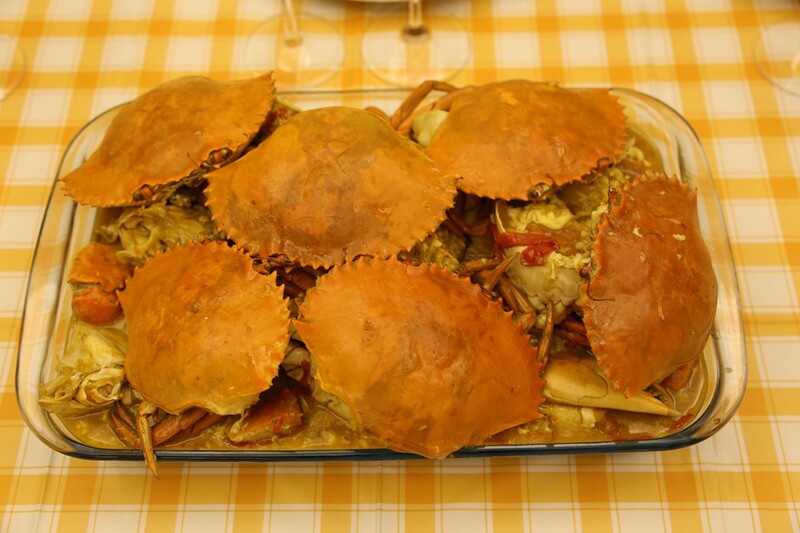 & i was telling my friends it’s time i start cooking crab!